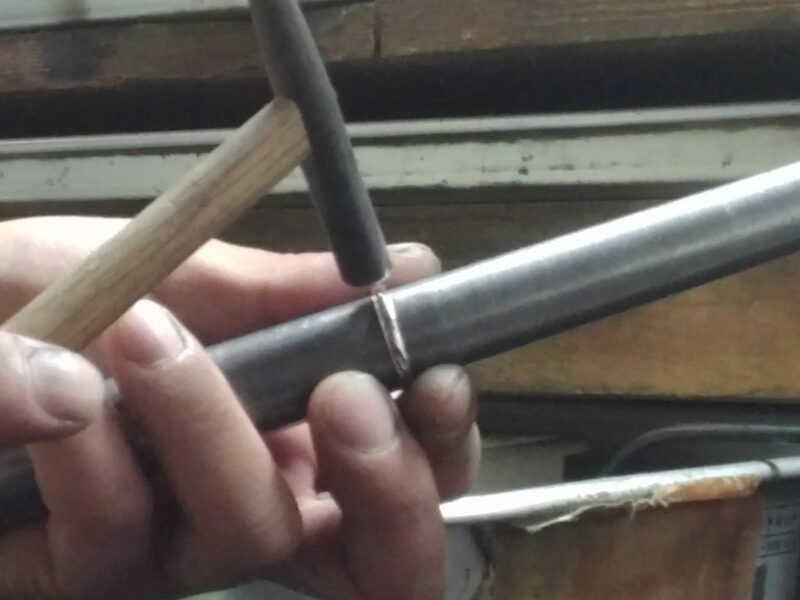 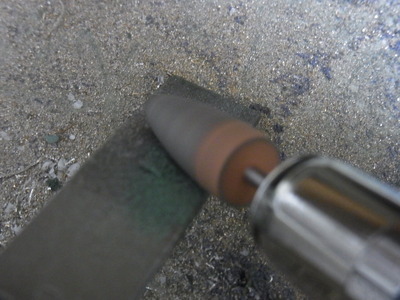 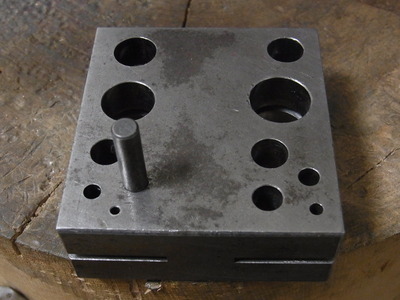 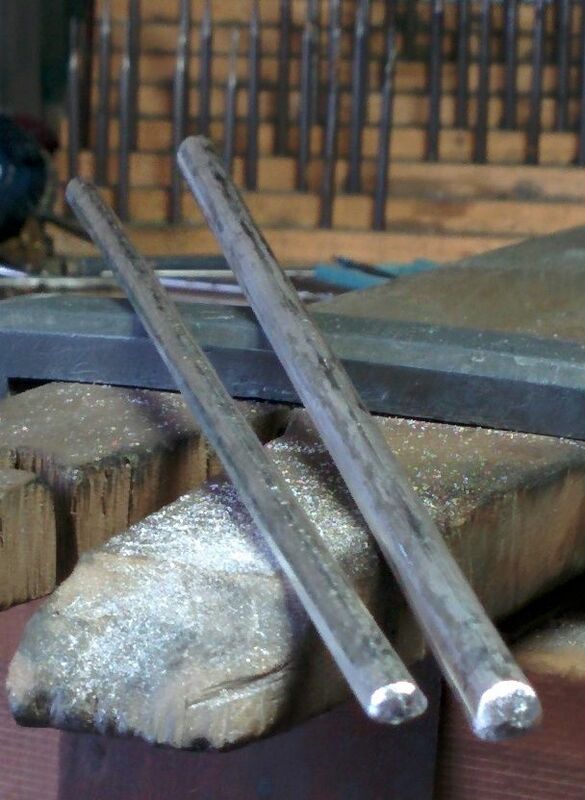 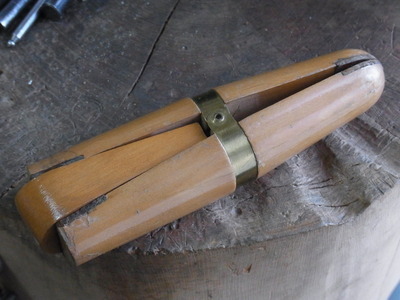 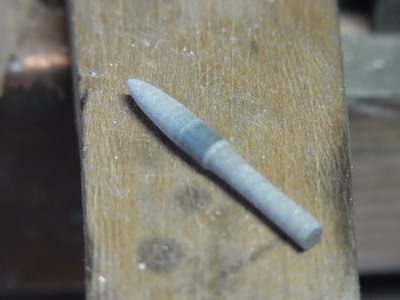 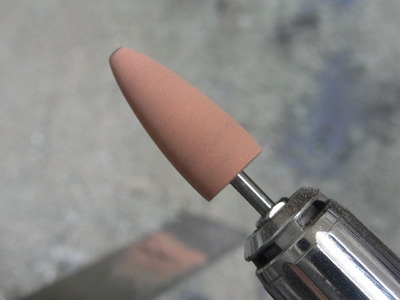 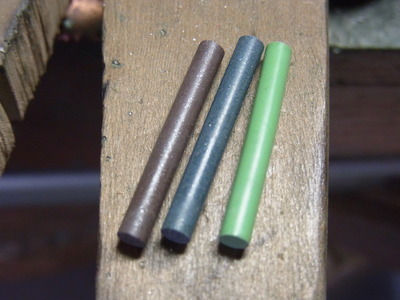 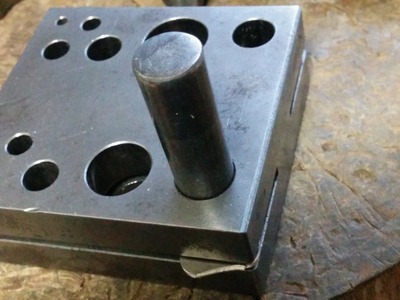 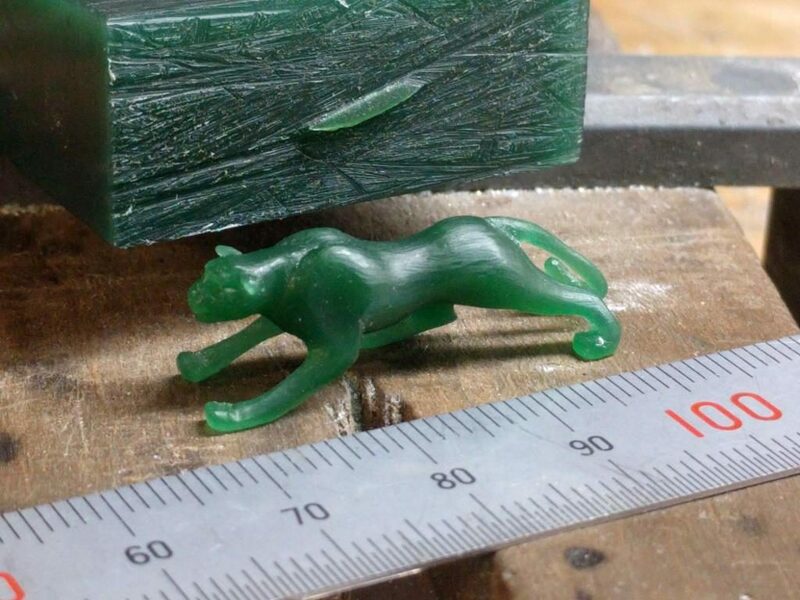 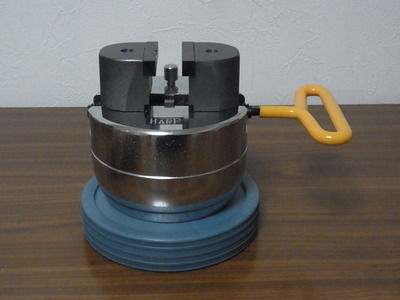 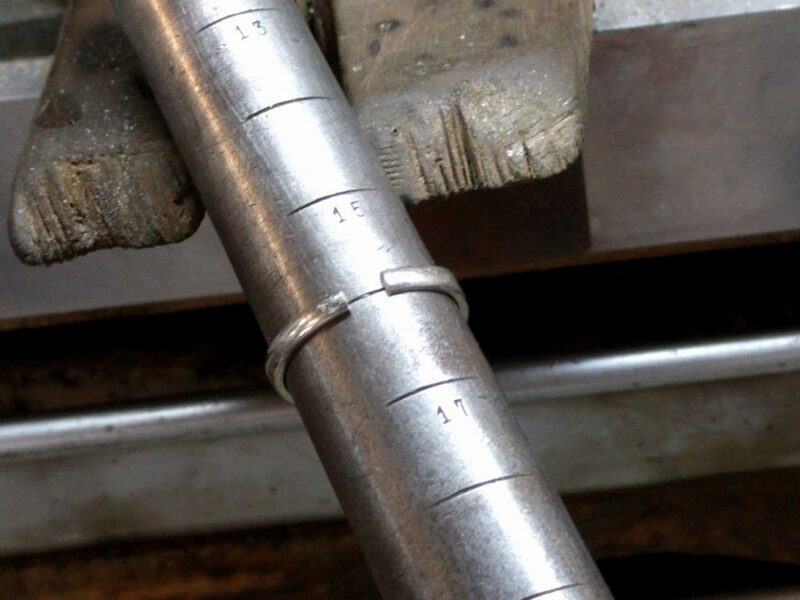 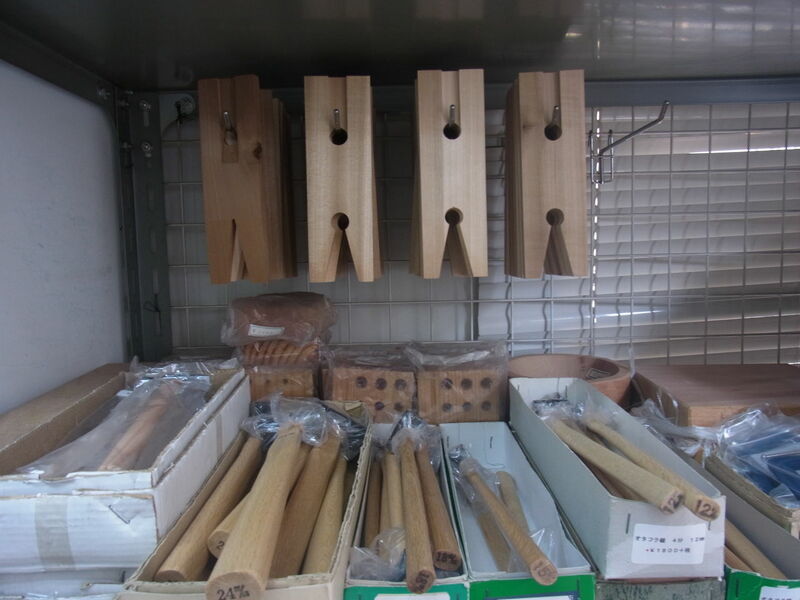 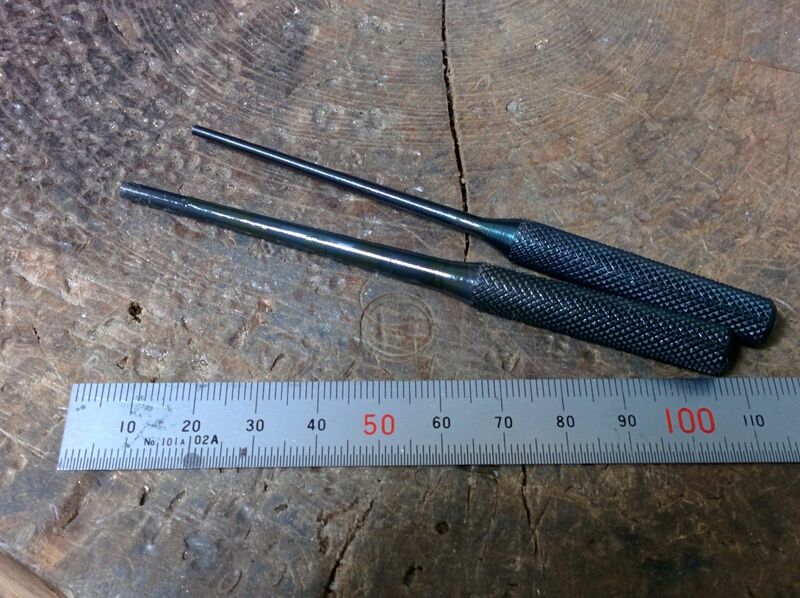 Fit size using ring mandrel . 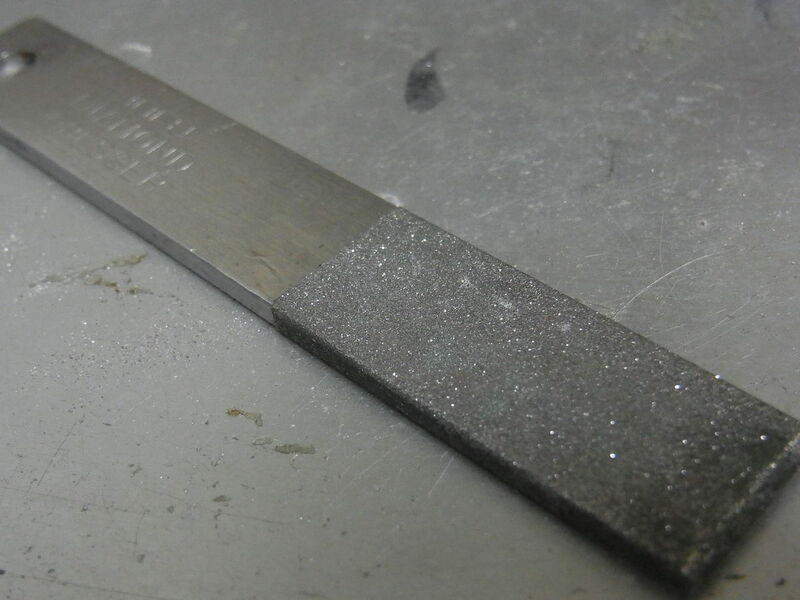 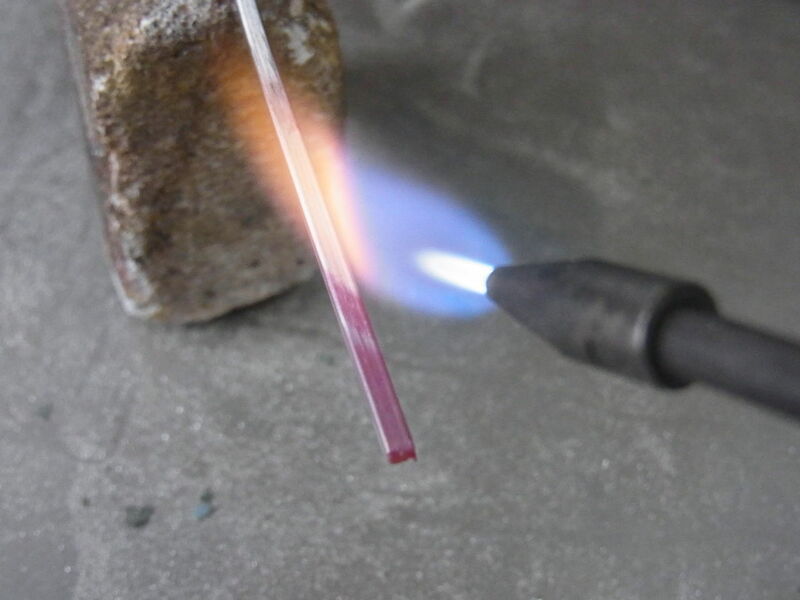 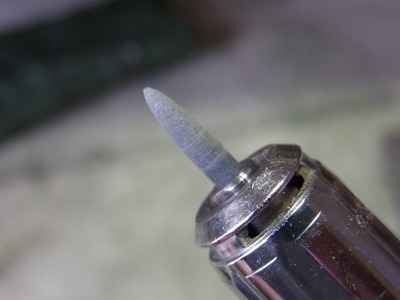 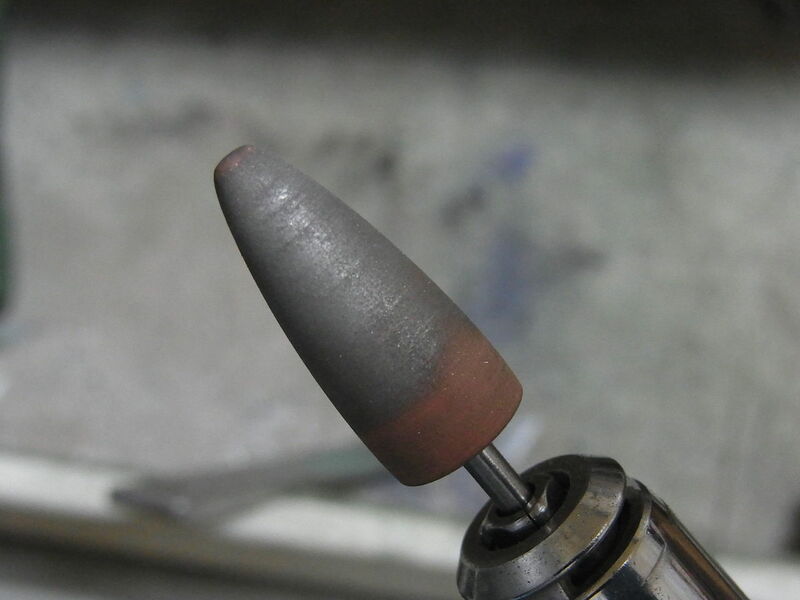 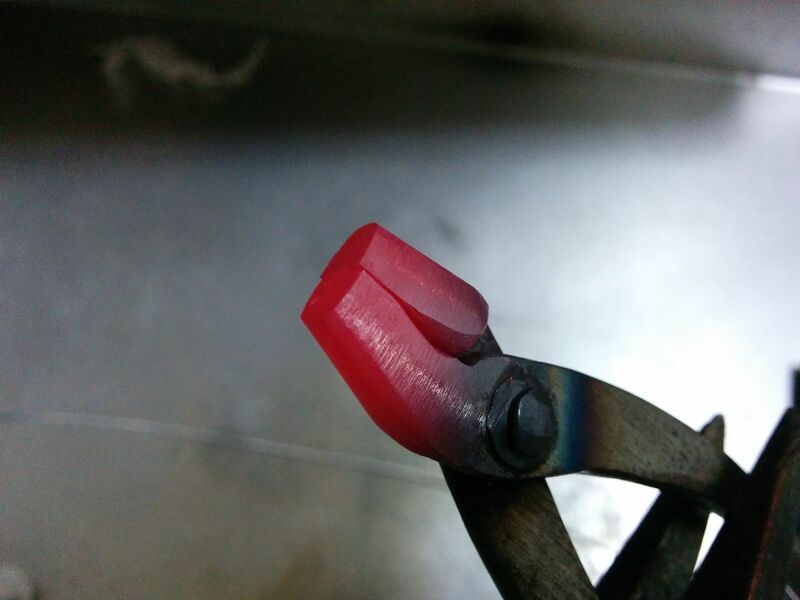 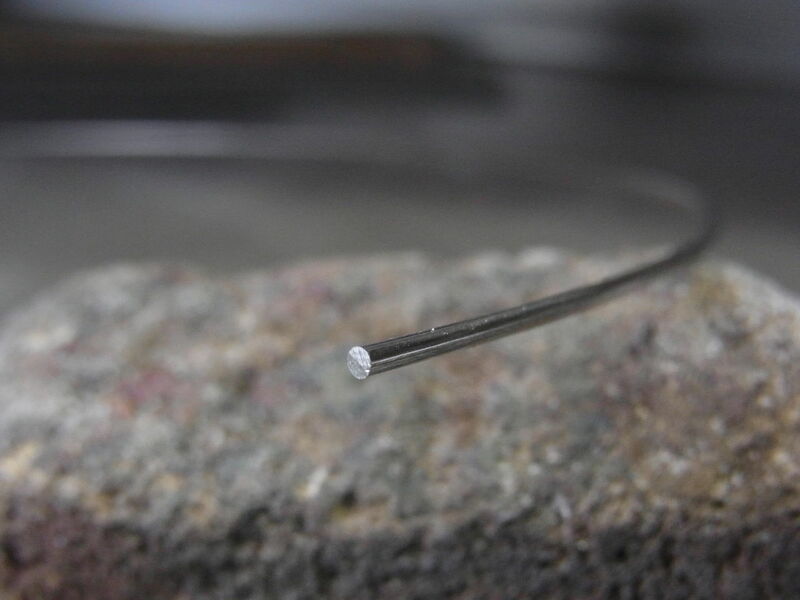 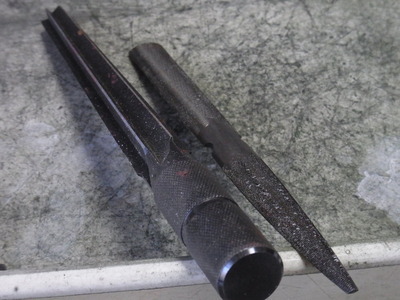 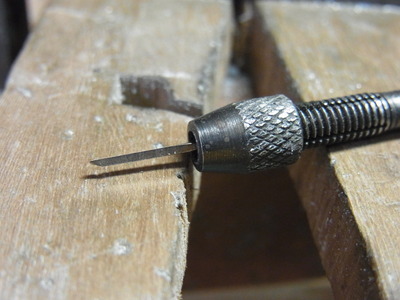 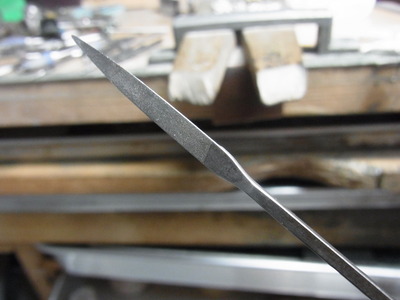 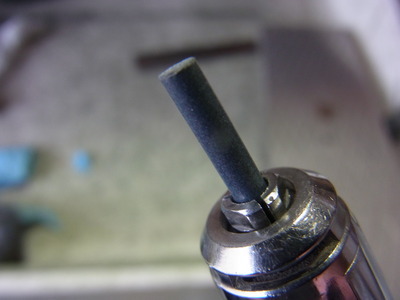 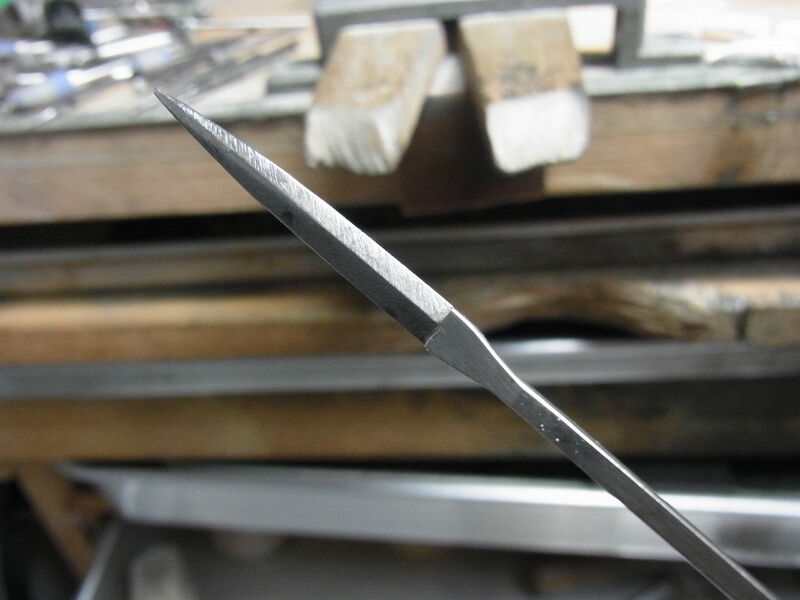 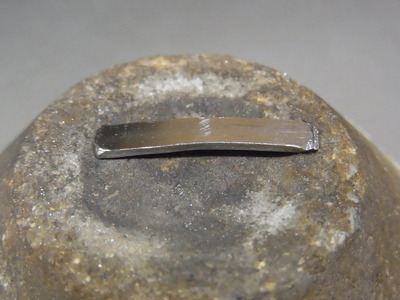 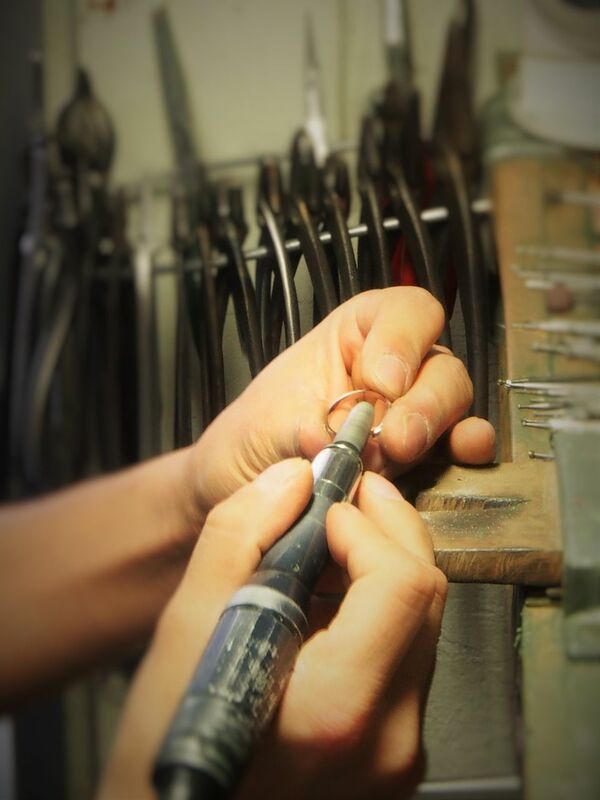 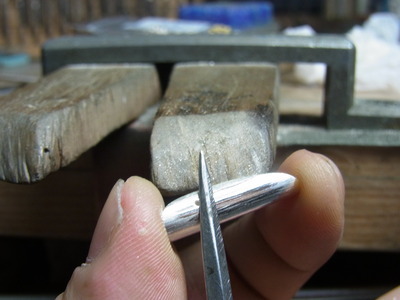 Insert platinum into base on the shank. 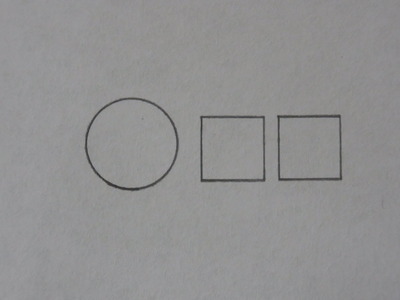 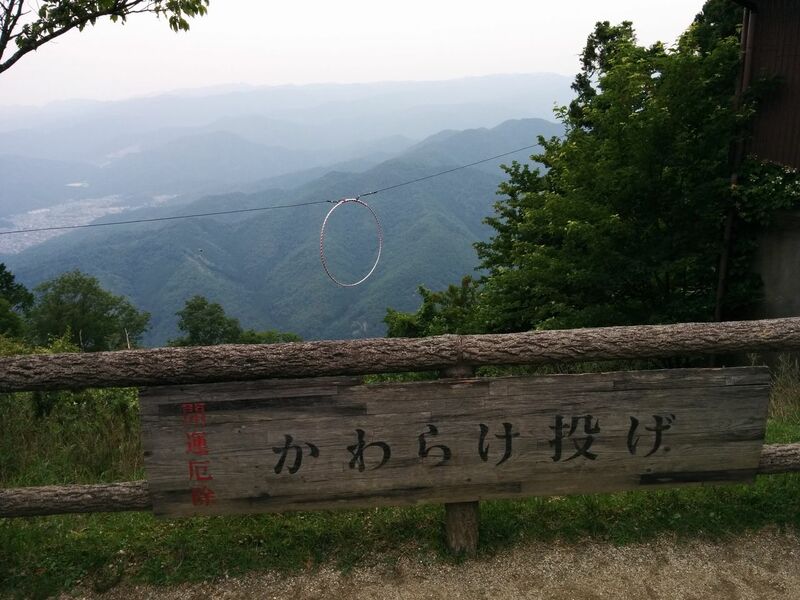 Shape the sahnk on the ring. 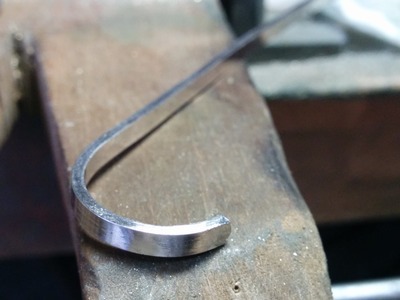 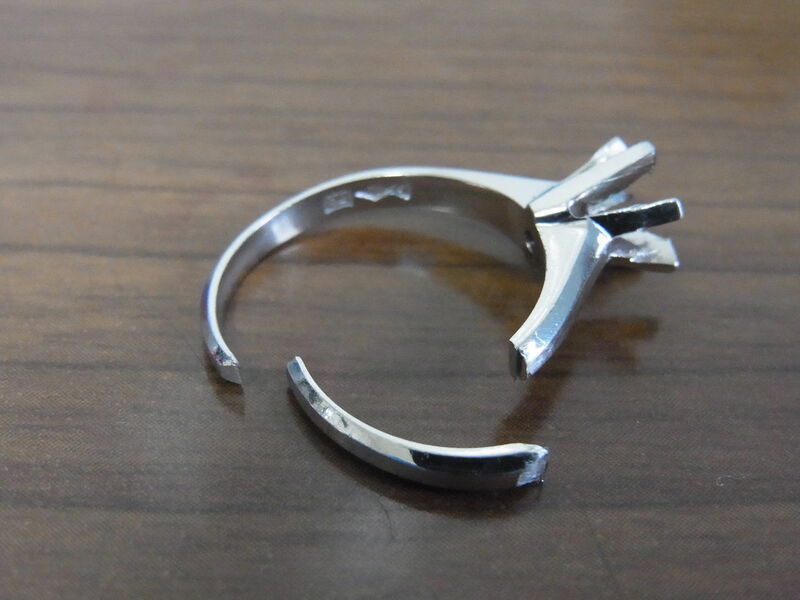 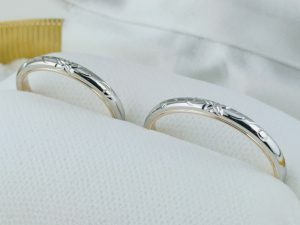 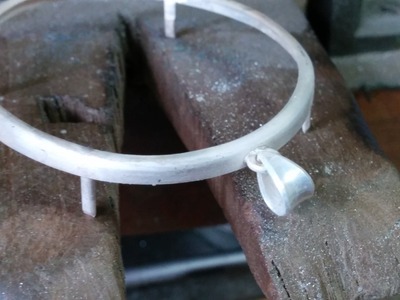 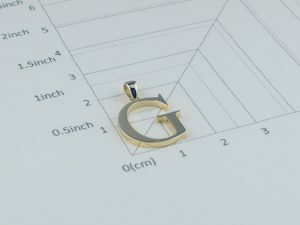 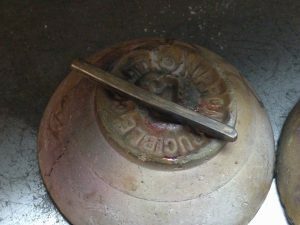 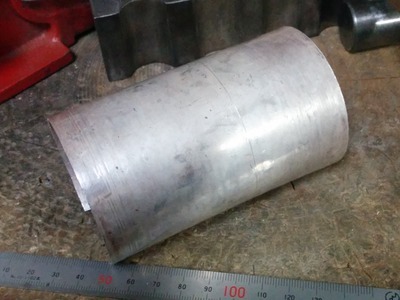 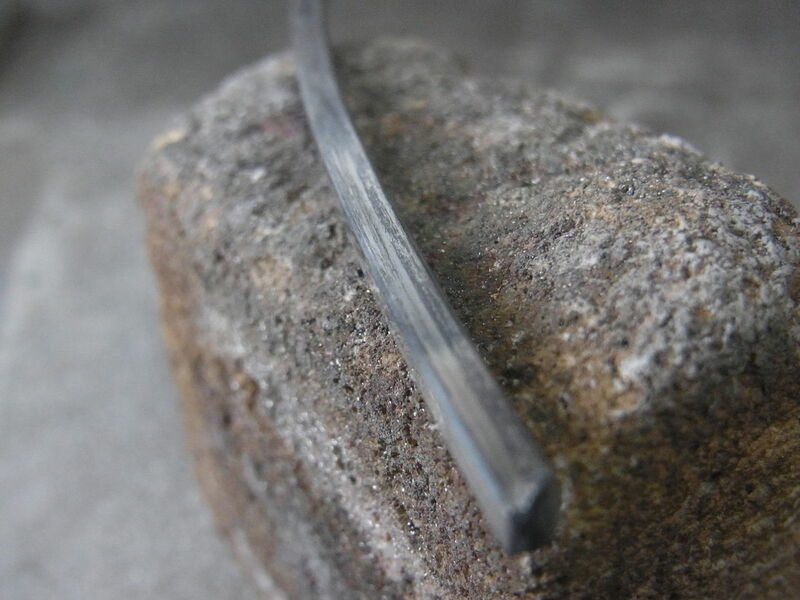 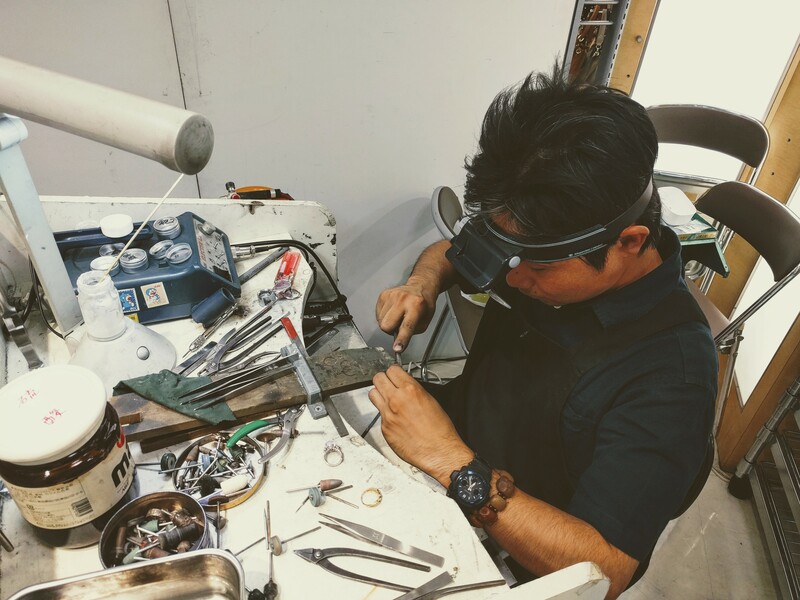 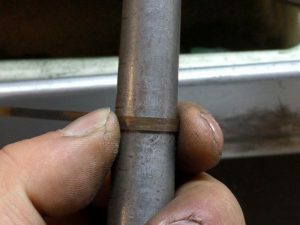 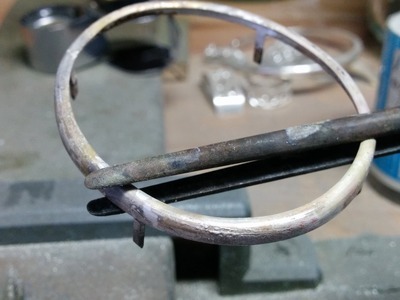 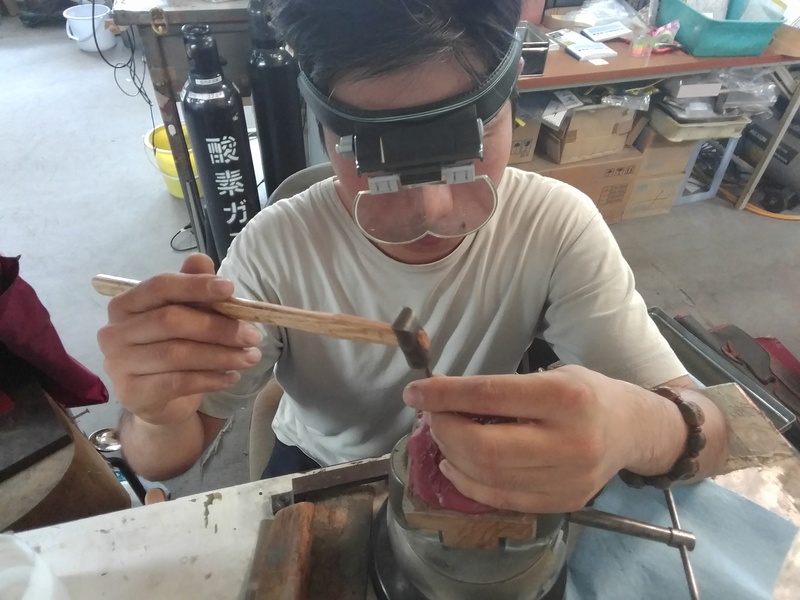 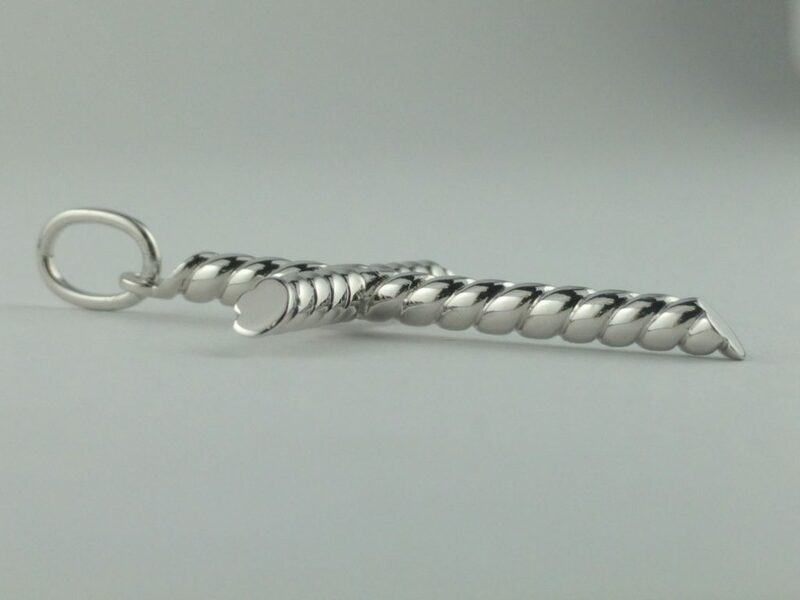 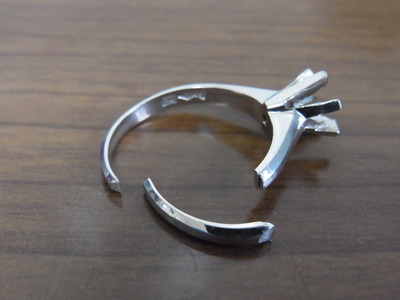 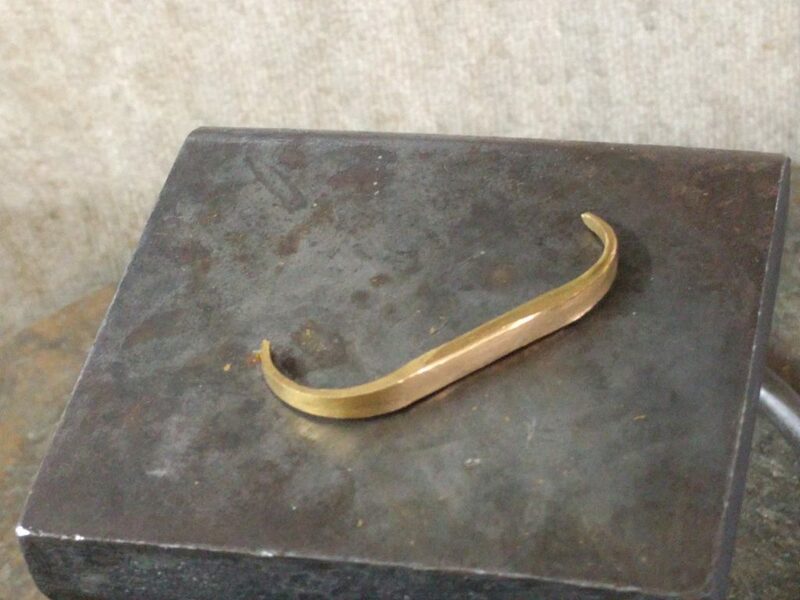 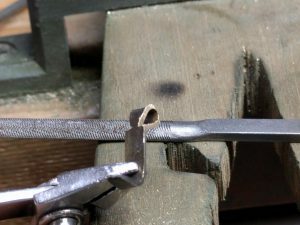 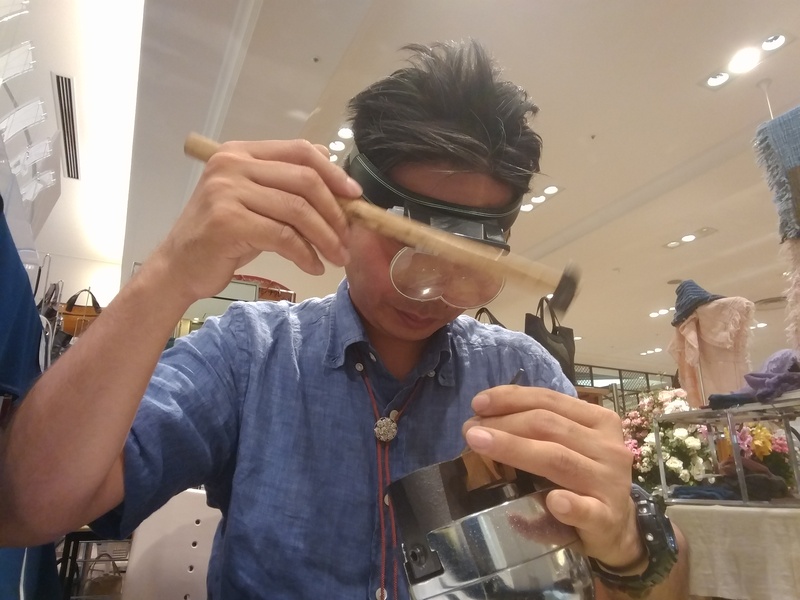 銀のバングルを作る　Making a silver bangle. I’m conscientious in my work. 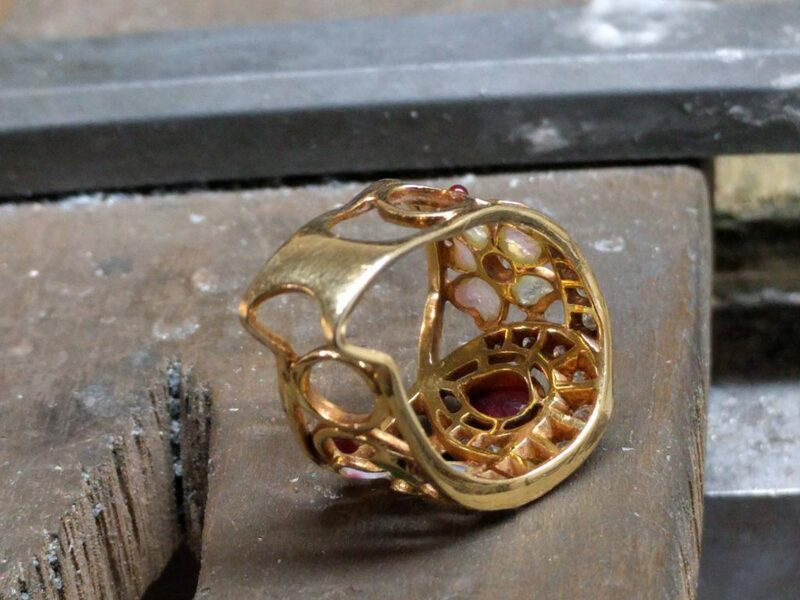 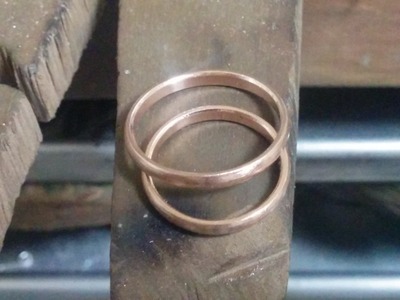 I make 18K pinkgold rings. Pinkgold is hard to bend! 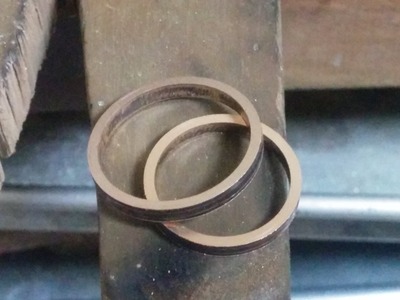 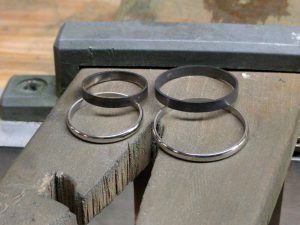 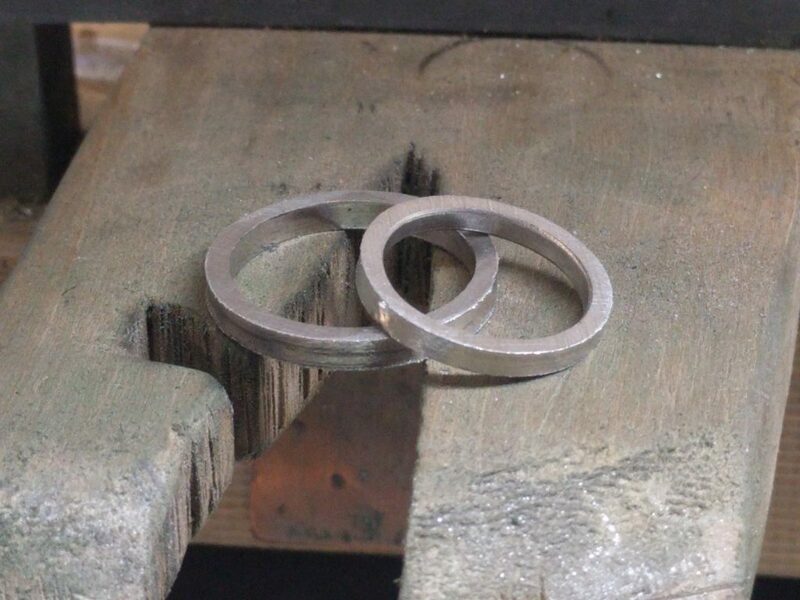 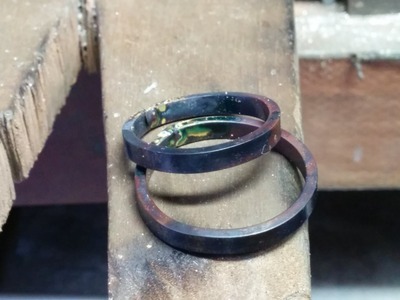 Two rings has been brazed. 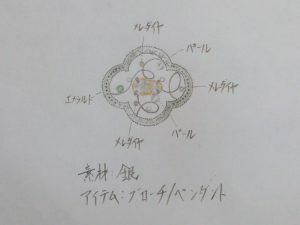 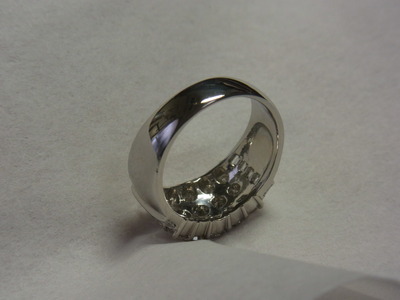 High dome ring has been completed! 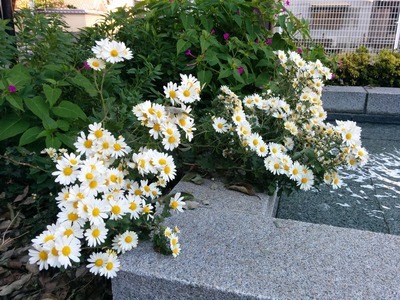 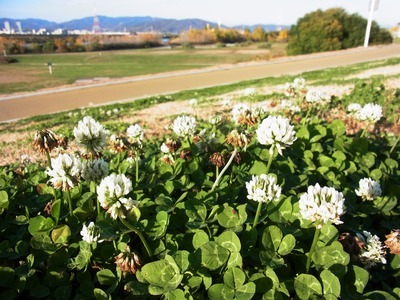 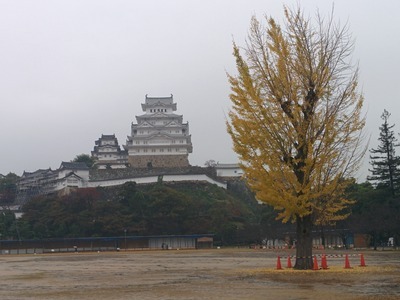 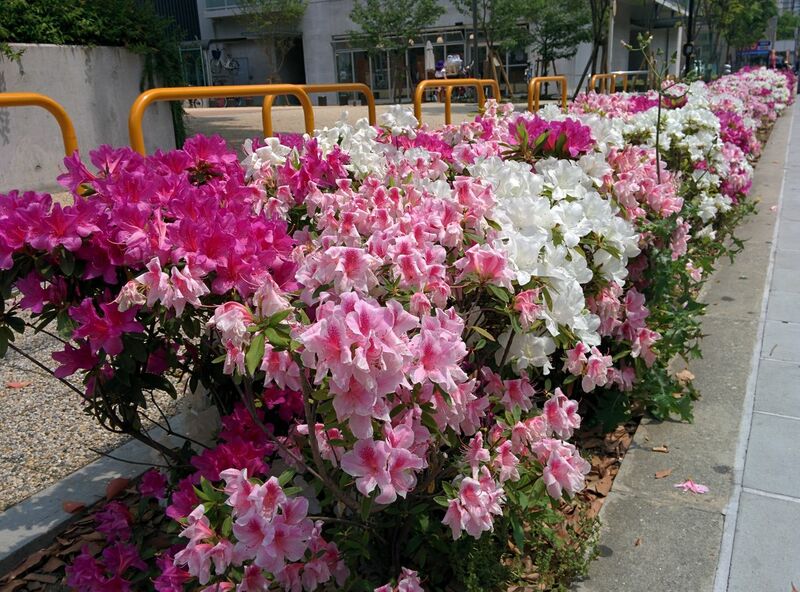 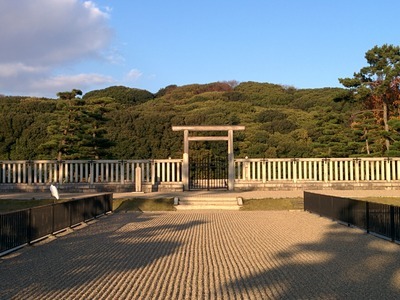 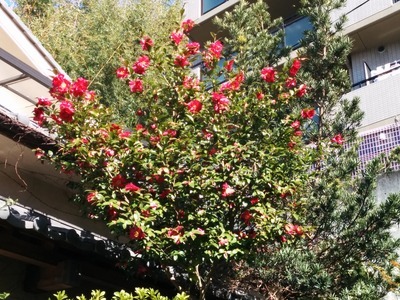 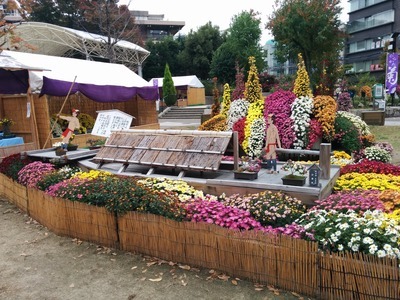 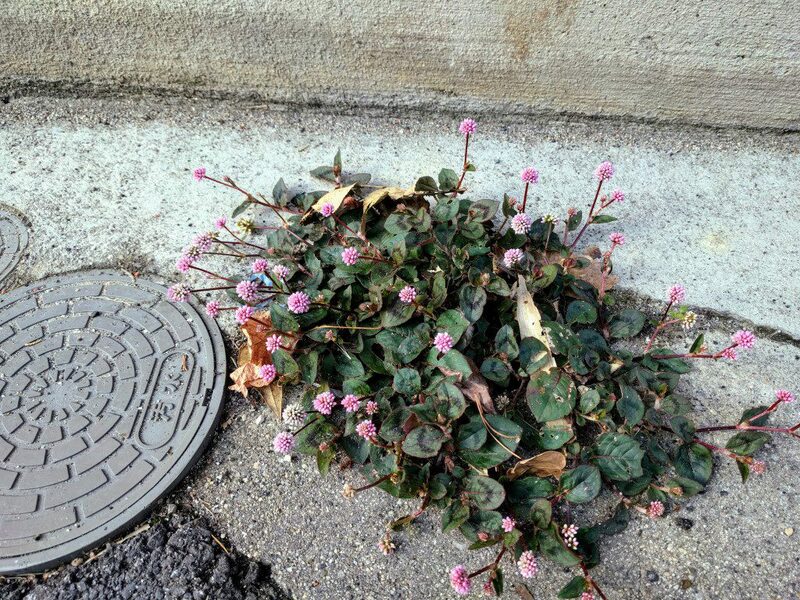 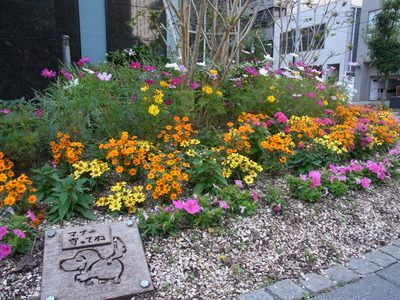 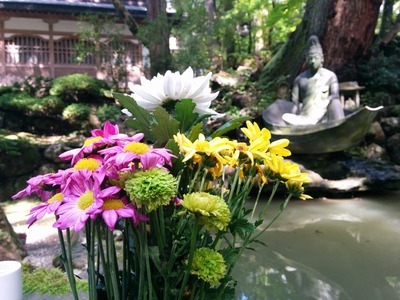 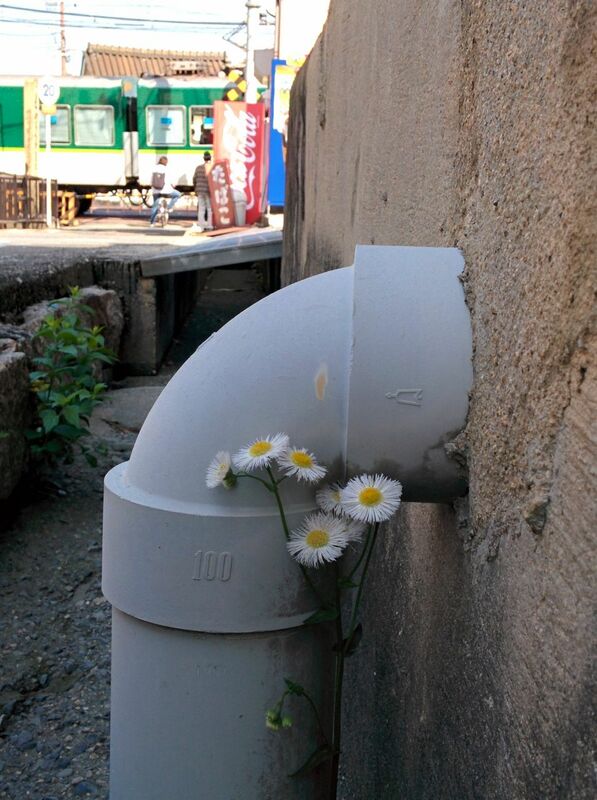 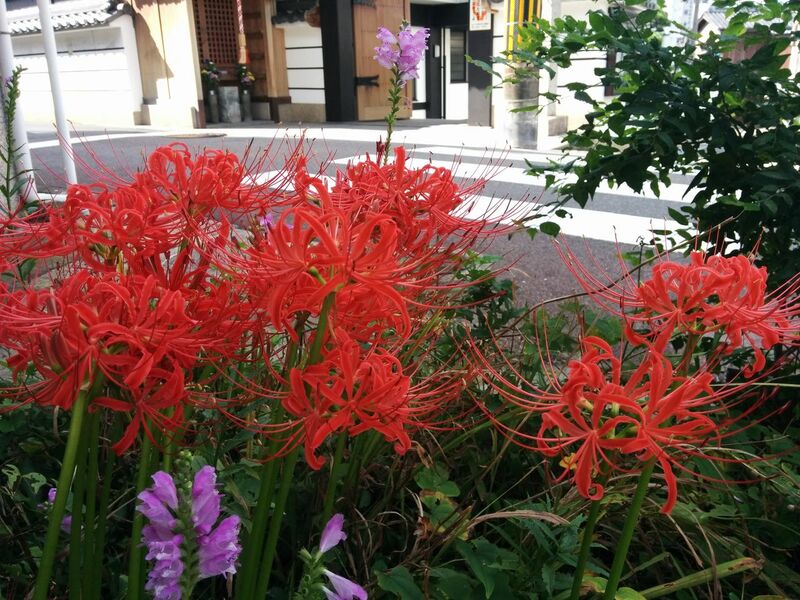 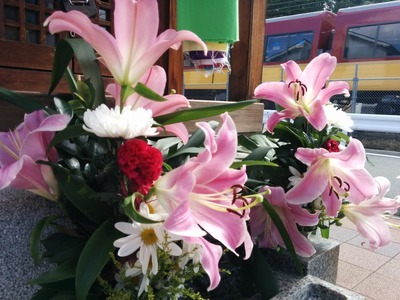 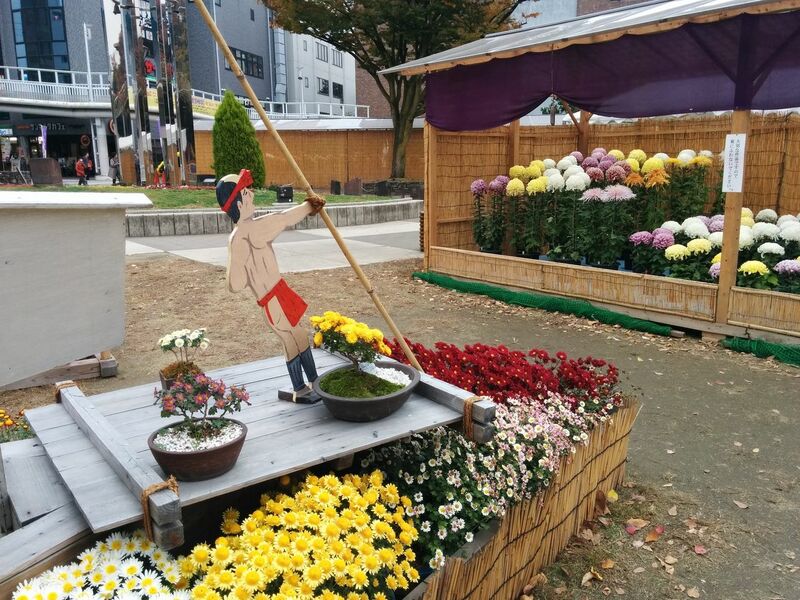 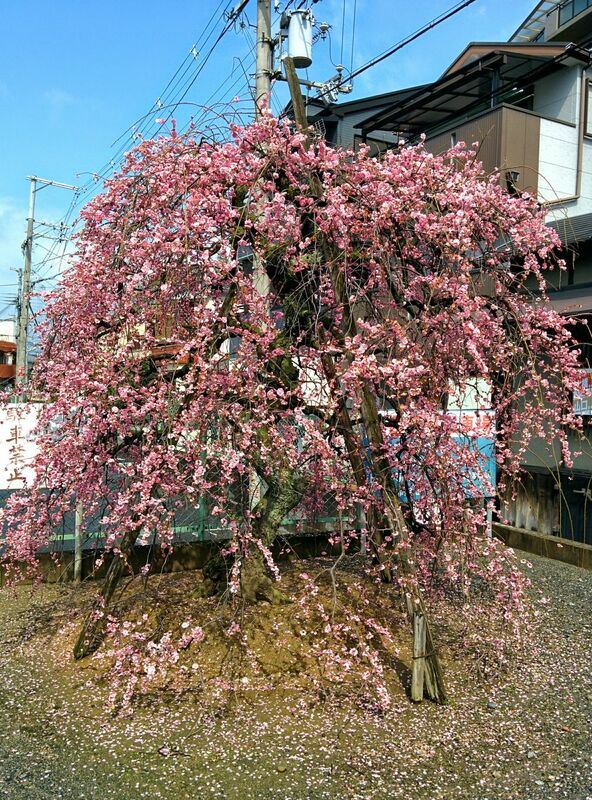 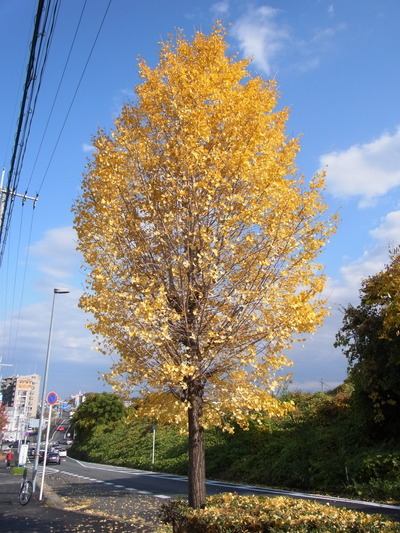 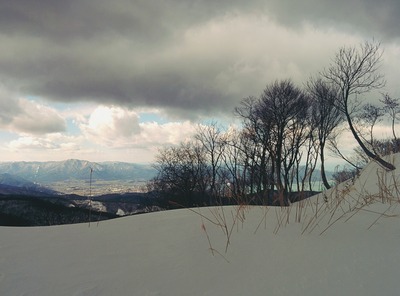 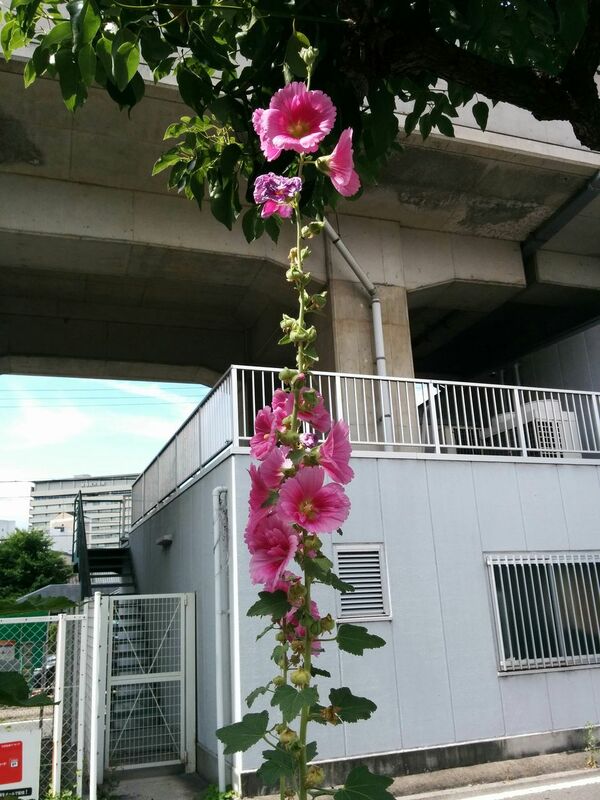 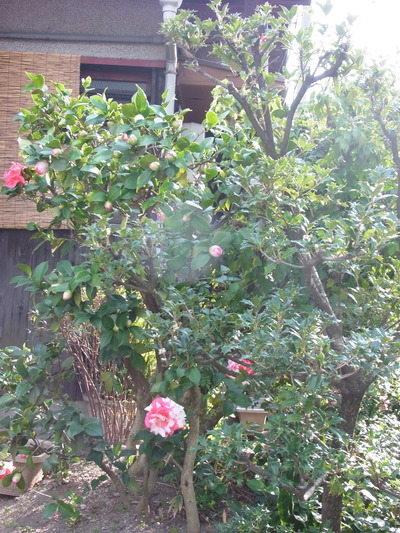 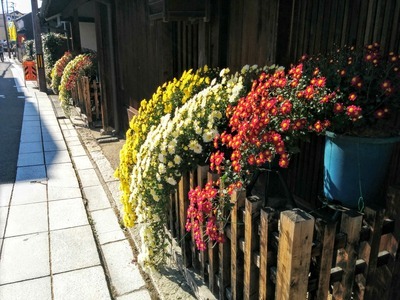 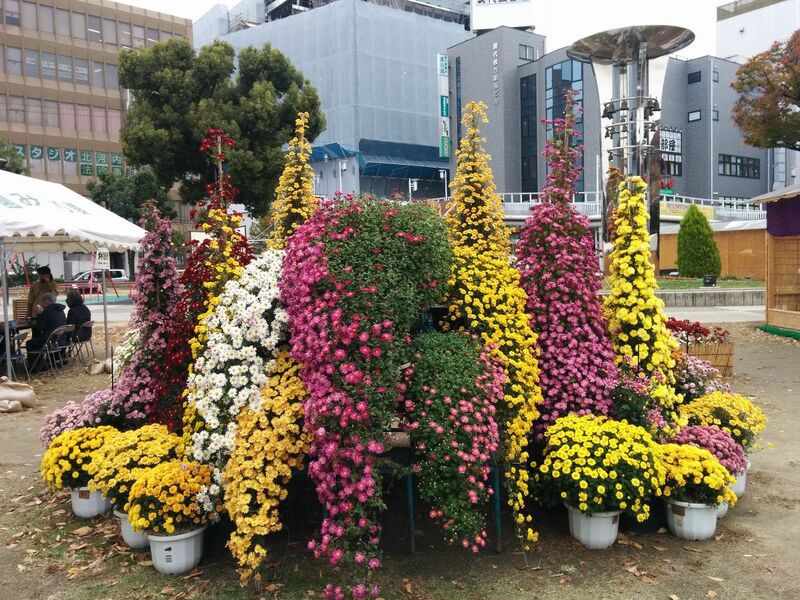 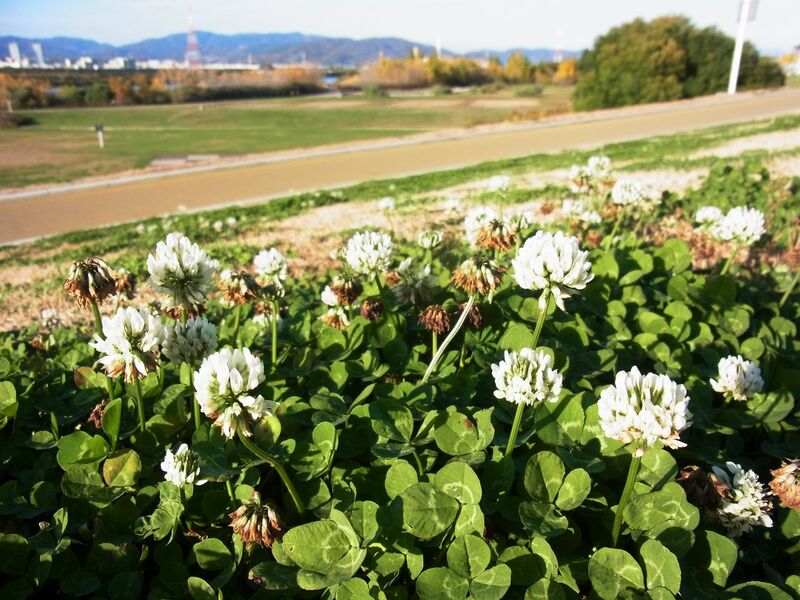 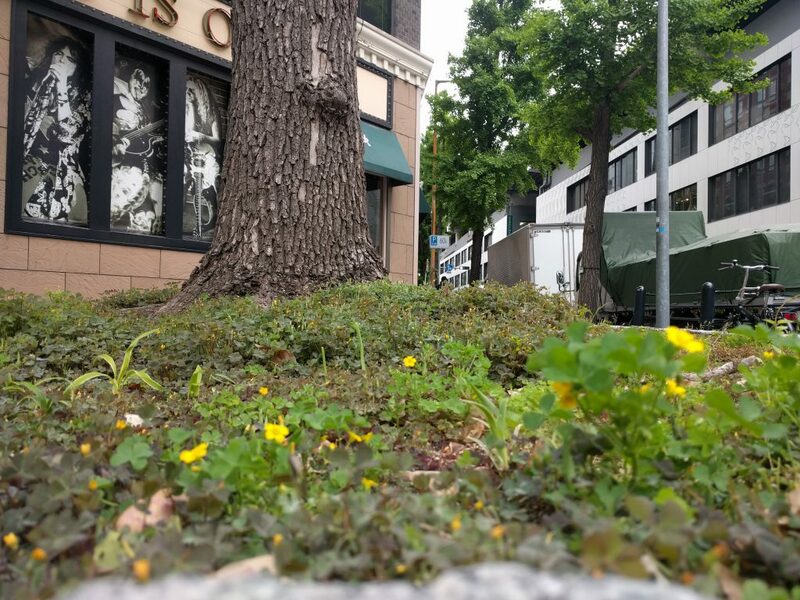 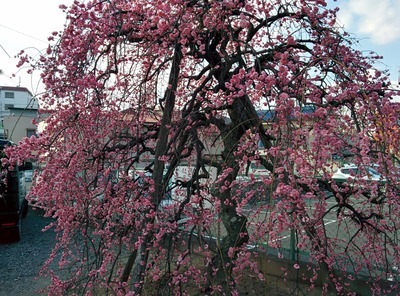 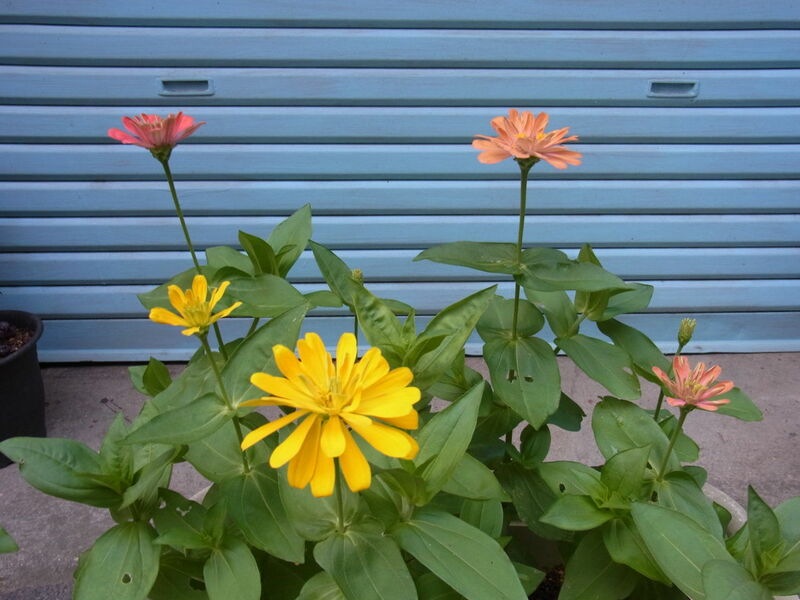 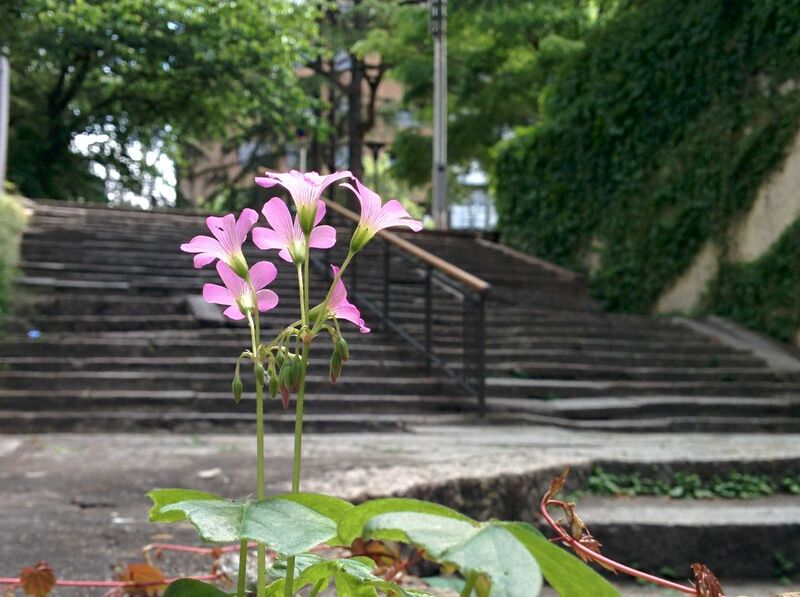 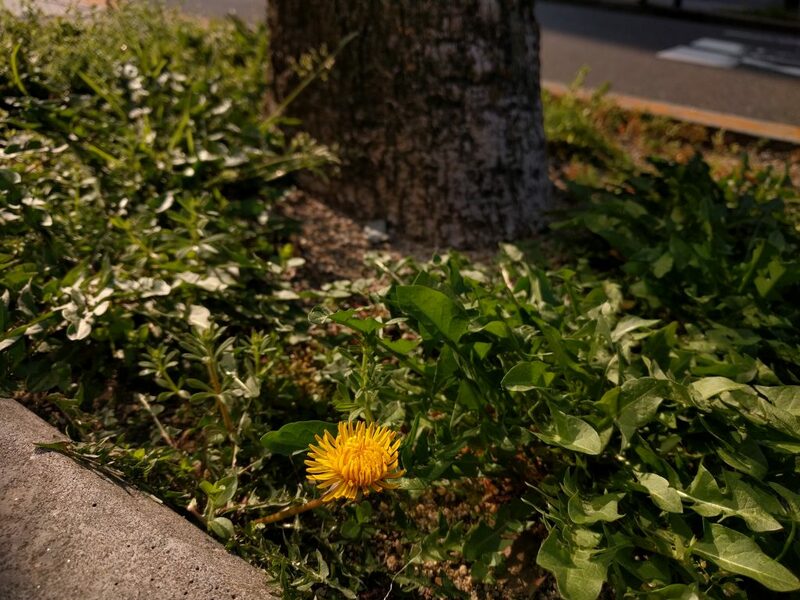 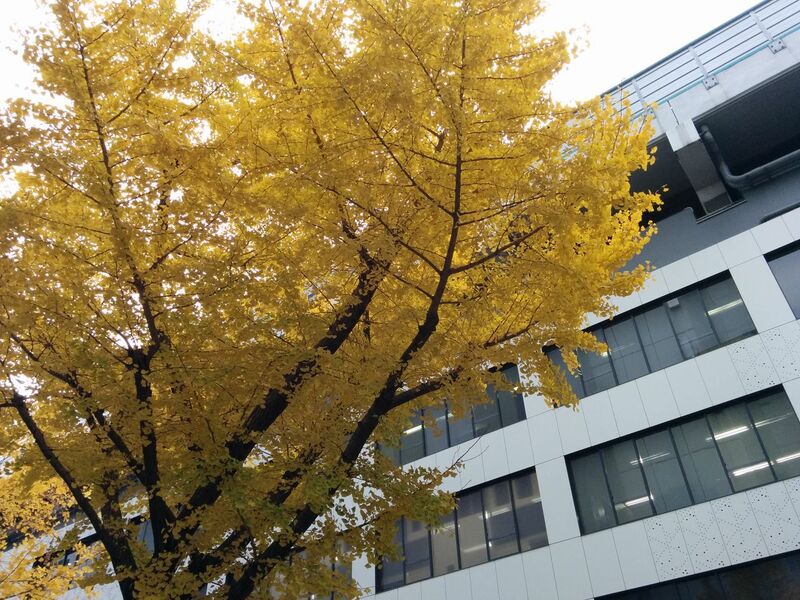 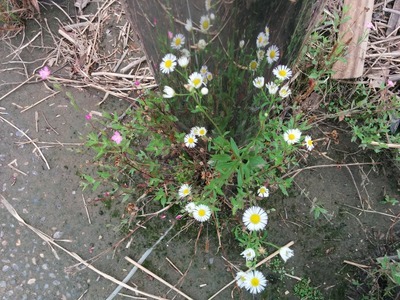 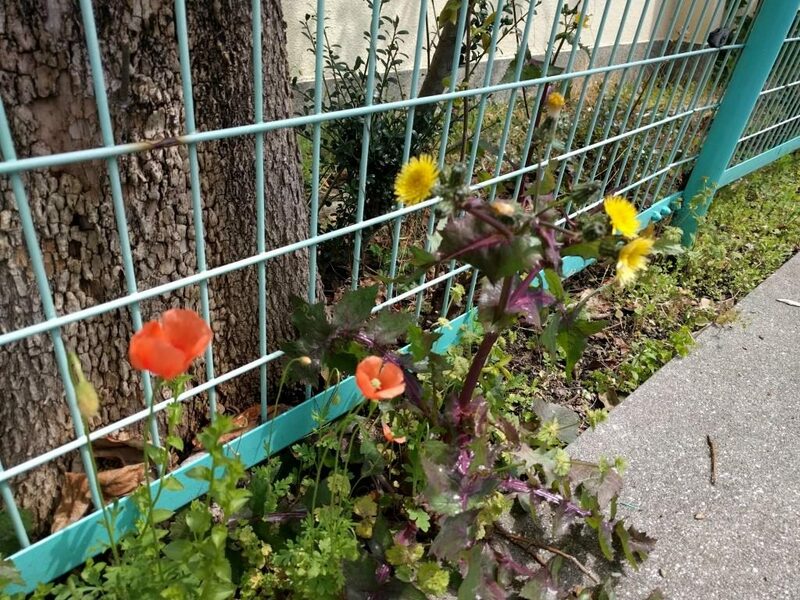 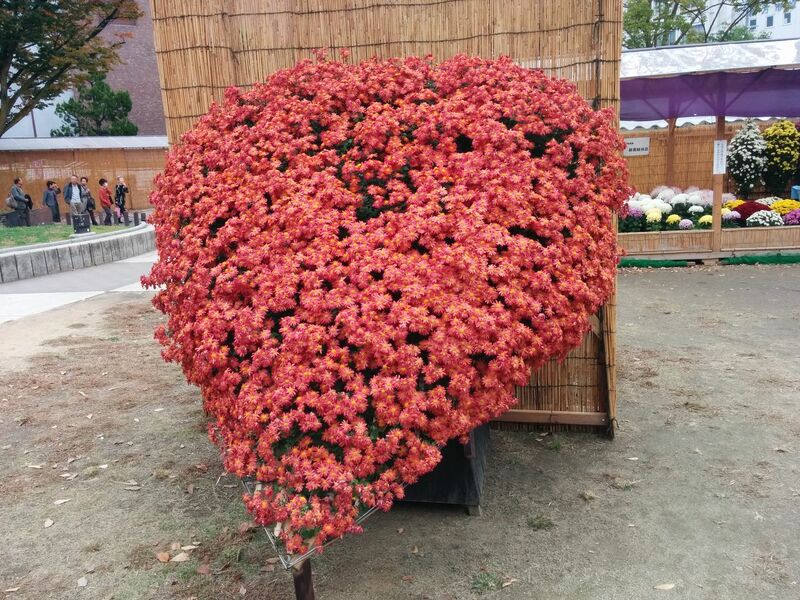 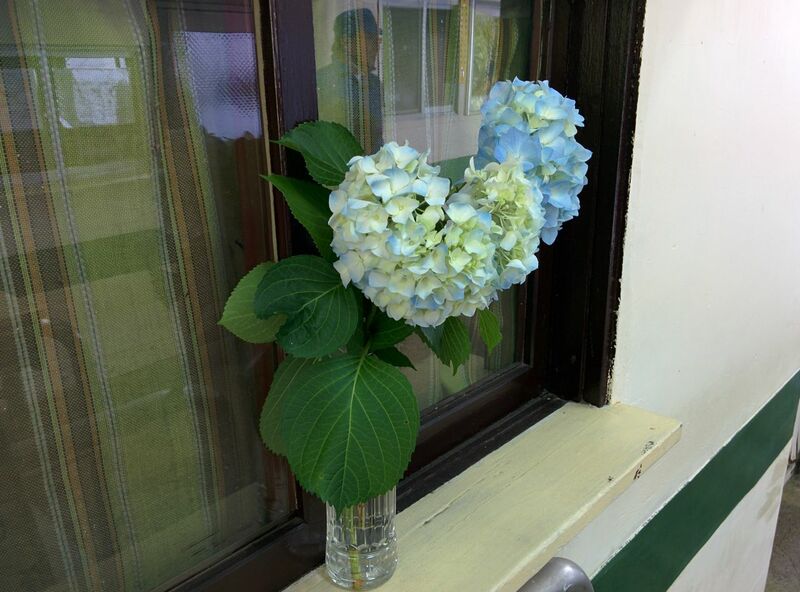 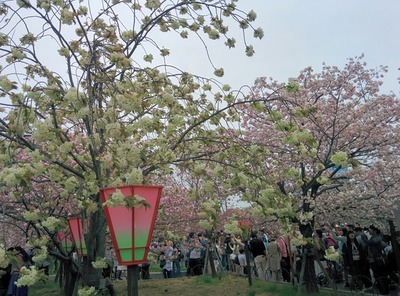 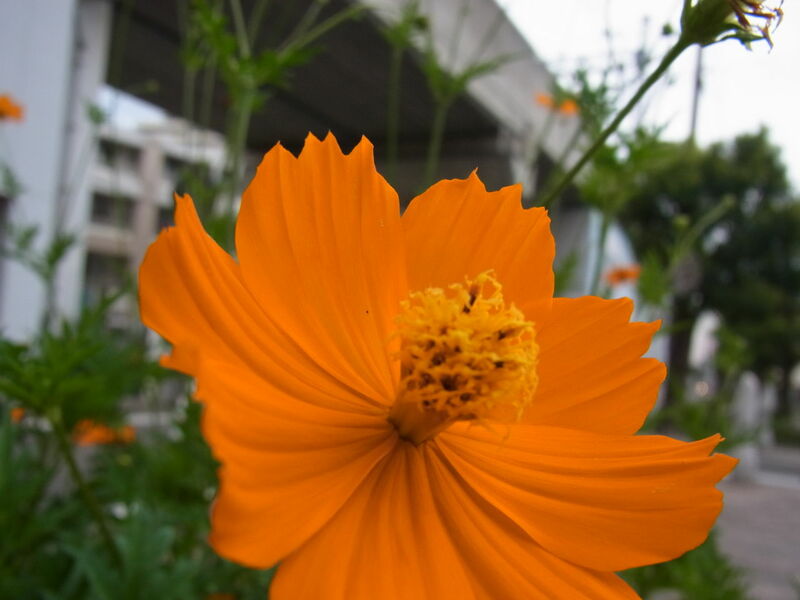 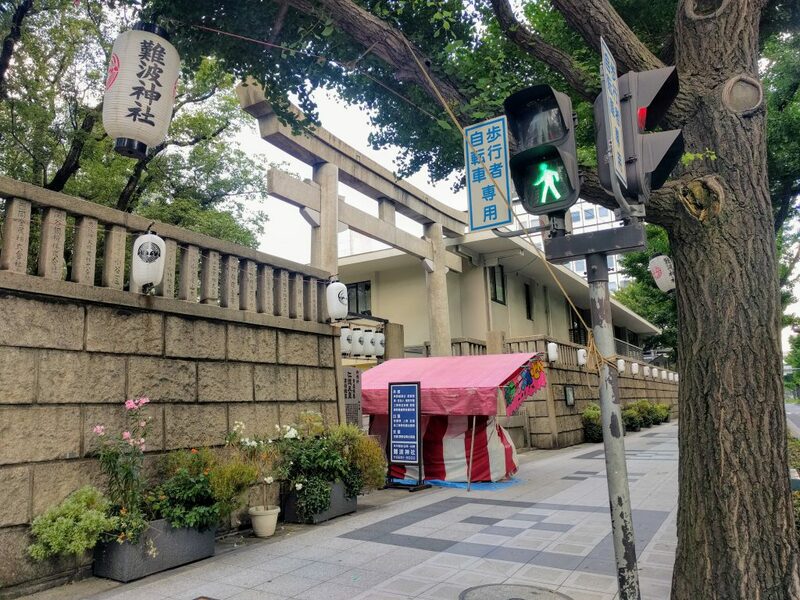 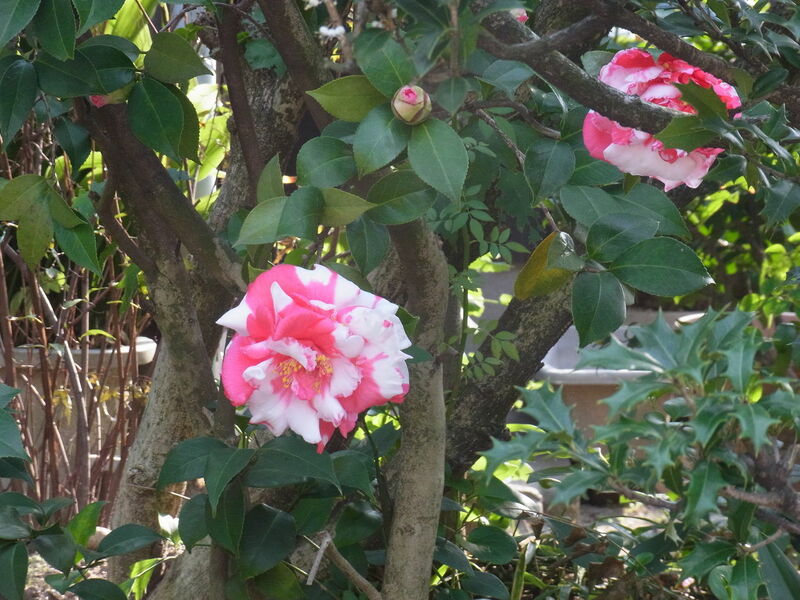 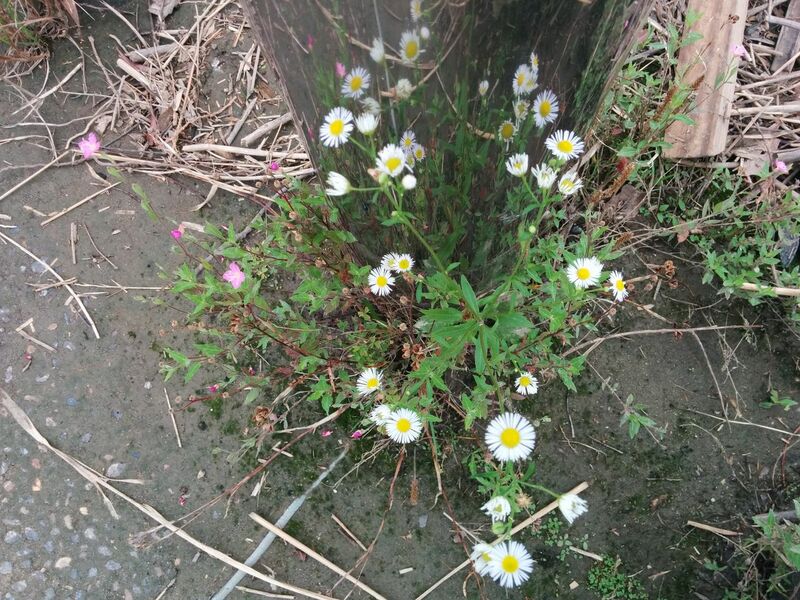 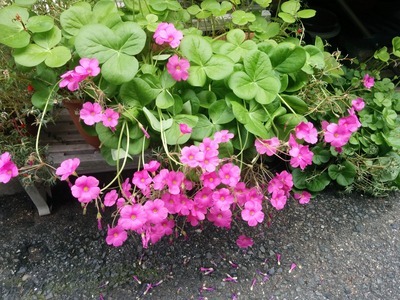 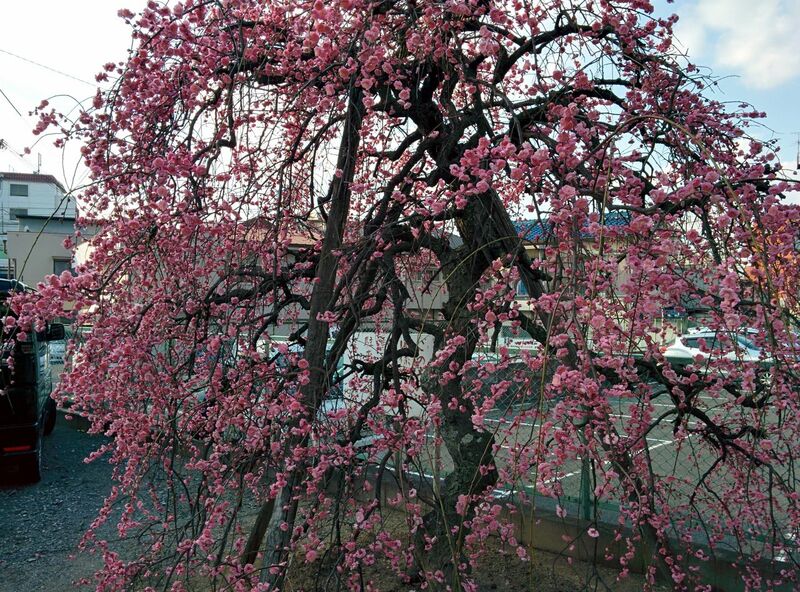 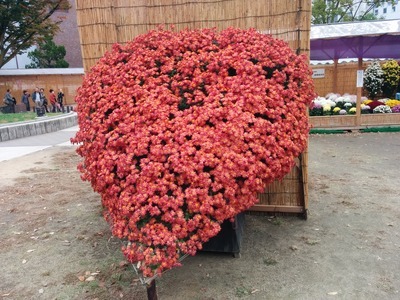 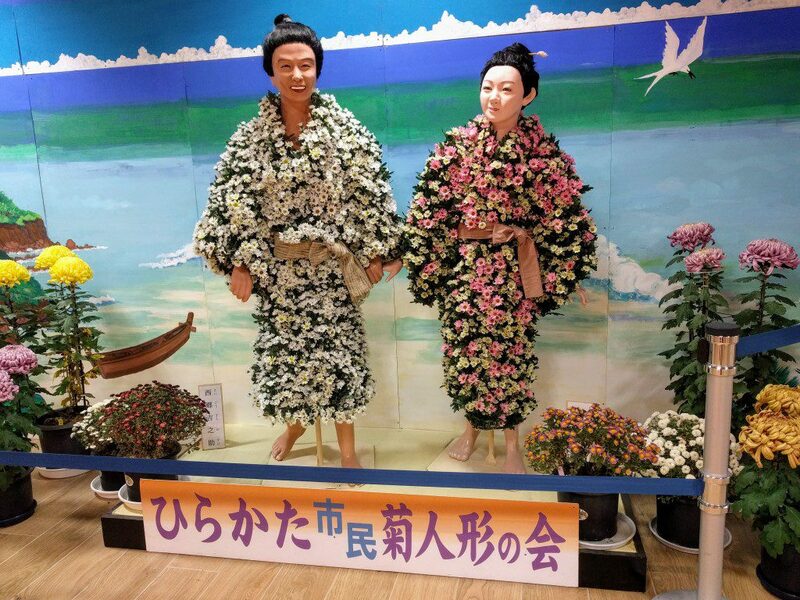 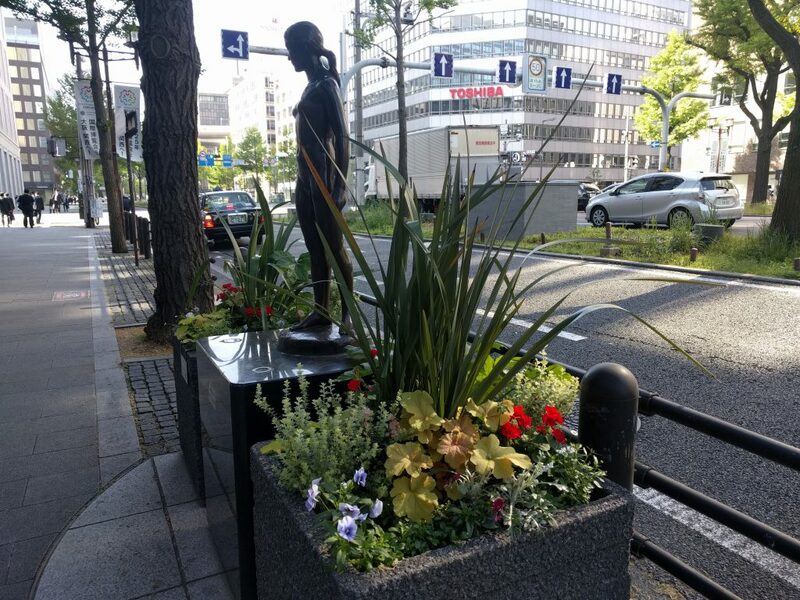 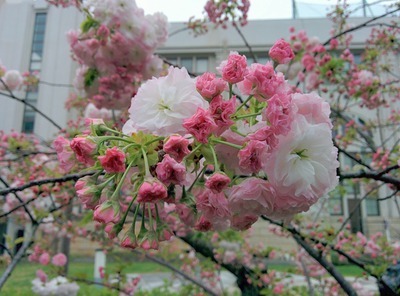 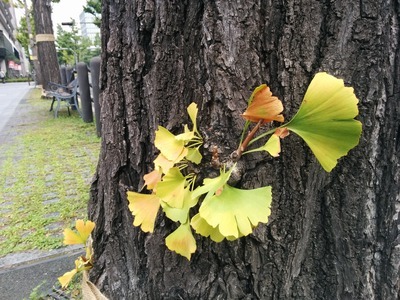 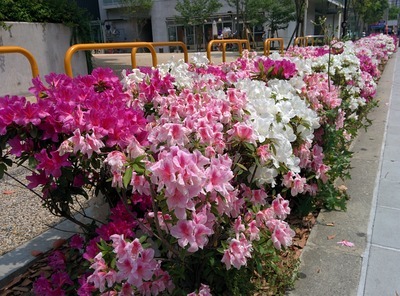 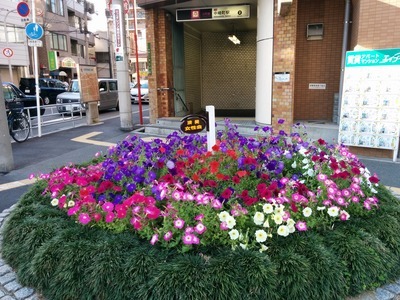 Flowers called KIKU(chrysanthemum) in Hirakata-City. 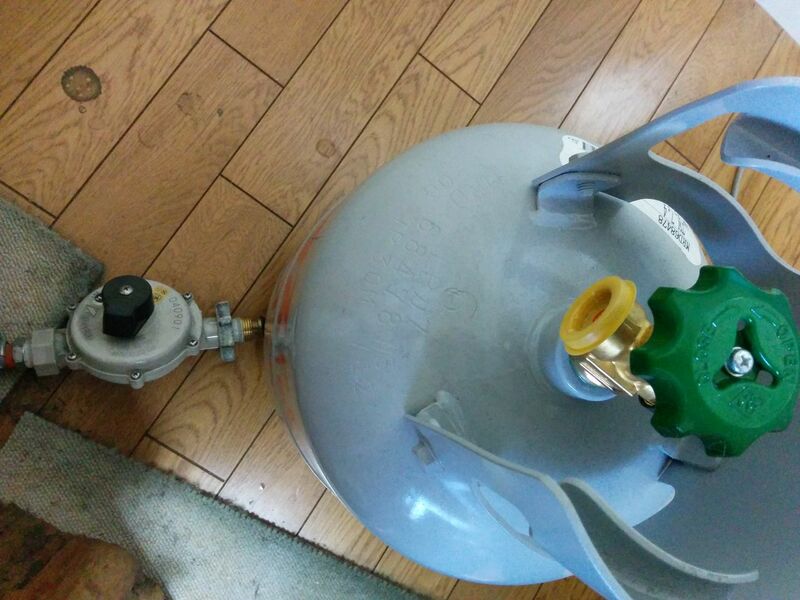 An oxygen cylinder and a pressure regulator. 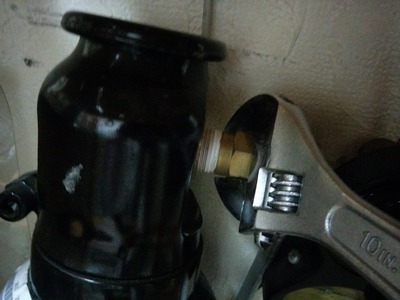 I remove a hose joint using wrench. 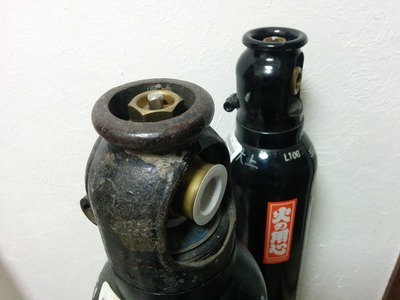 Used cylinder and one filled with full compressed oxygen. 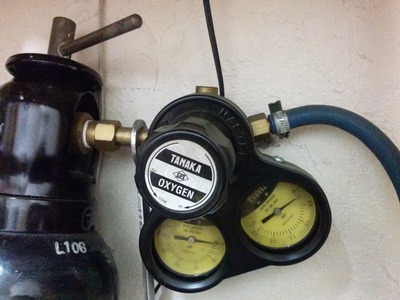 I use searing tape not to leak compressed oxygen. 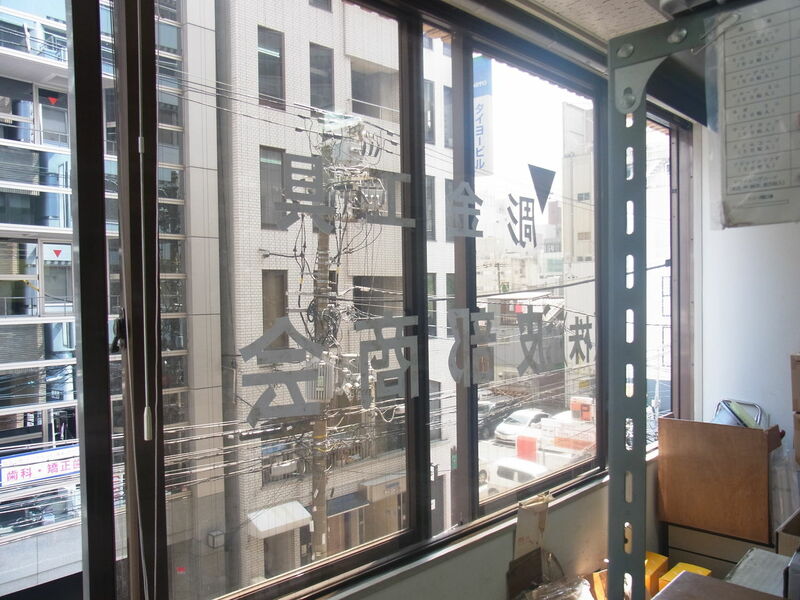 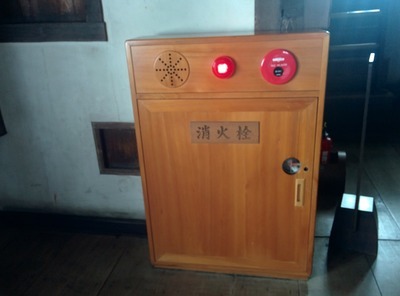 Exchanging an oxygen cylinder is finished. 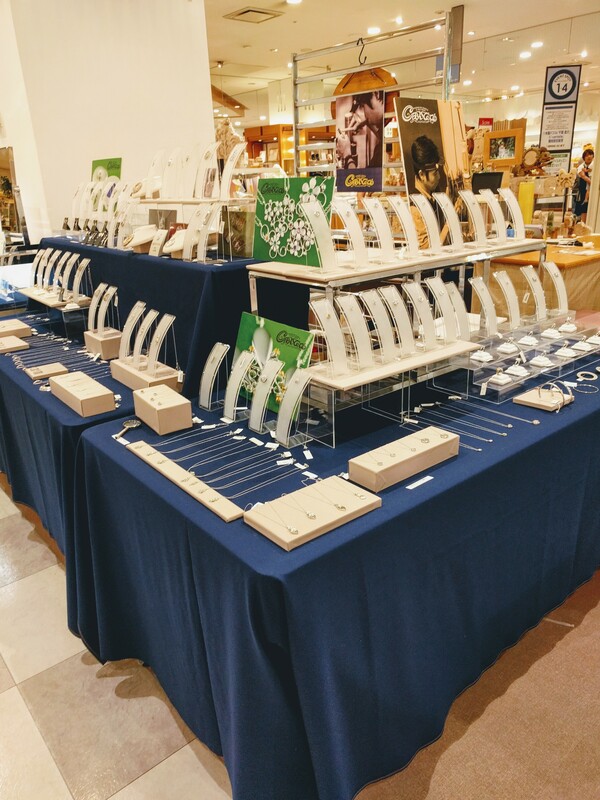 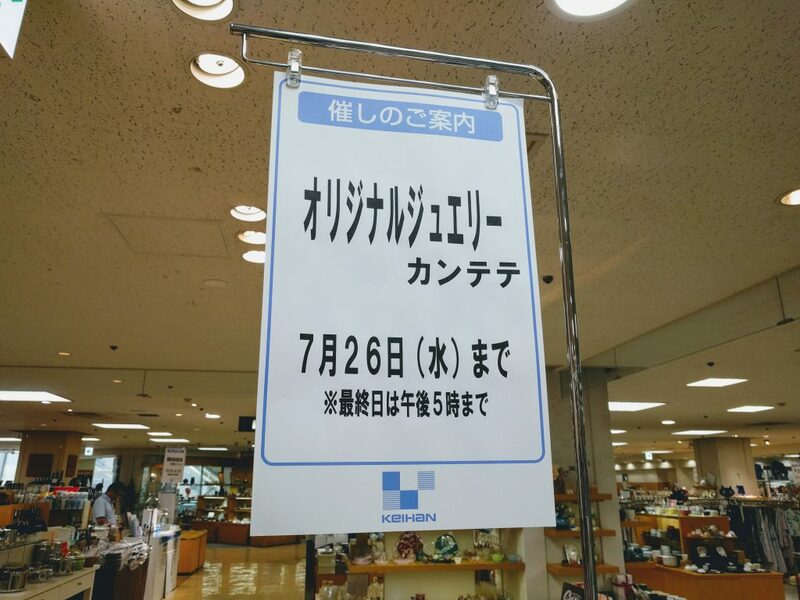 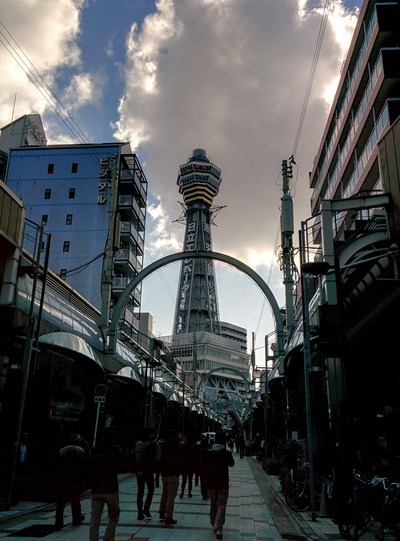 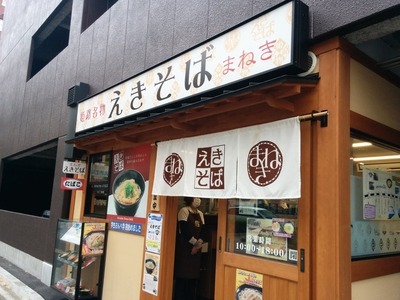 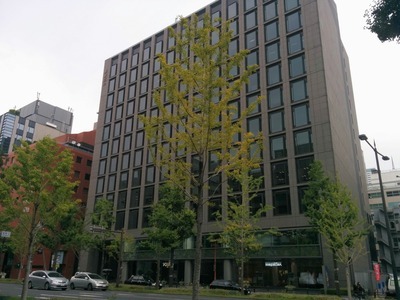 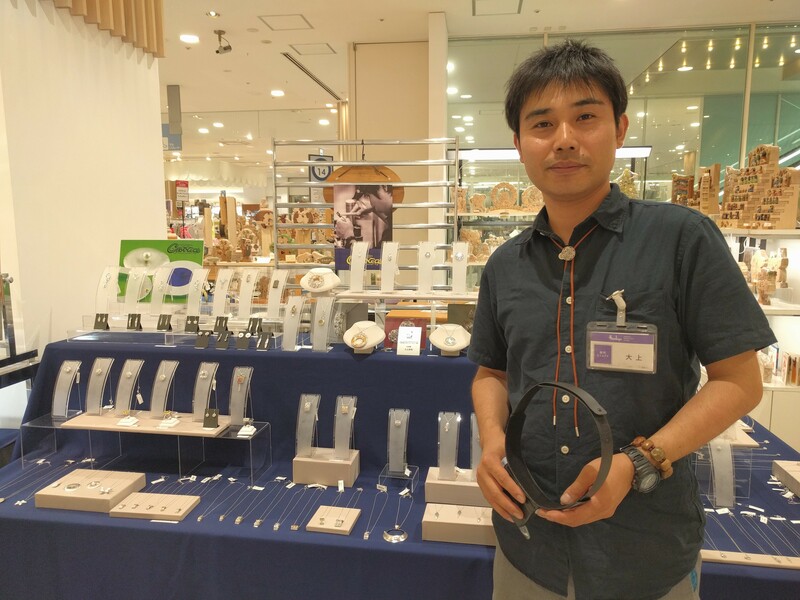 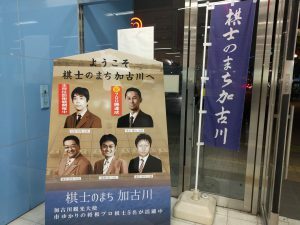 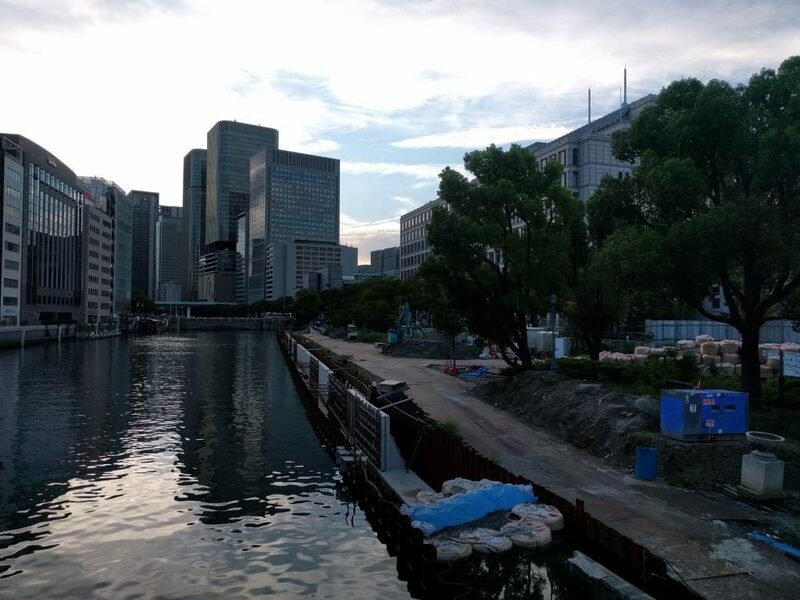 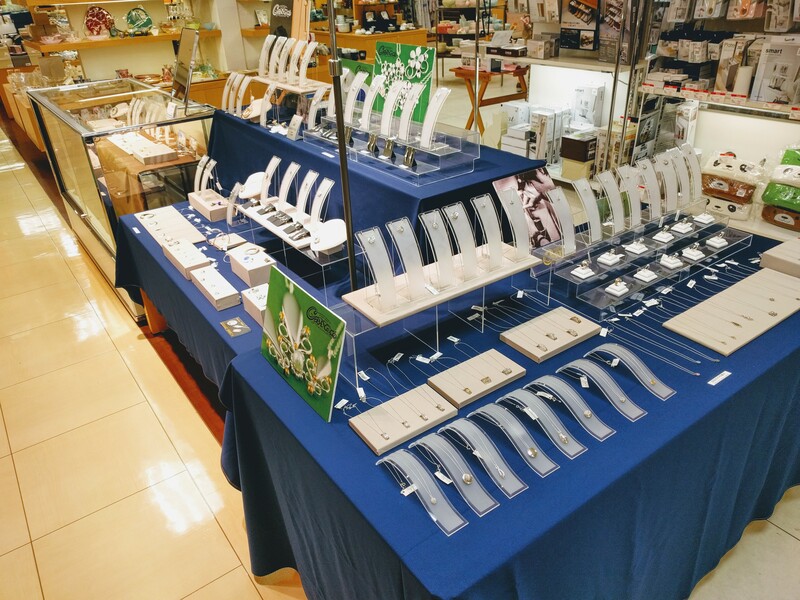 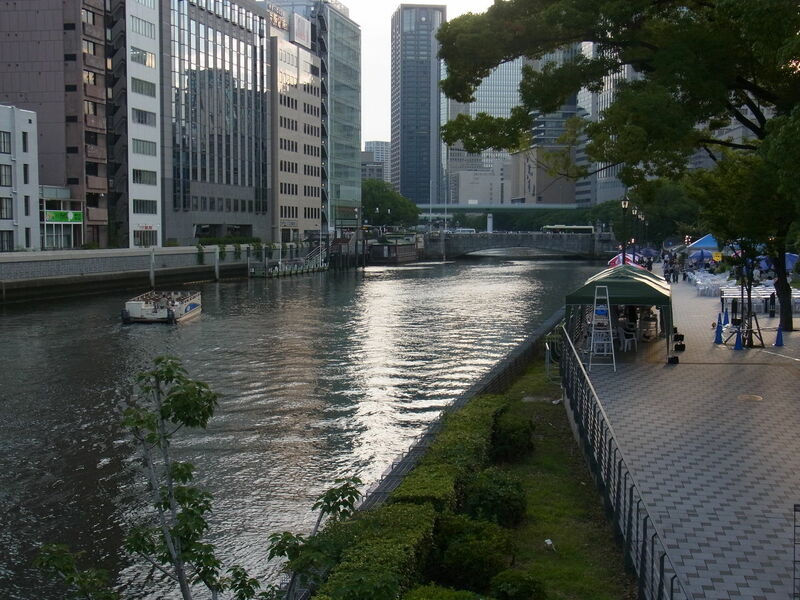 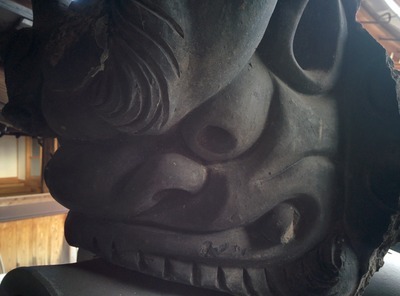 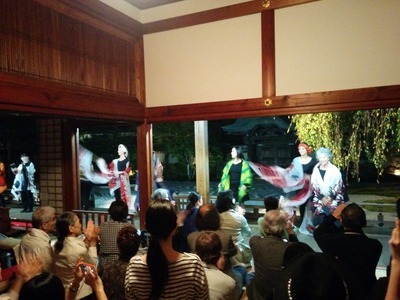 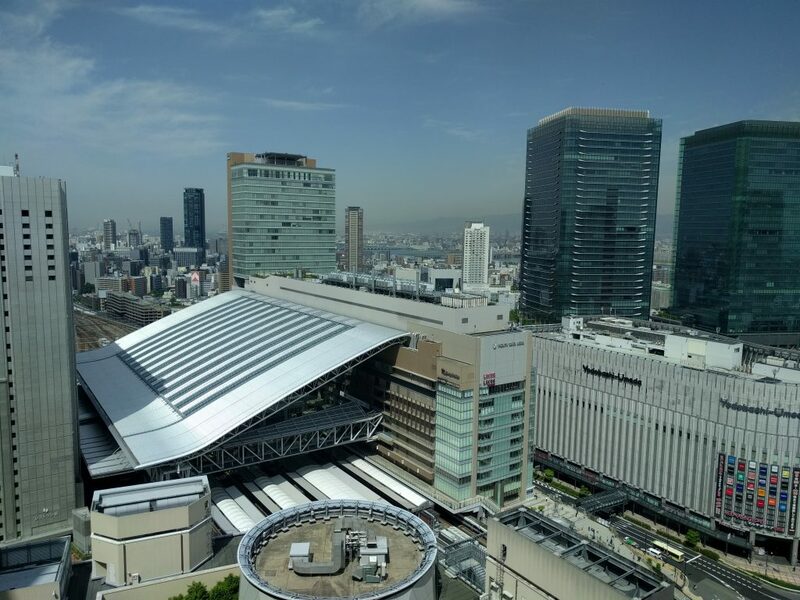 It’s now a week before my personal exhibition starts at Ginza Mitsukoshi on 8th floor. 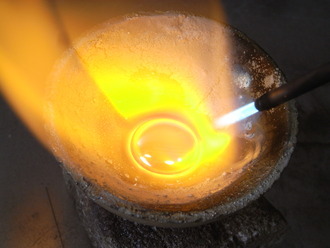 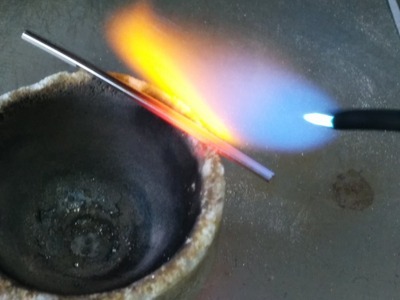 I was makinhg pure silver sticks. 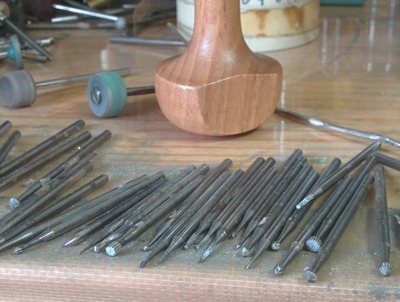 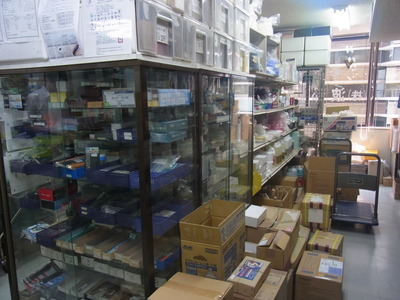 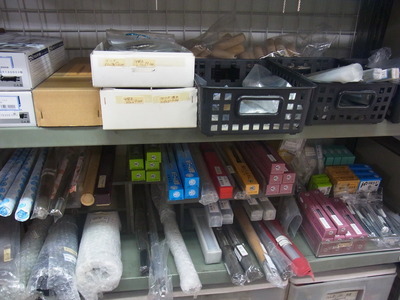 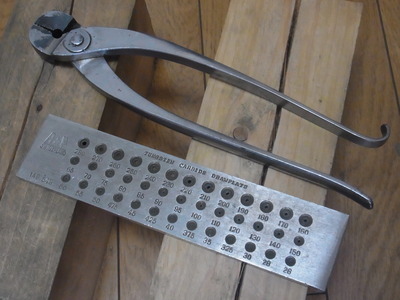 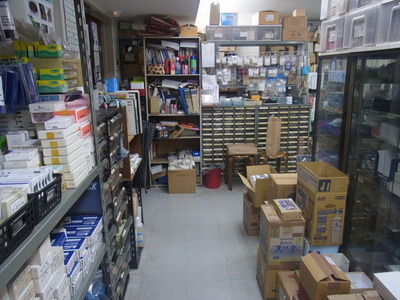 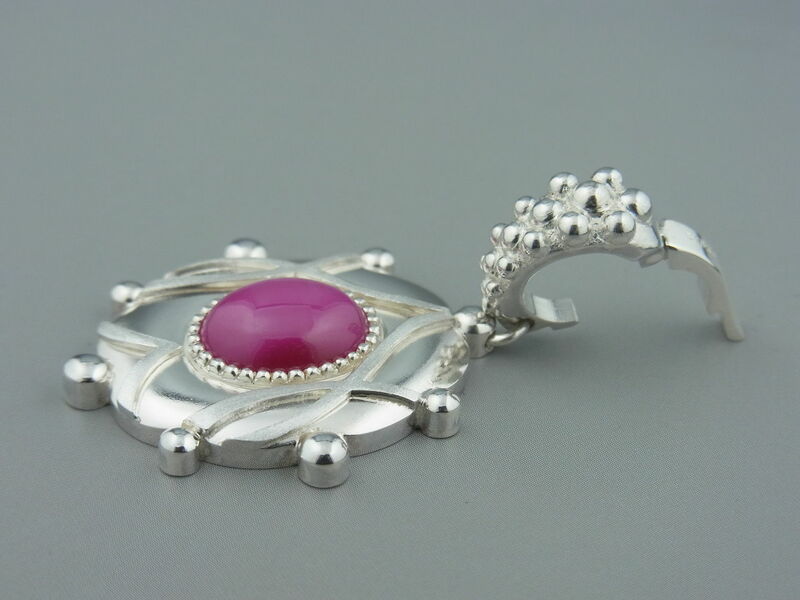 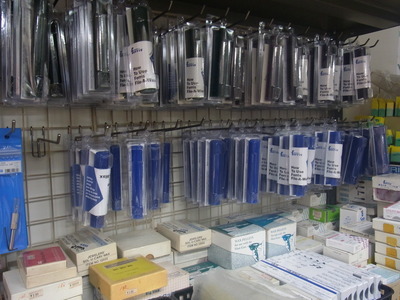 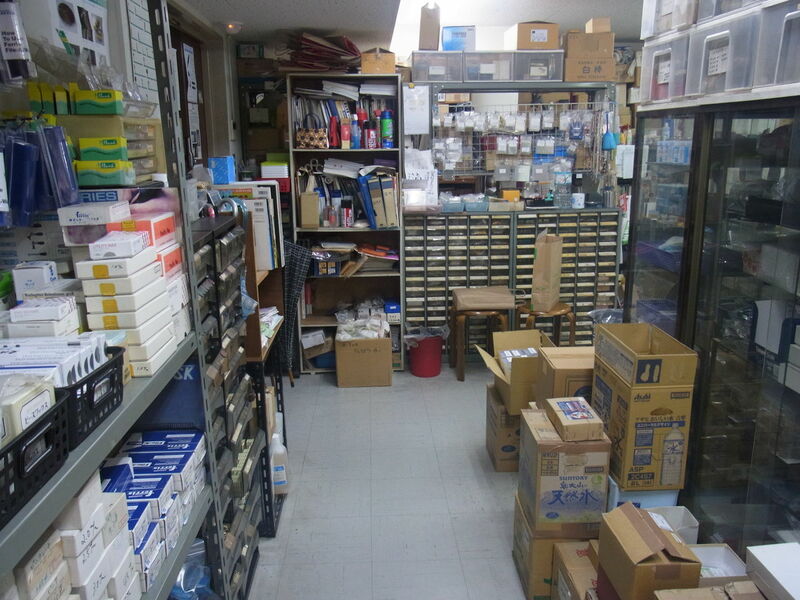 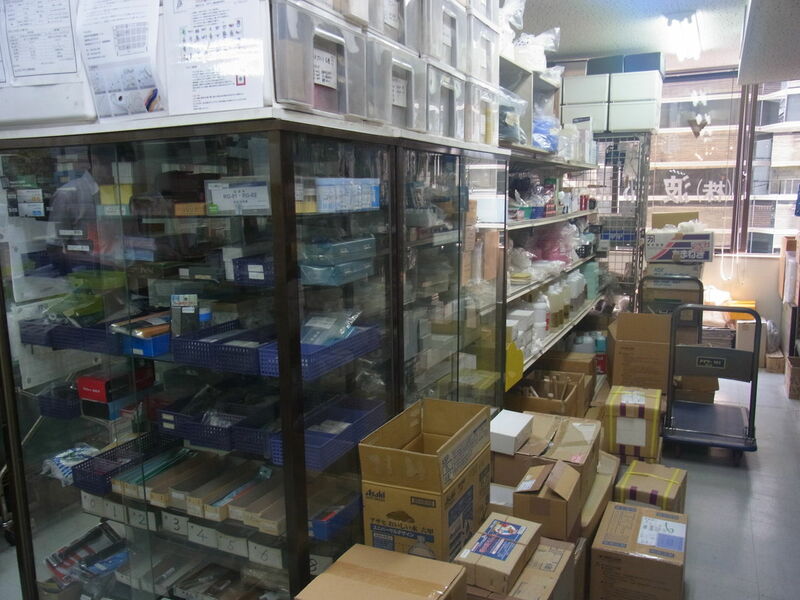 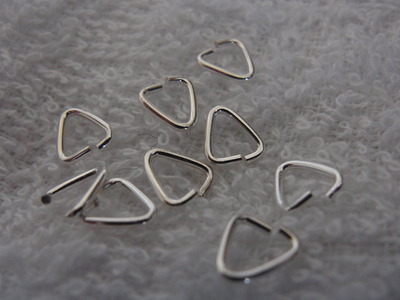 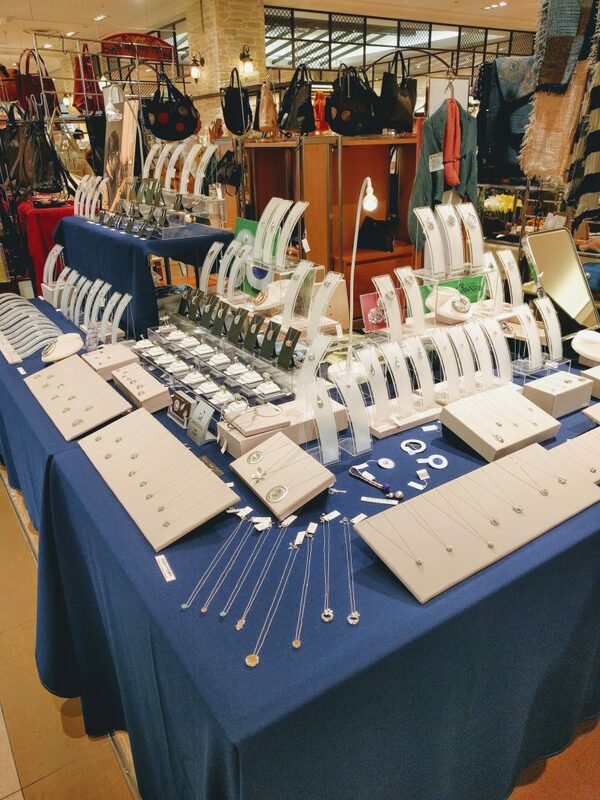 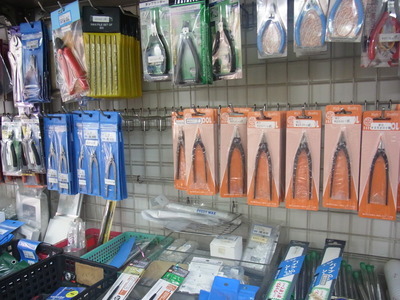 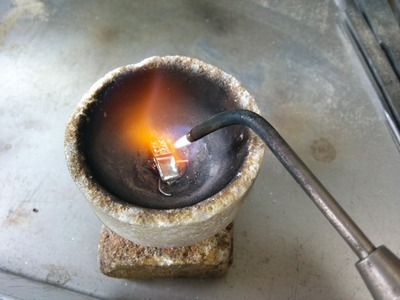 Many kinds of tools and metarials are necessory to make jewelry.Solder is one of them. 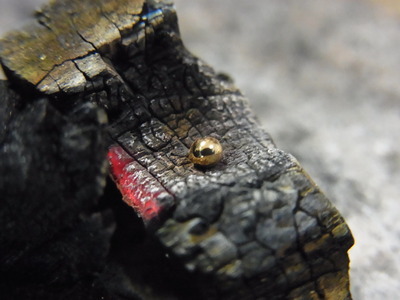 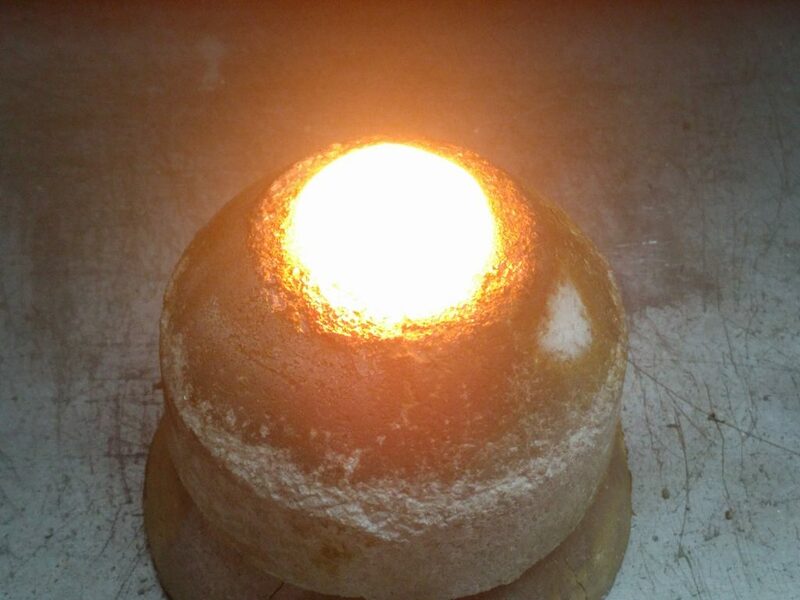 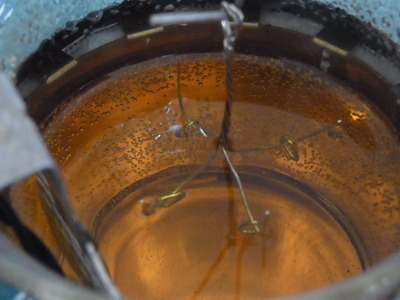 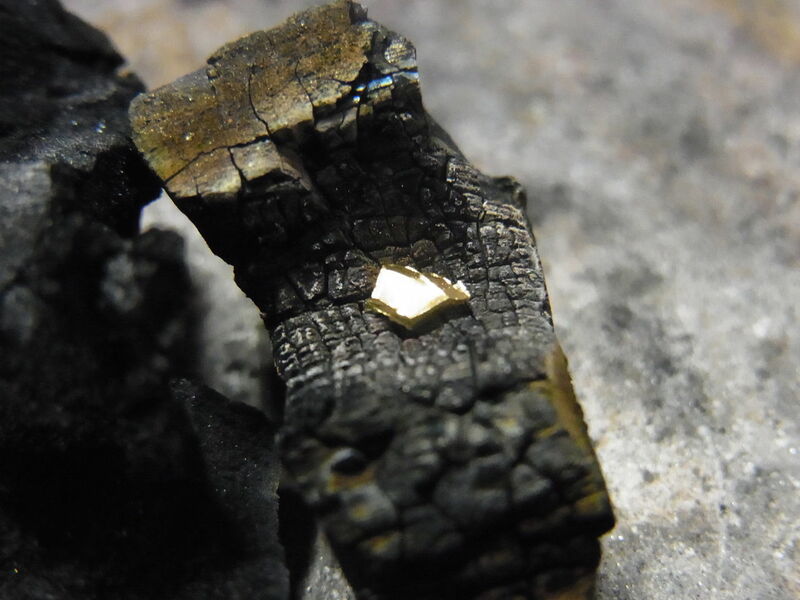 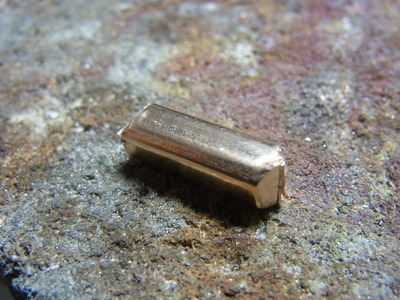 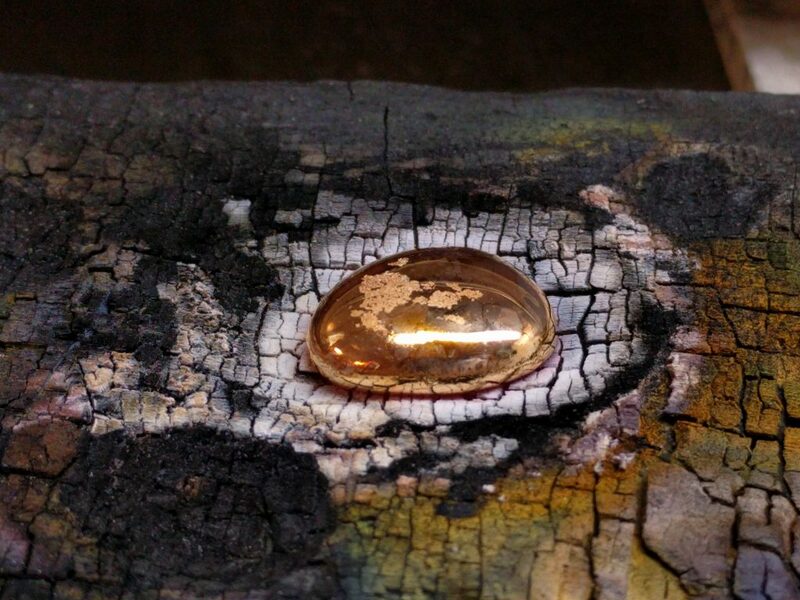 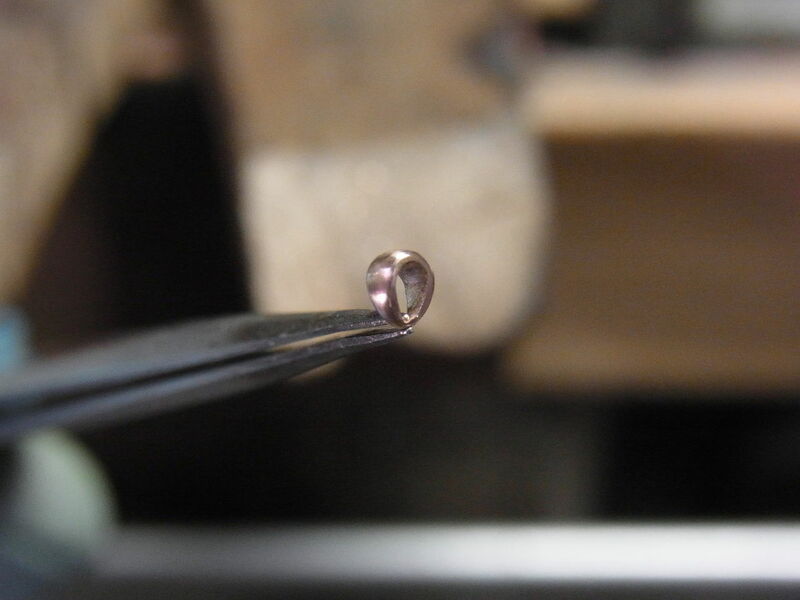 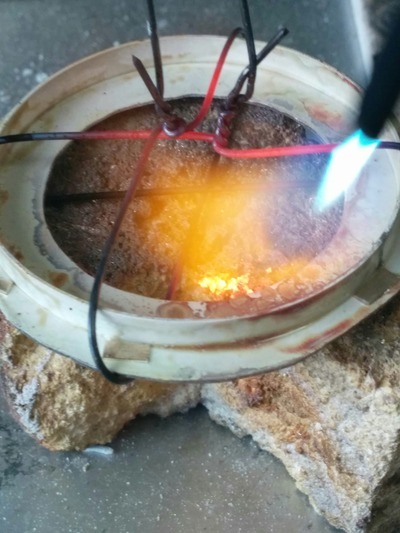 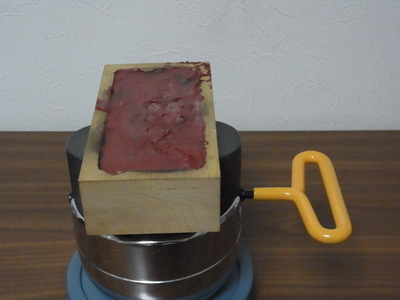 High or low gold melting solder,and gold melting solder for yellowgold or pinkgold,etc. 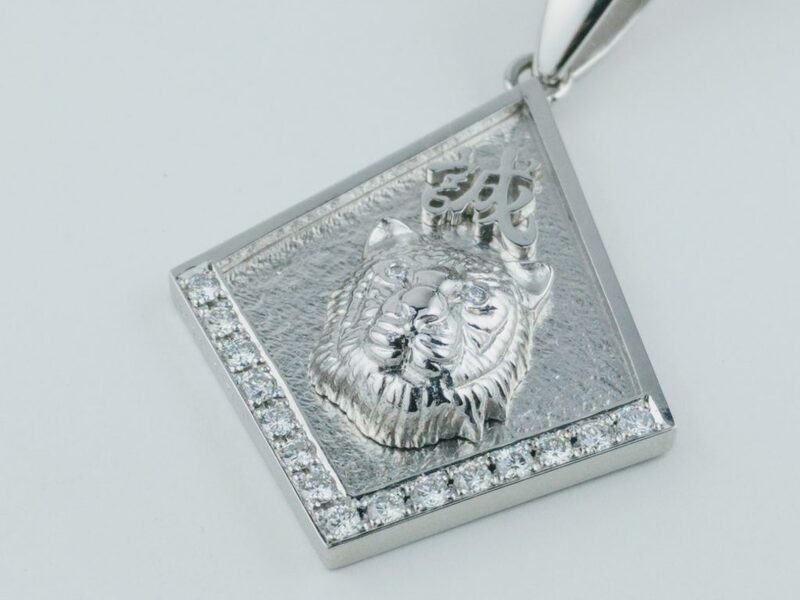 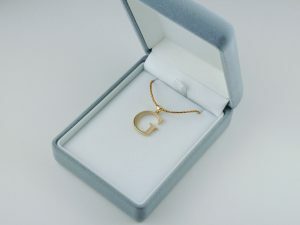 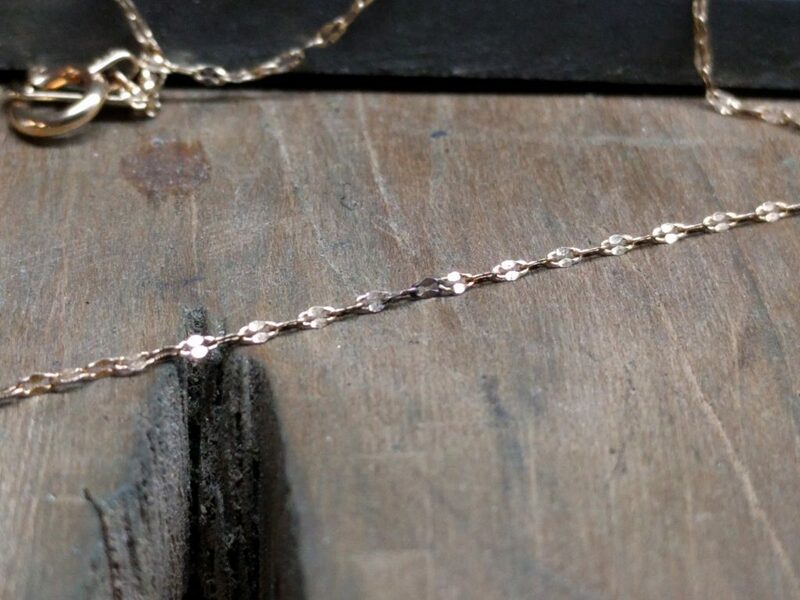 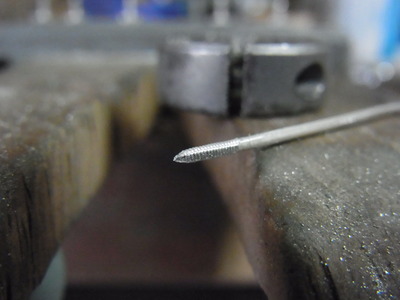 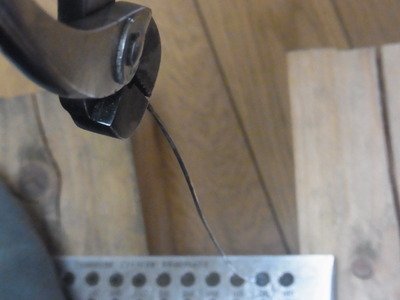 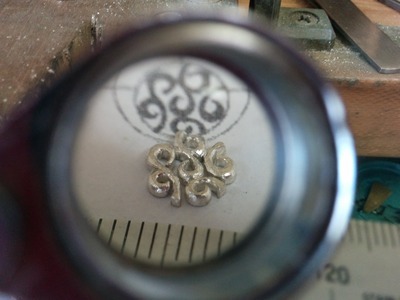 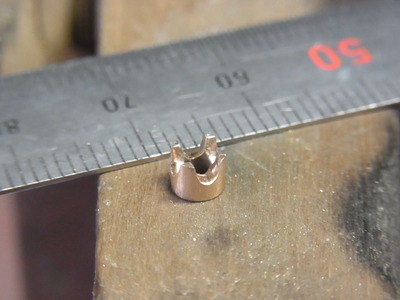 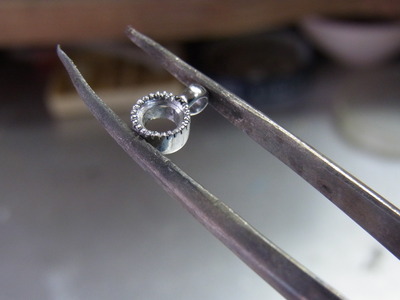 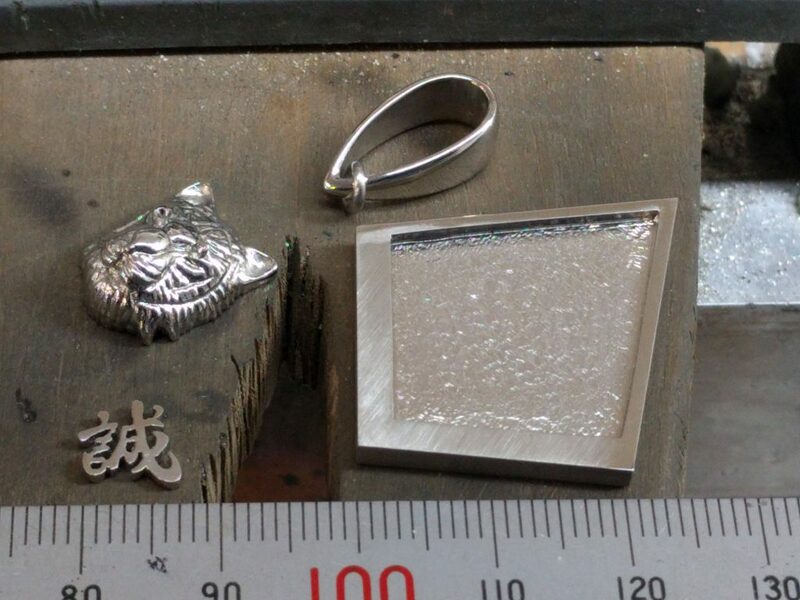 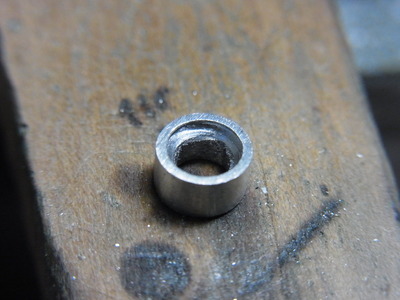 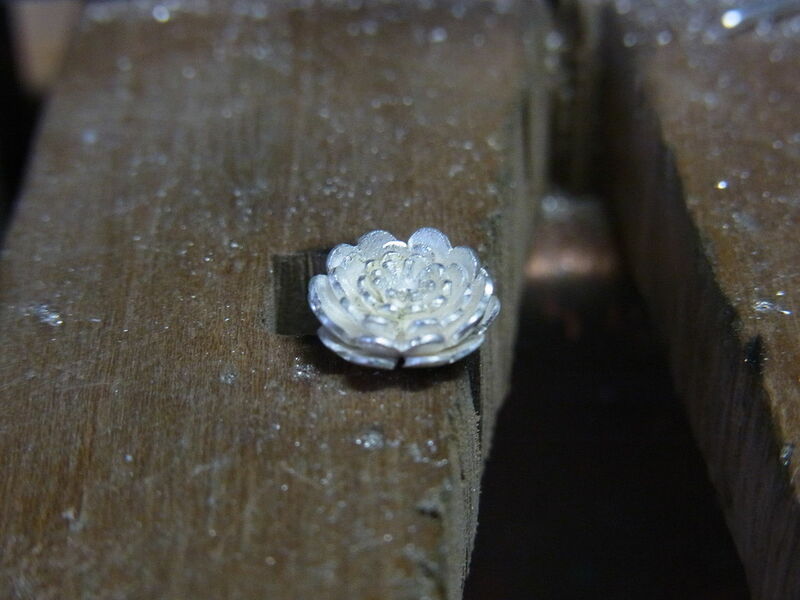 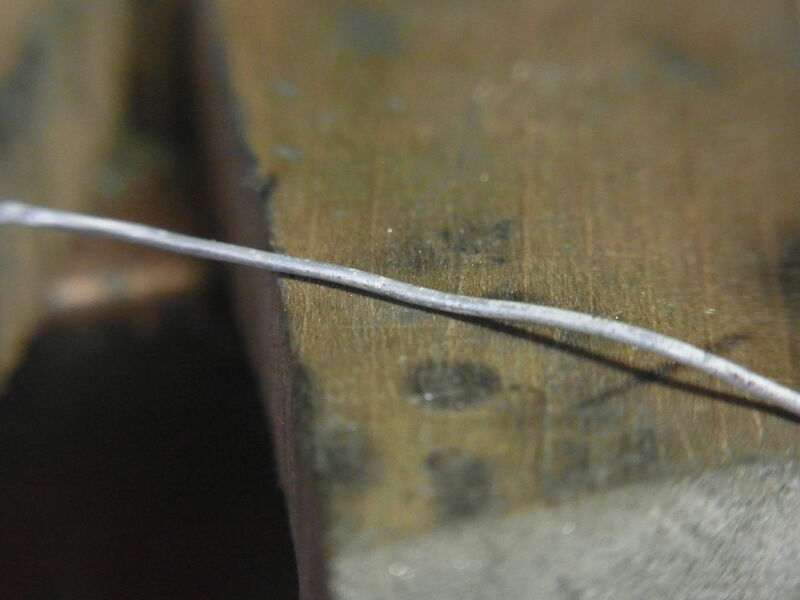 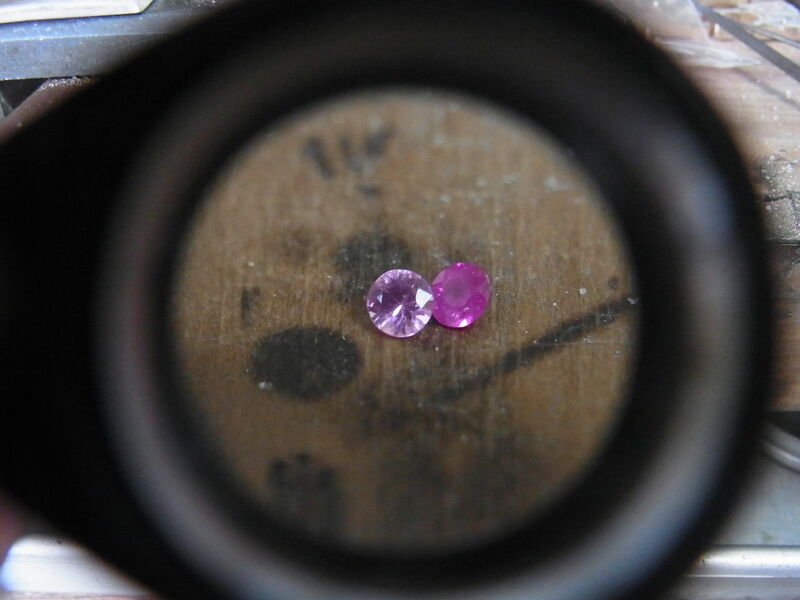 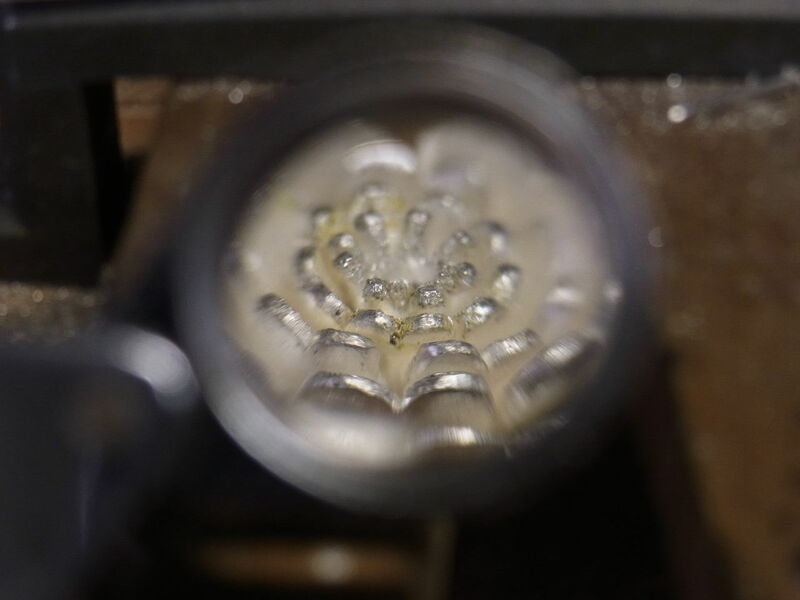 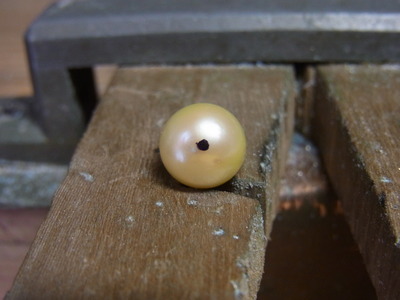 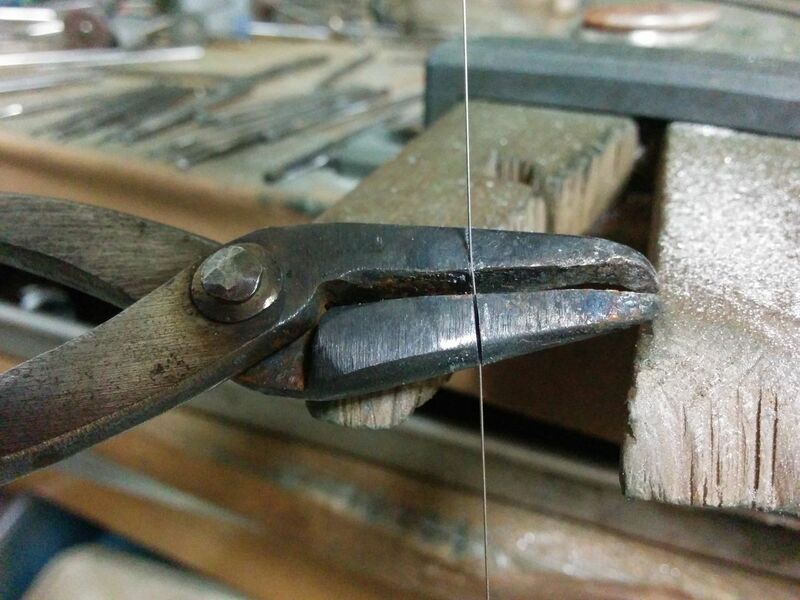 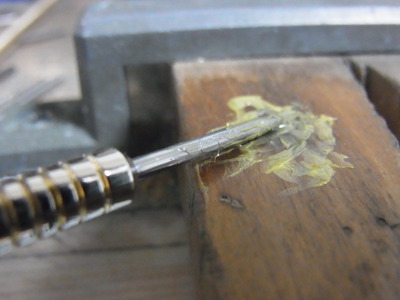 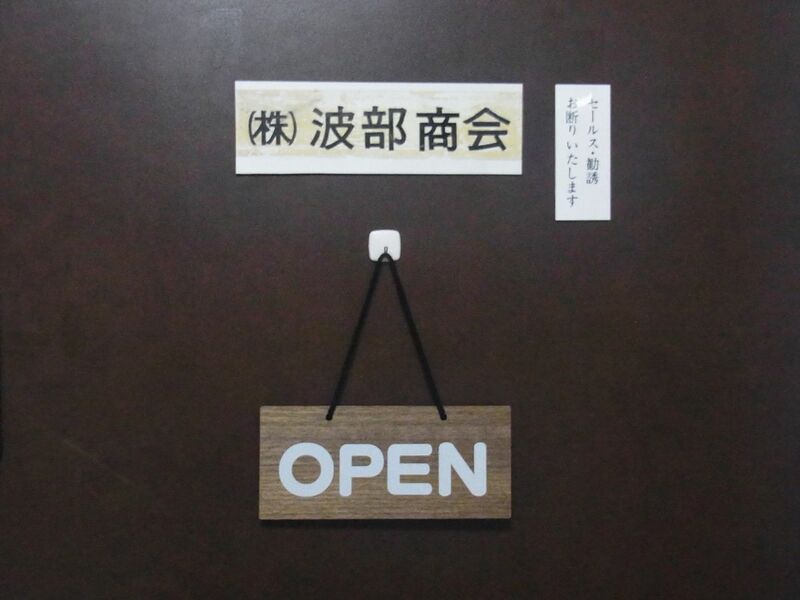 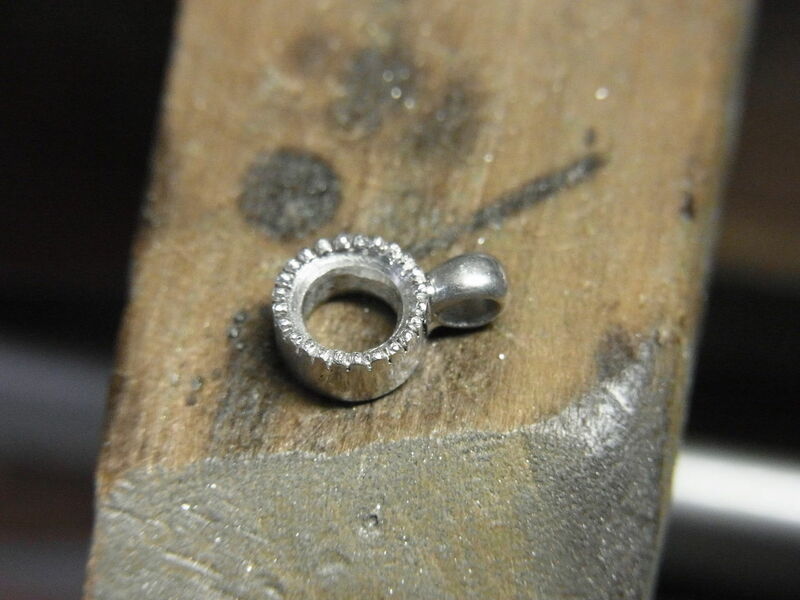 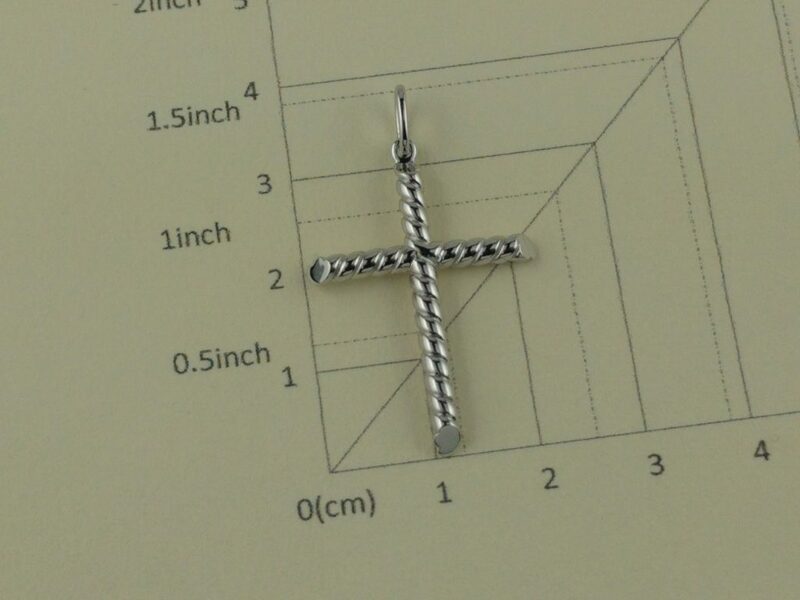 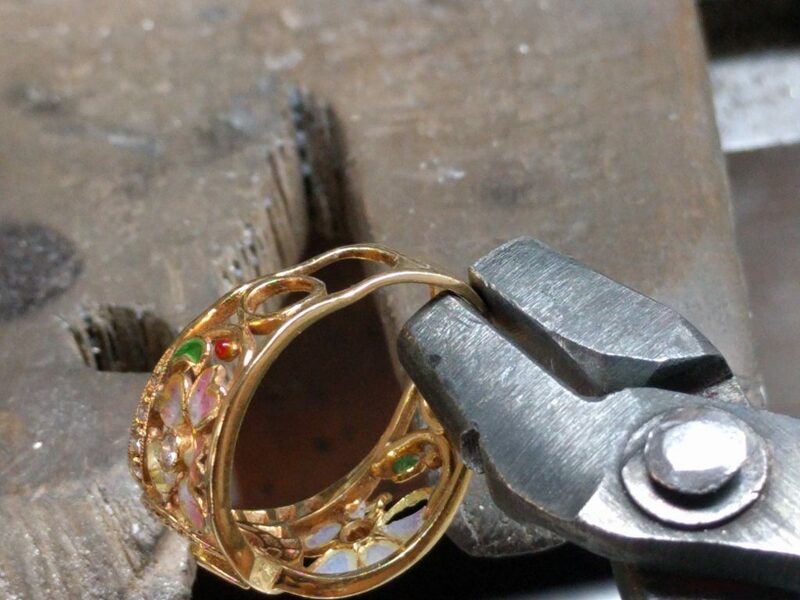 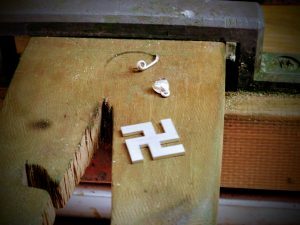 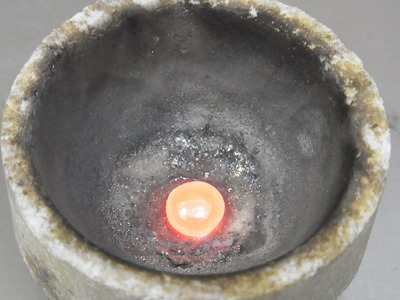 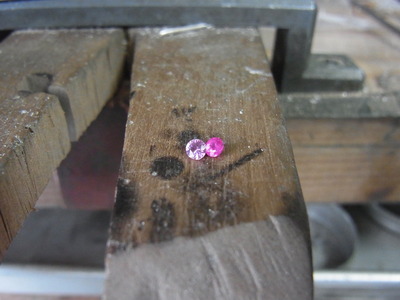 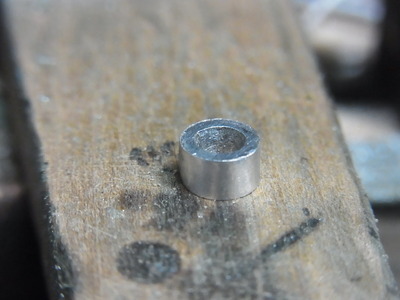 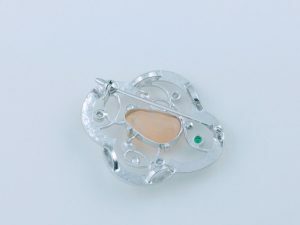 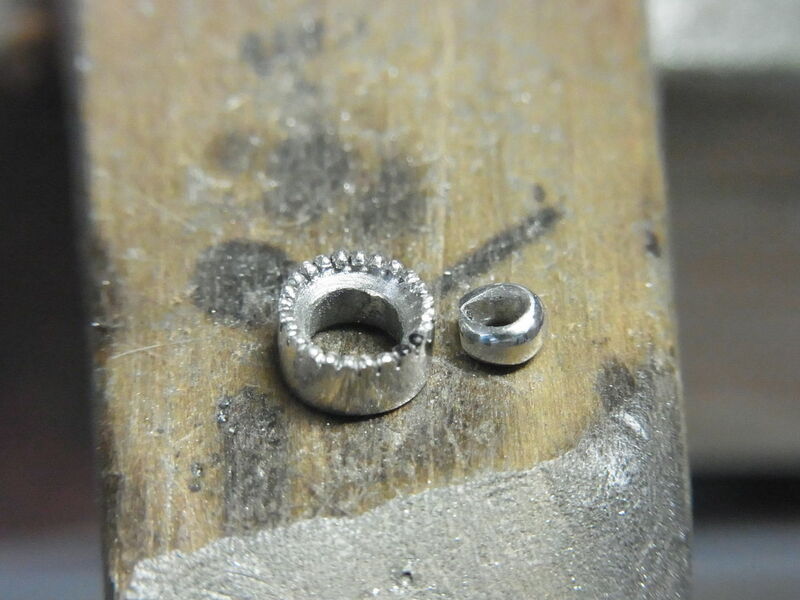 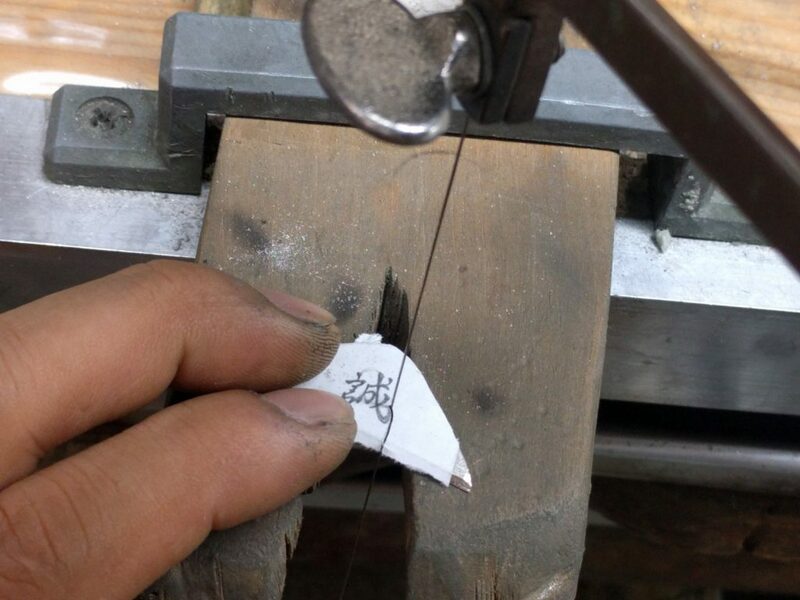 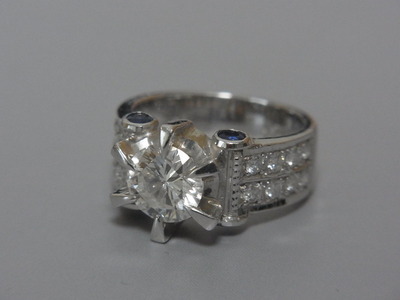 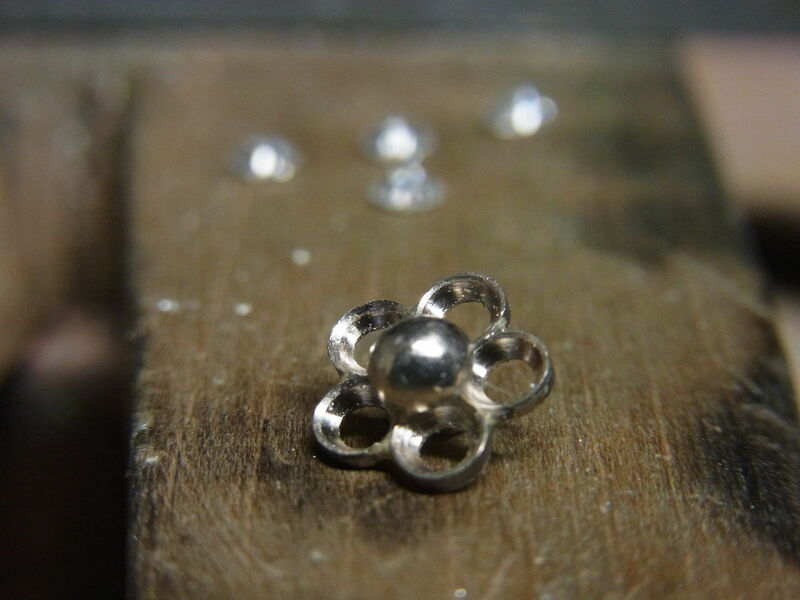 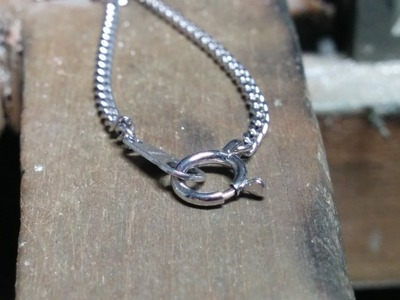 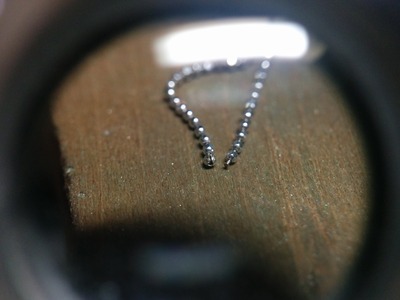 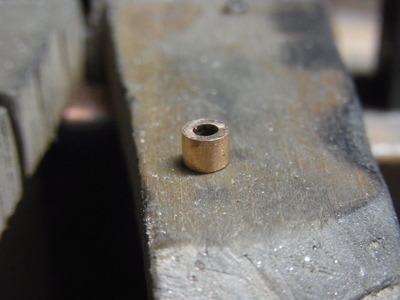 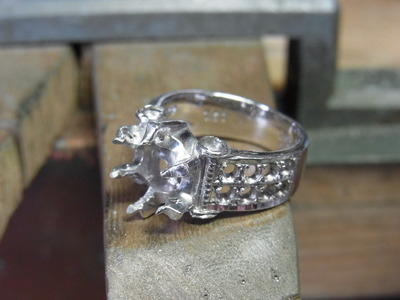 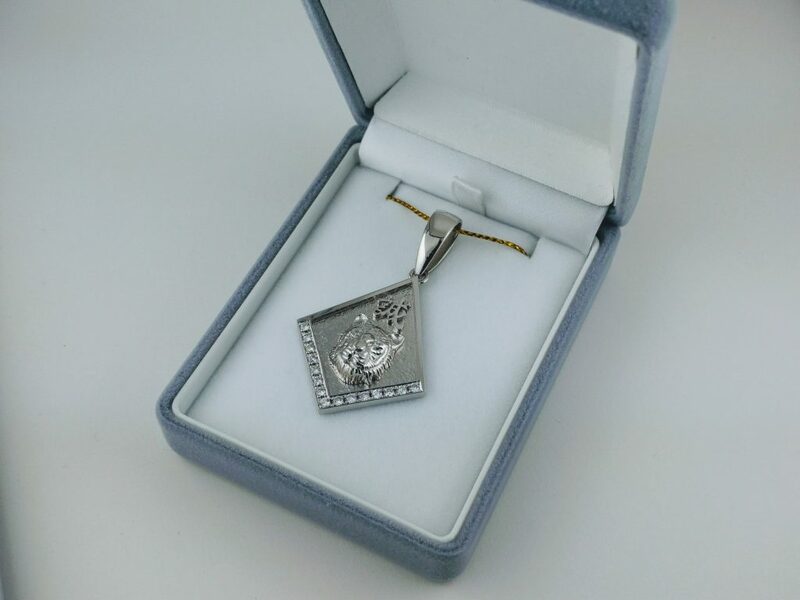 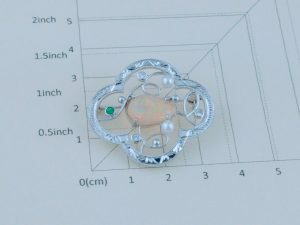 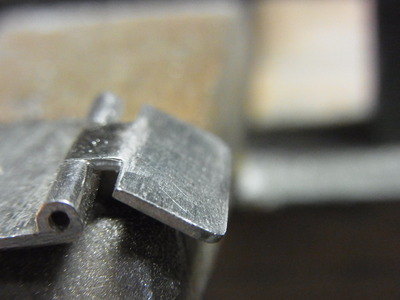 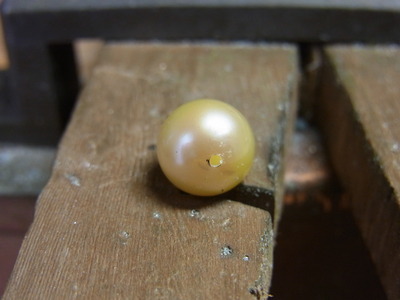 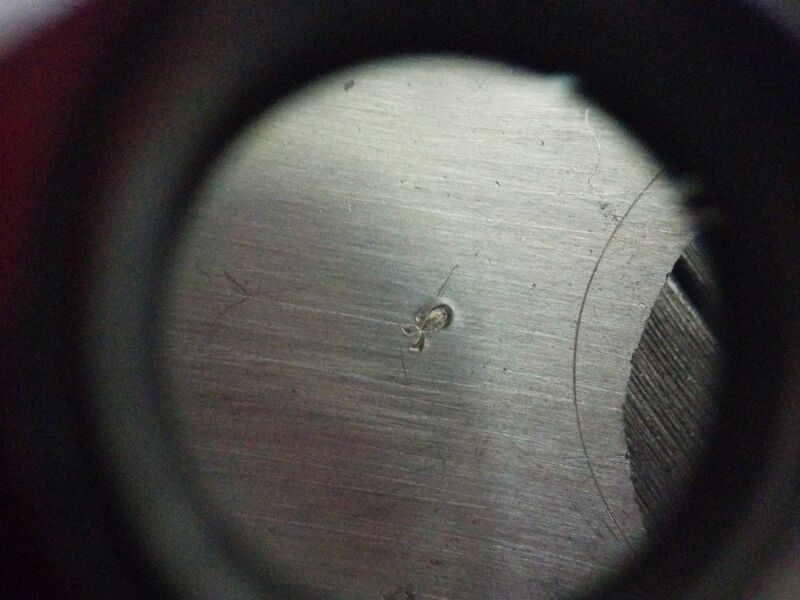 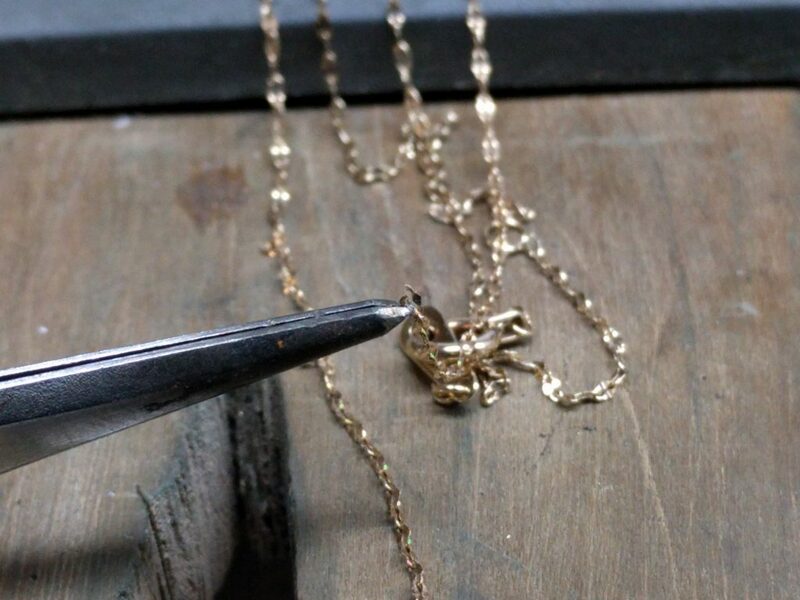 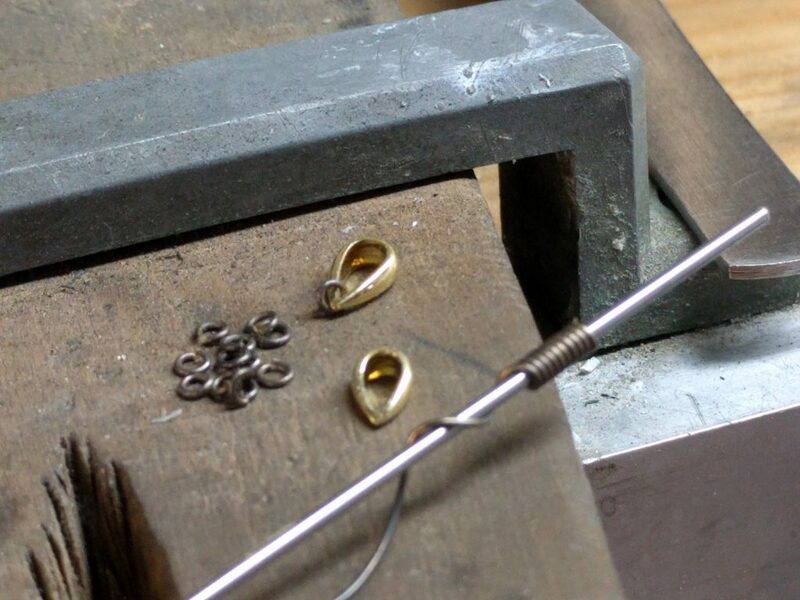 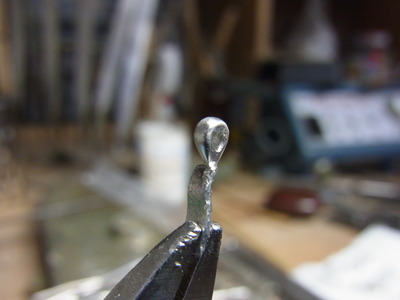 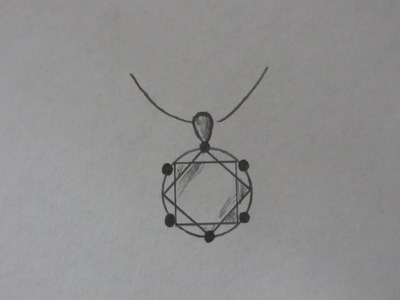 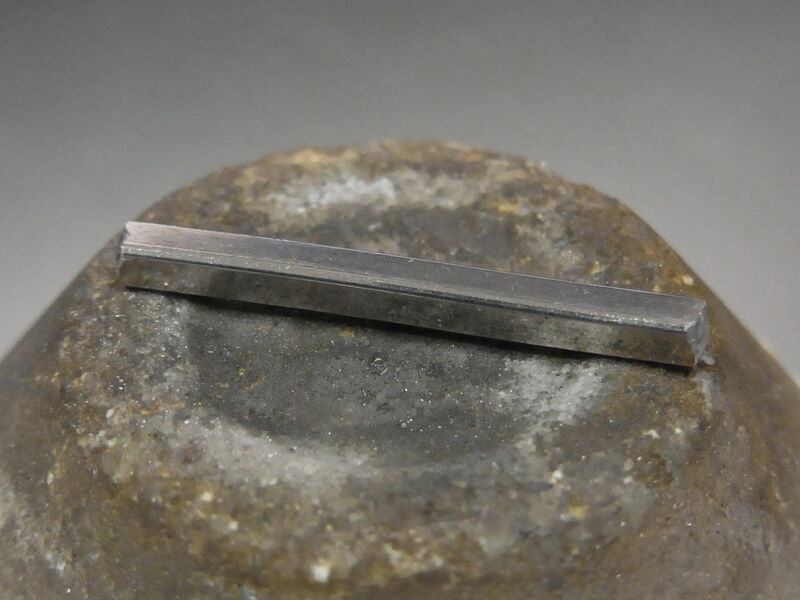 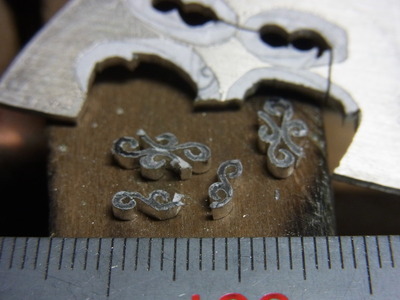 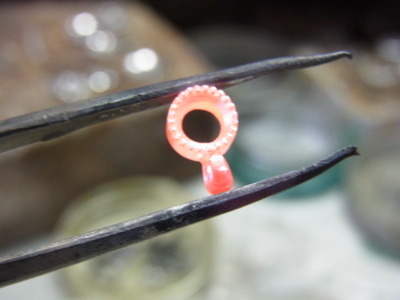 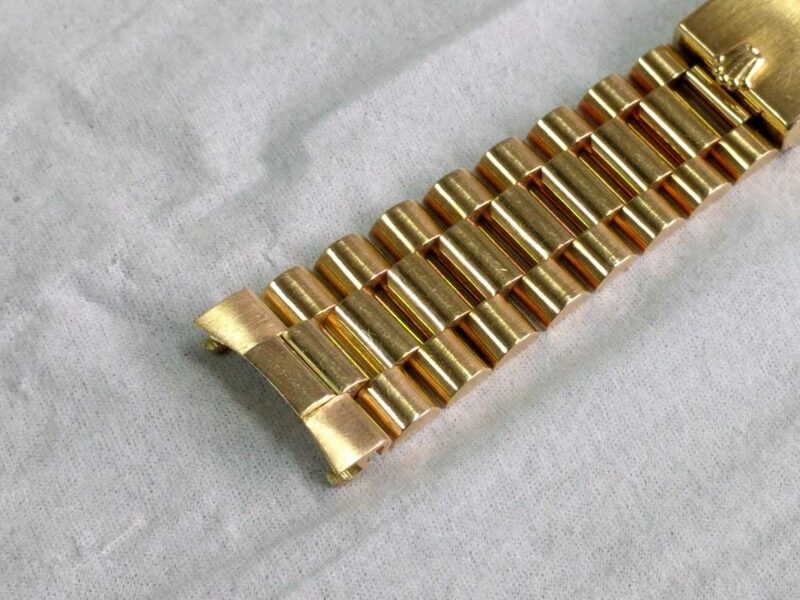 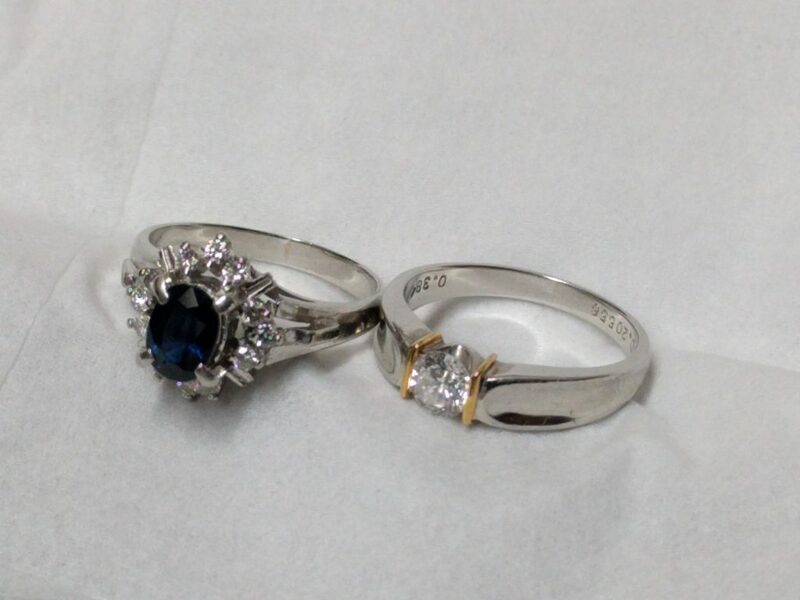 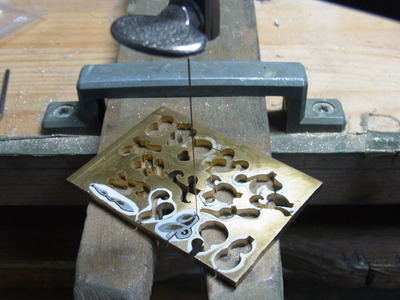 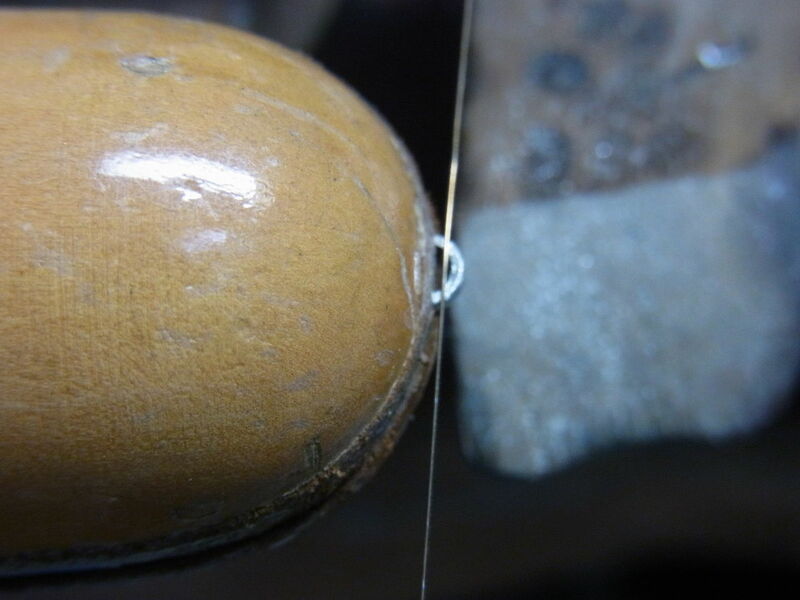 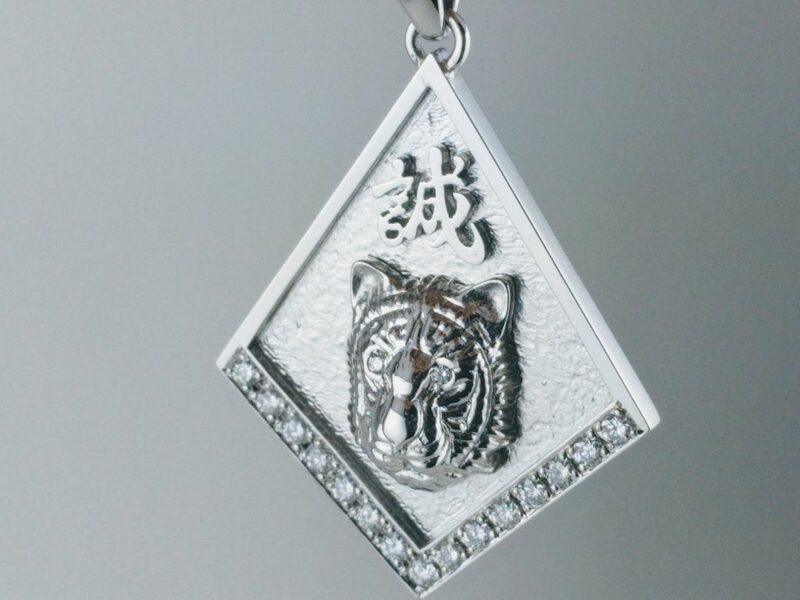 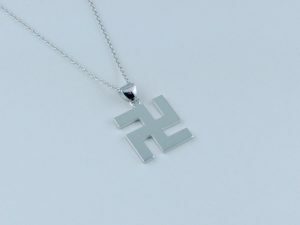 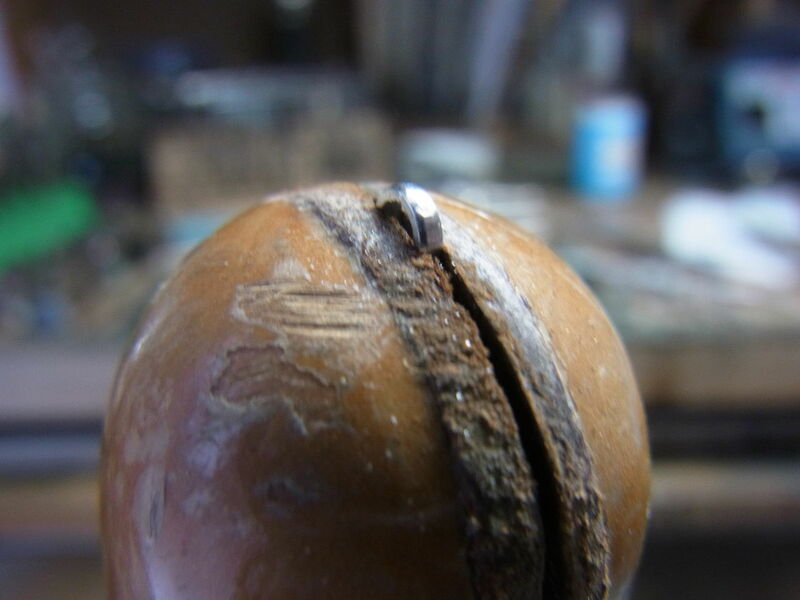 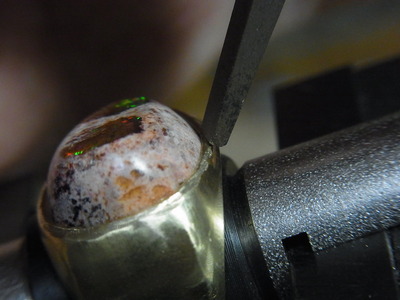 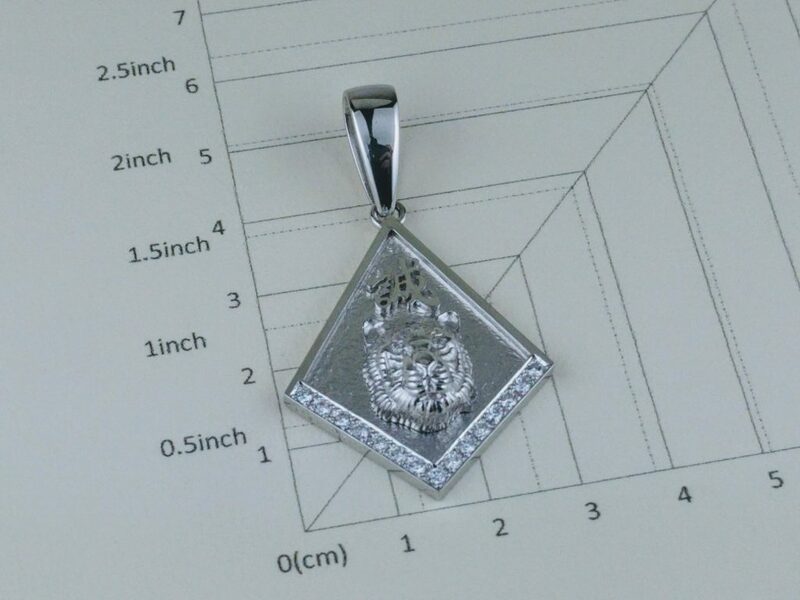 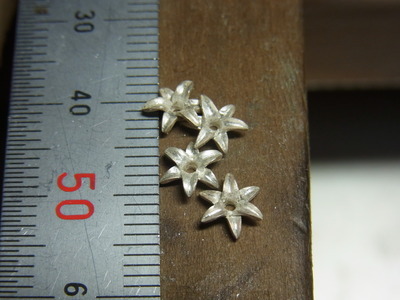 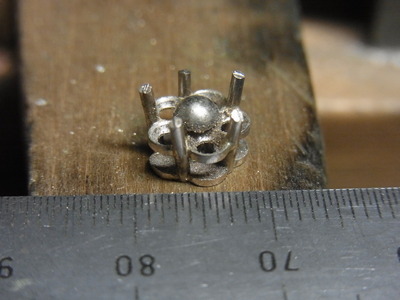 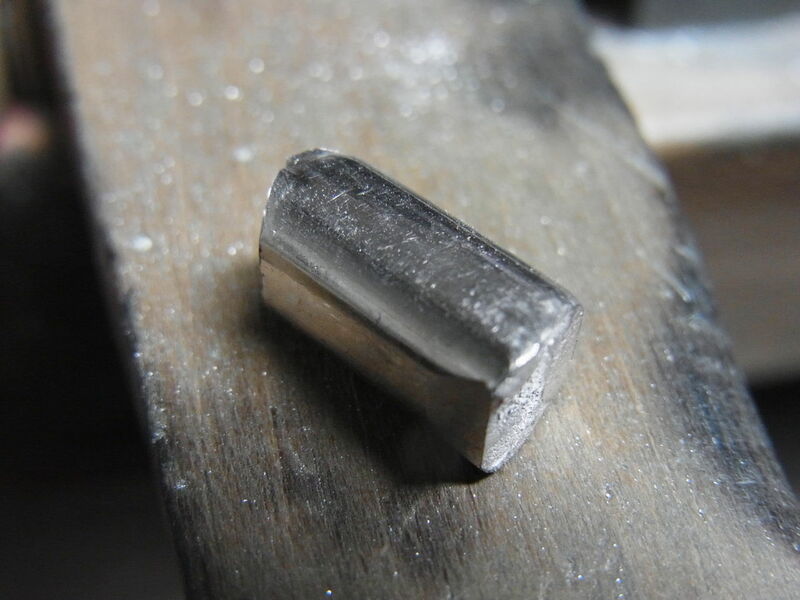 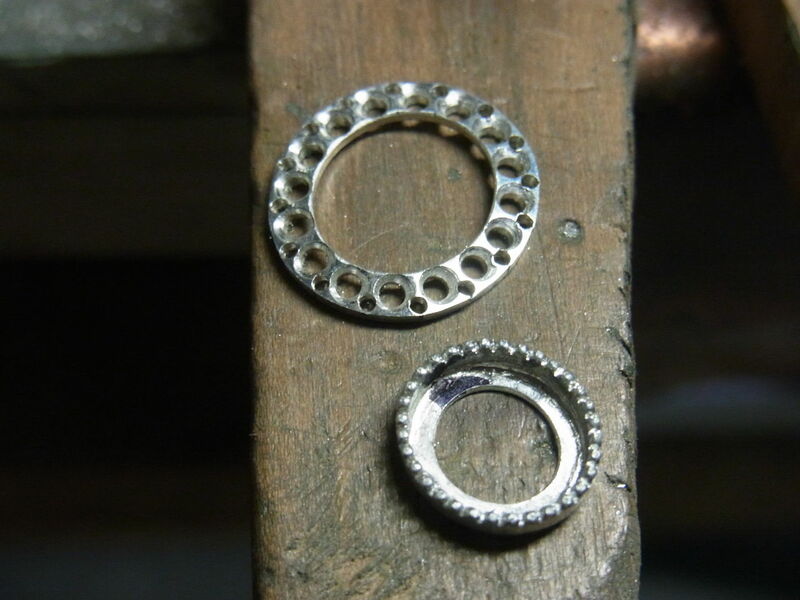 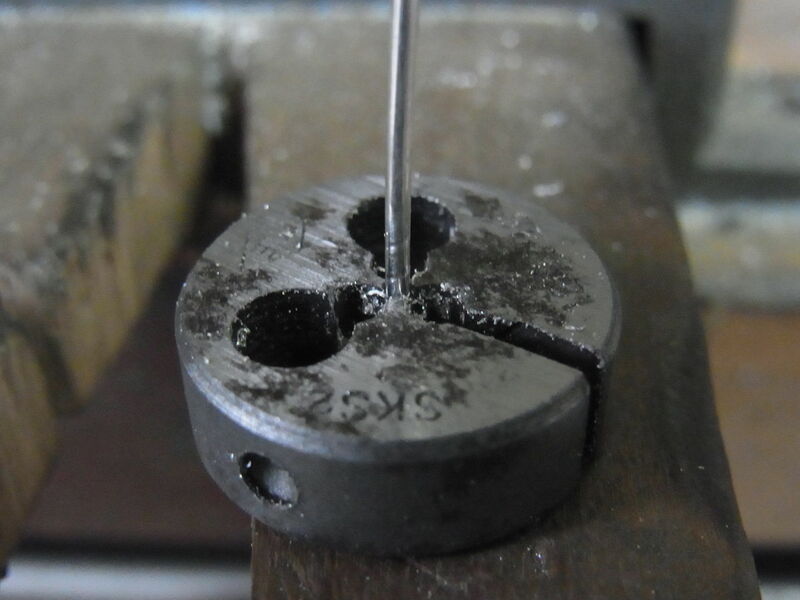 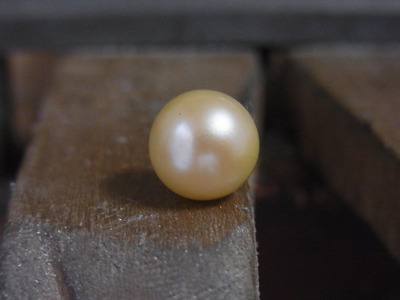 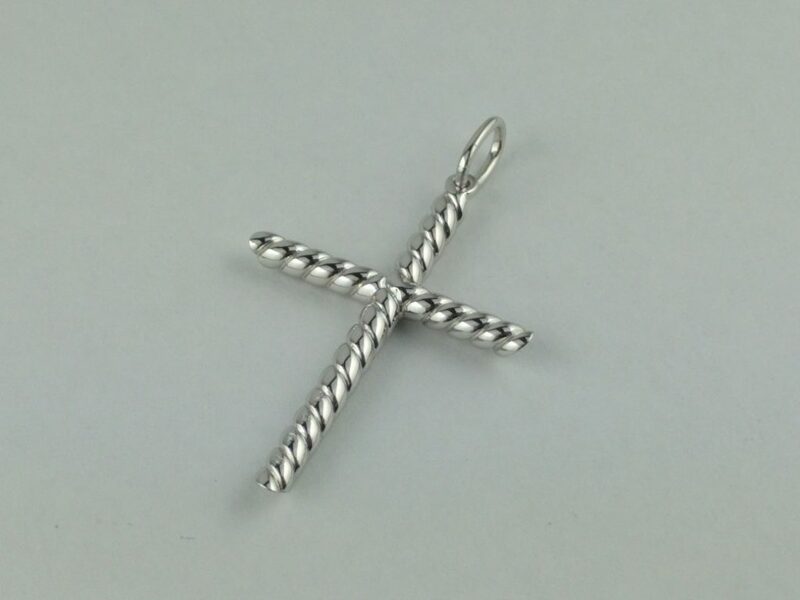 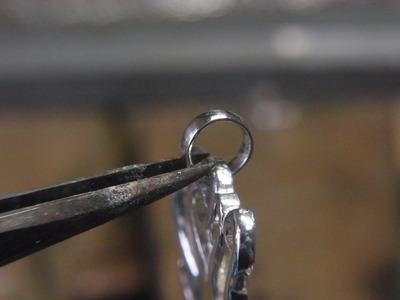 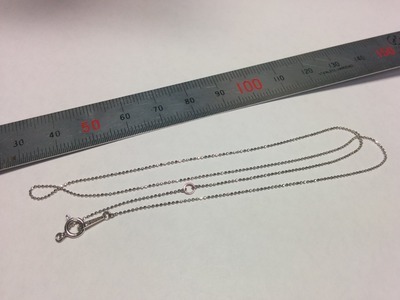 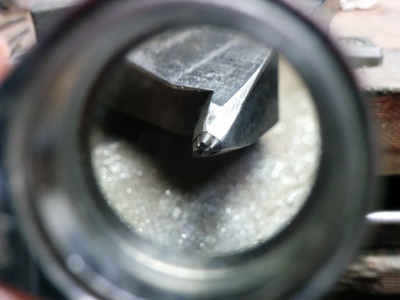 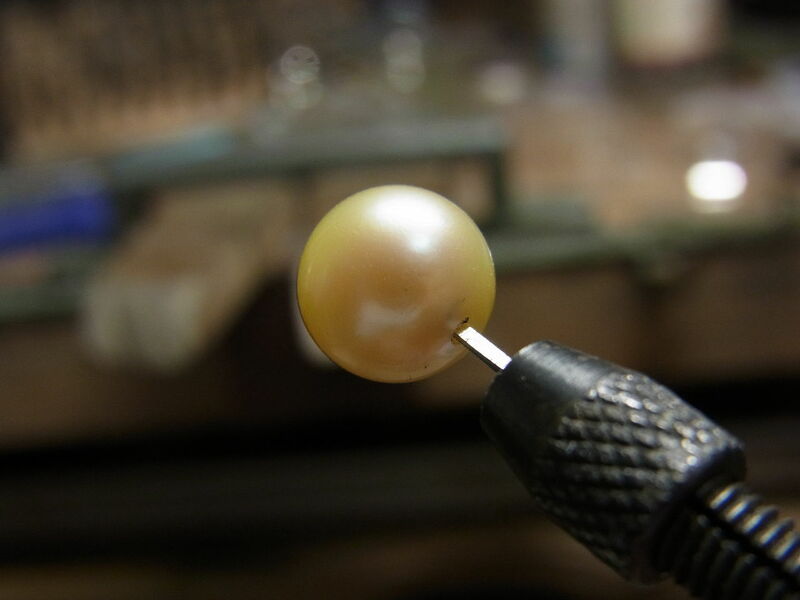 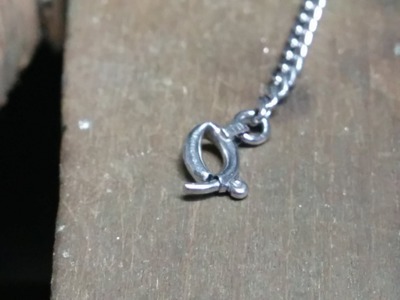 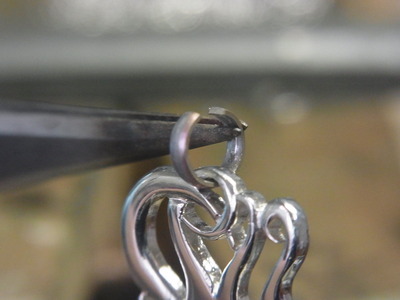 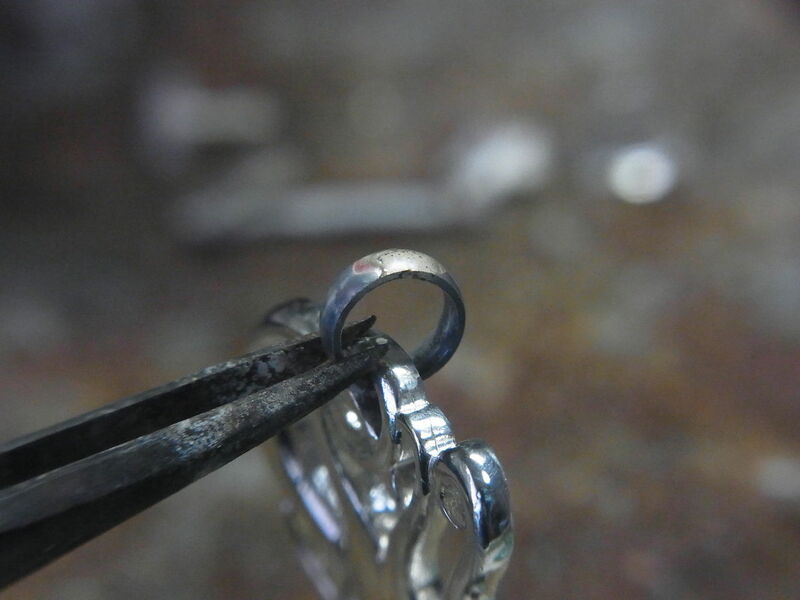 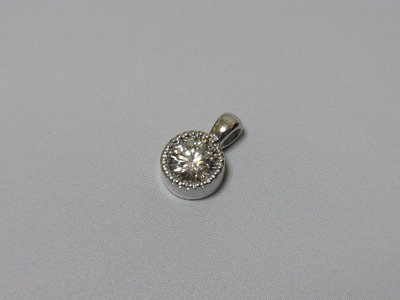 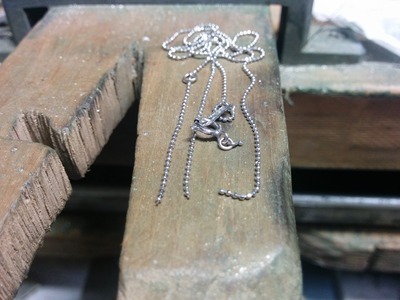 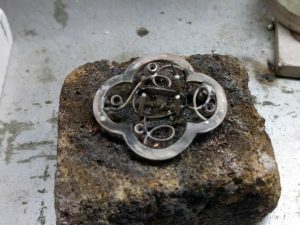 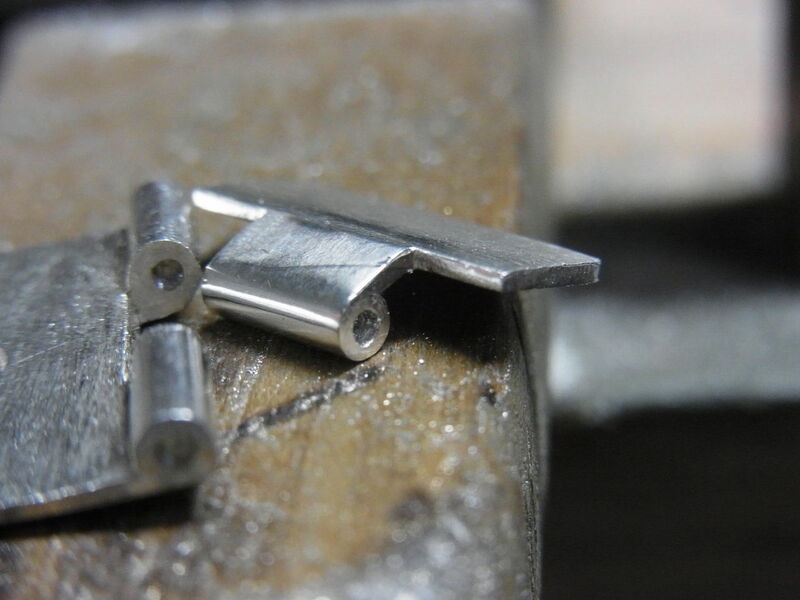 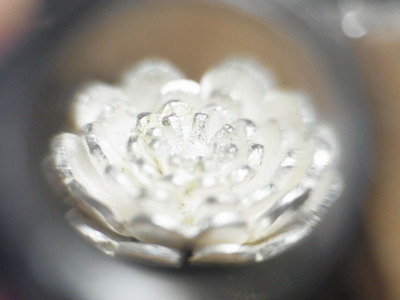 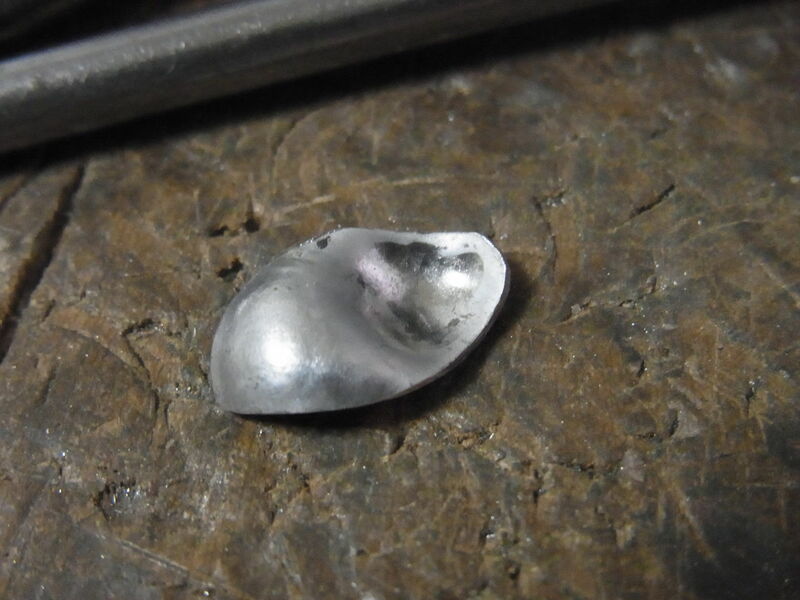 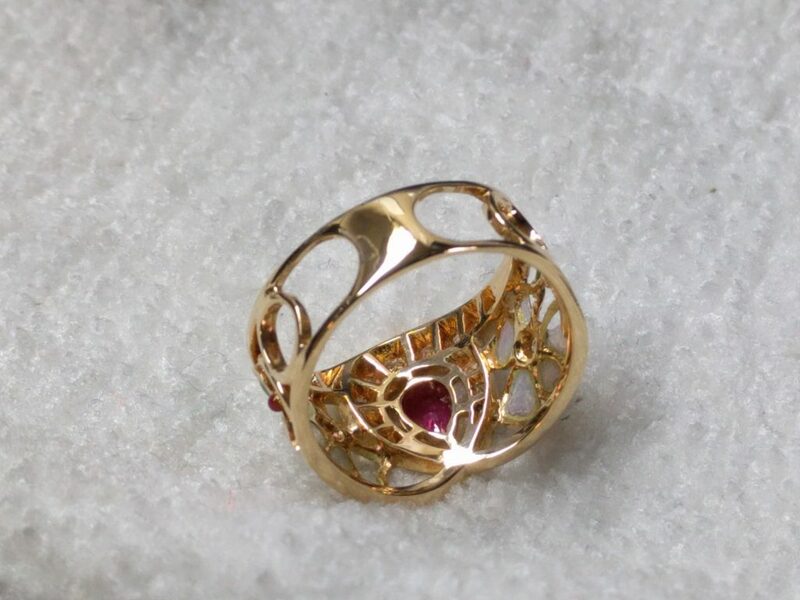 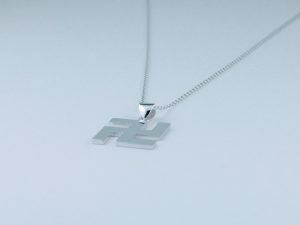 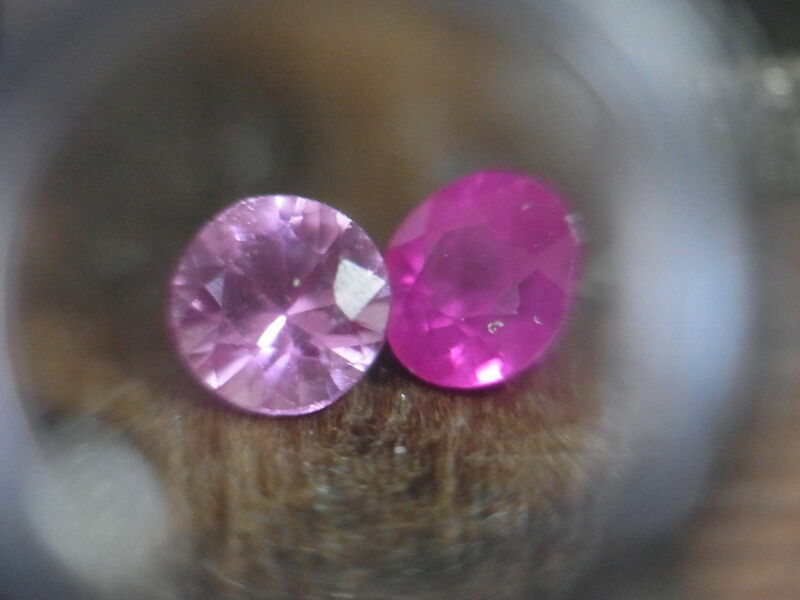 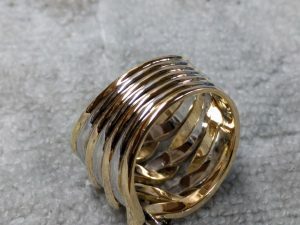 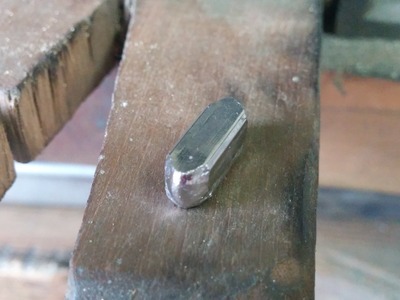 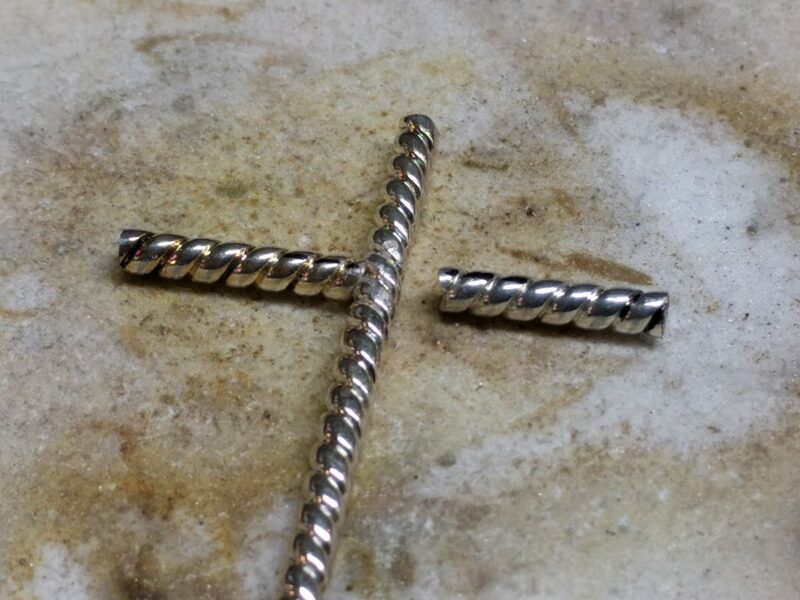 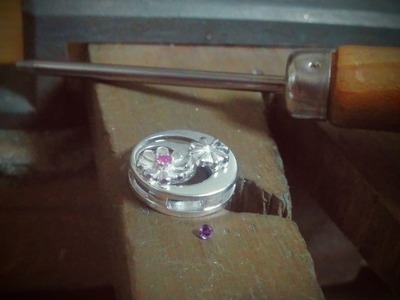 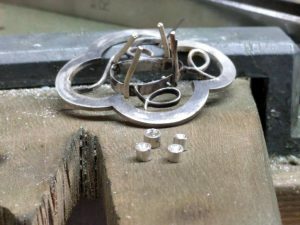 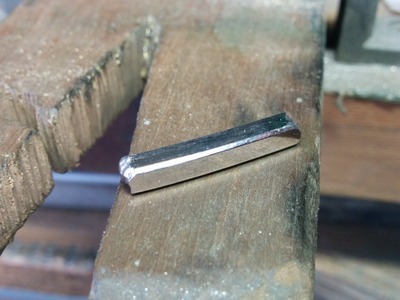 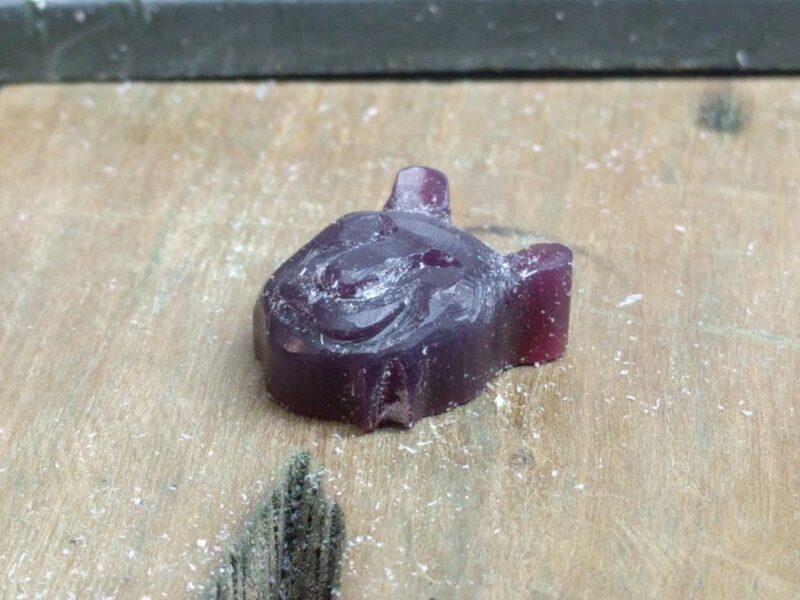 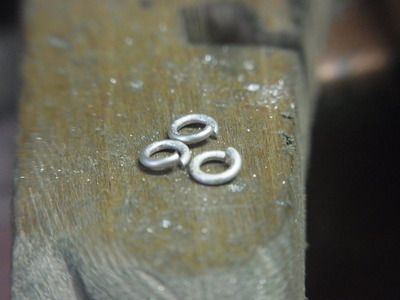 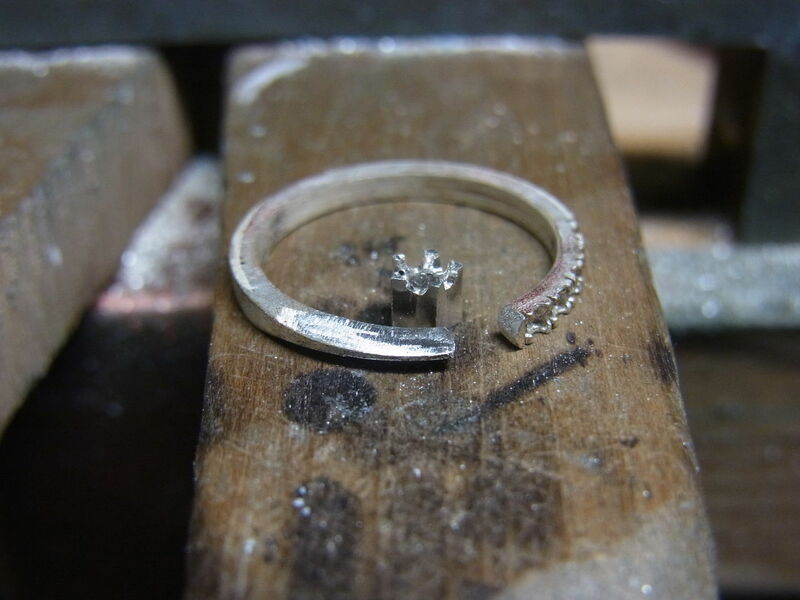 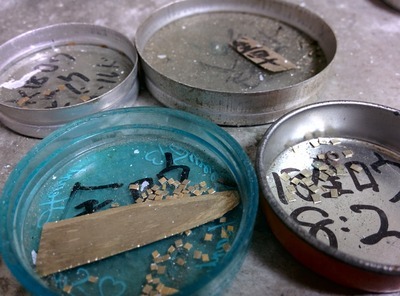 Jewelry craftman needs to use solder properly.↓Original arrange solder. 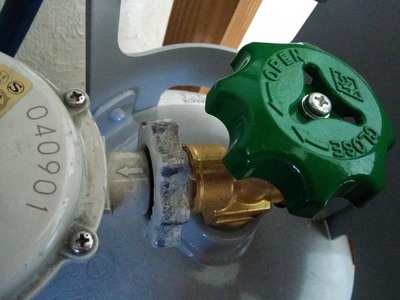 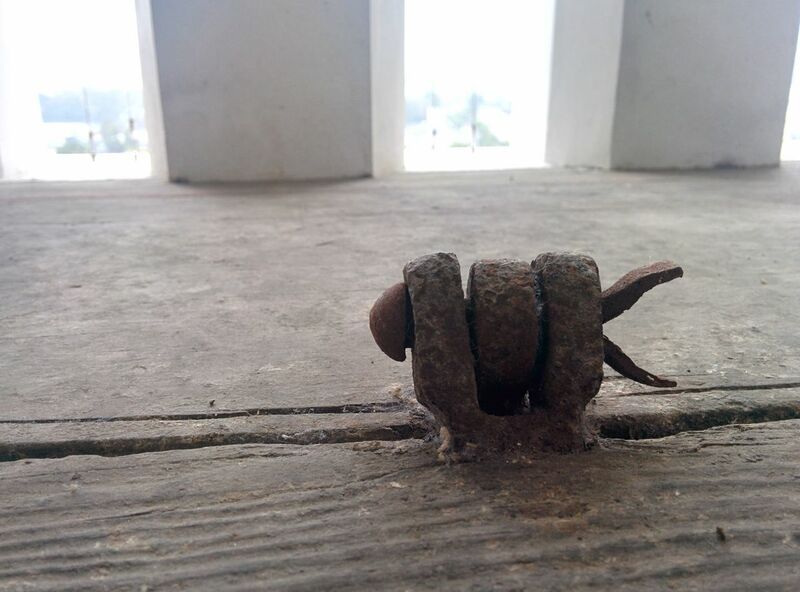 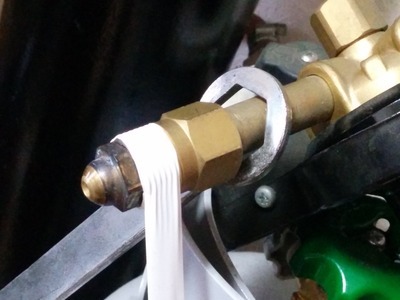 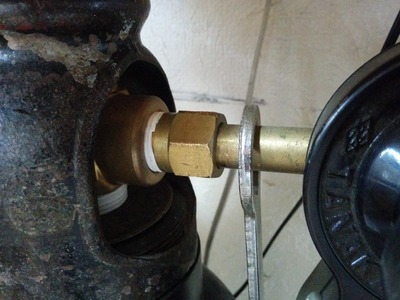 Tighten a screw against gas leak. Left in this picture is gas pressure regulator. 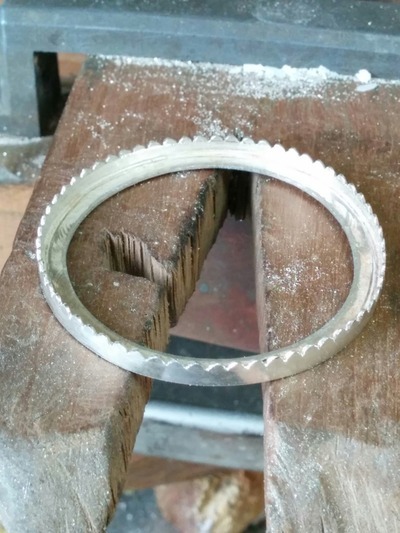 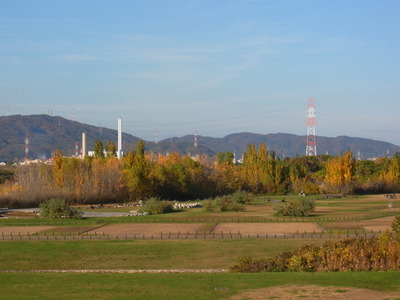 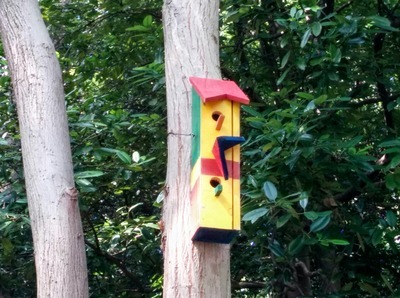 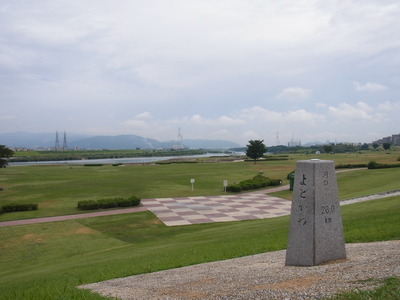 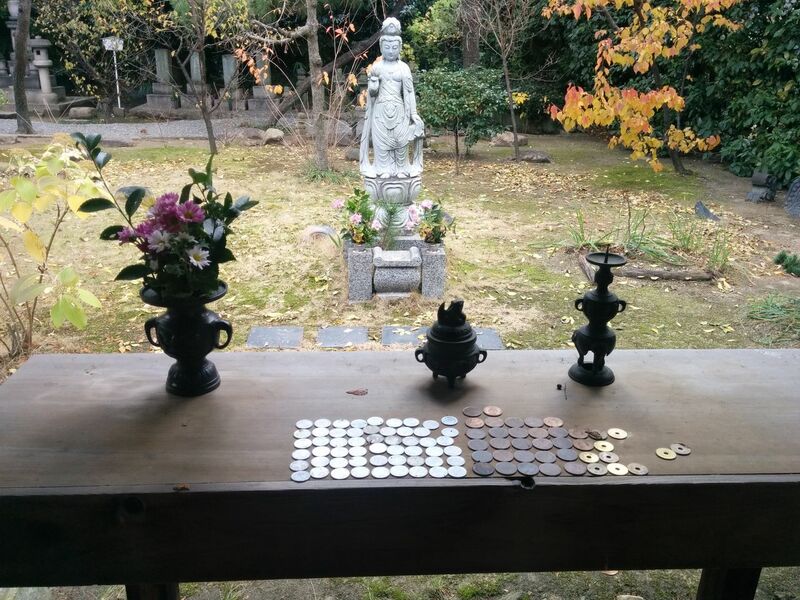 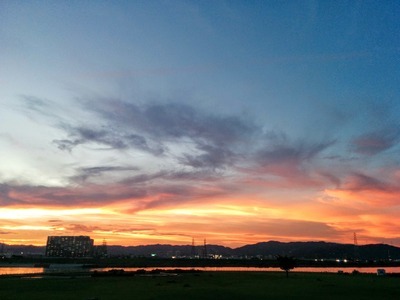 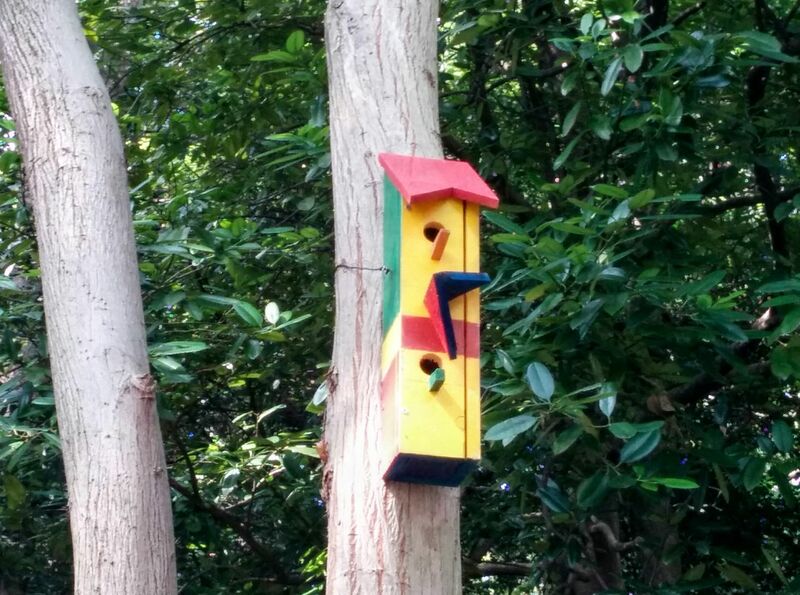 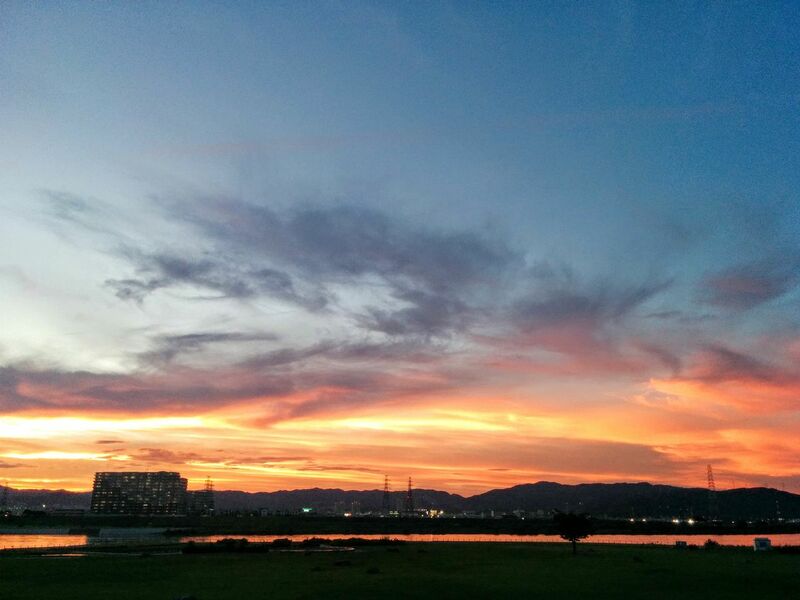 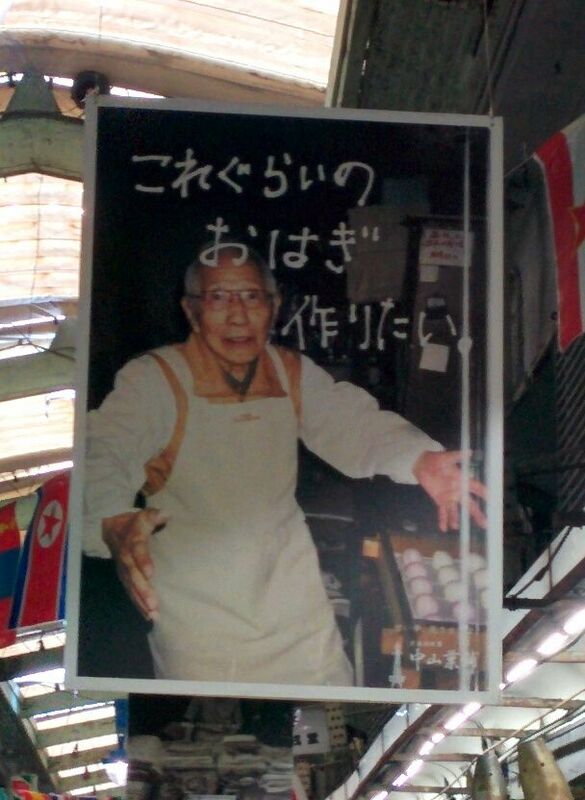 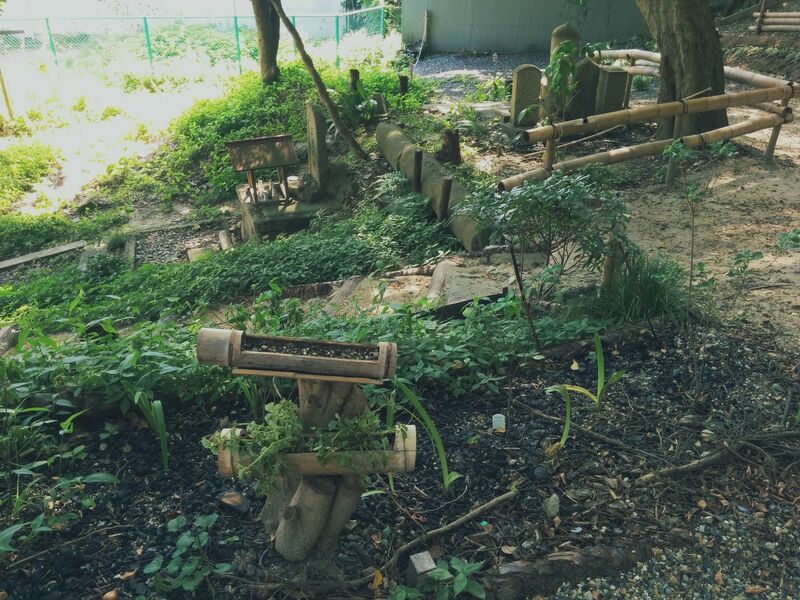 I can start making again. 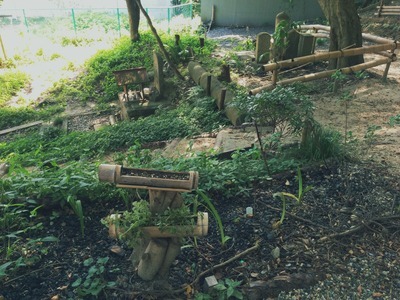 Continuation of last time. 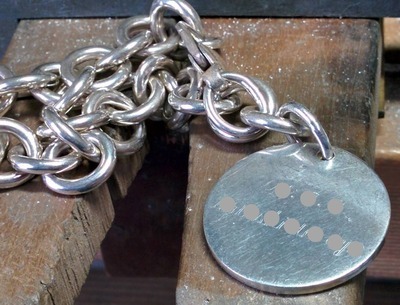 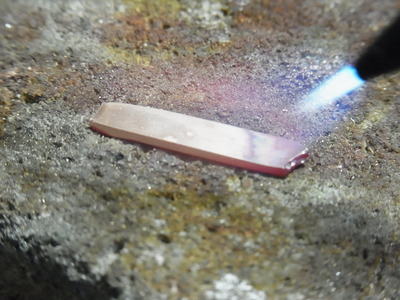 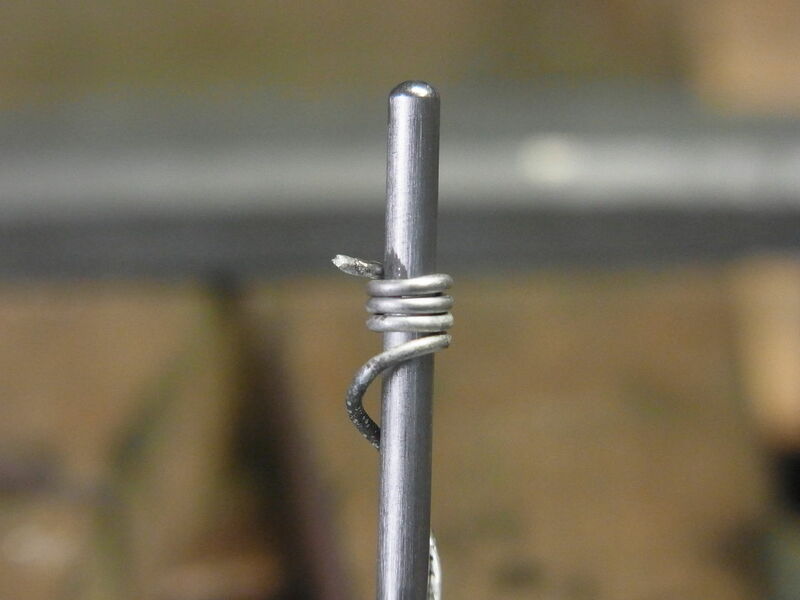 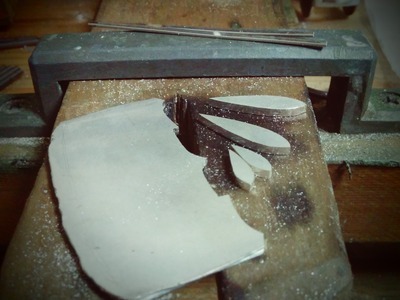 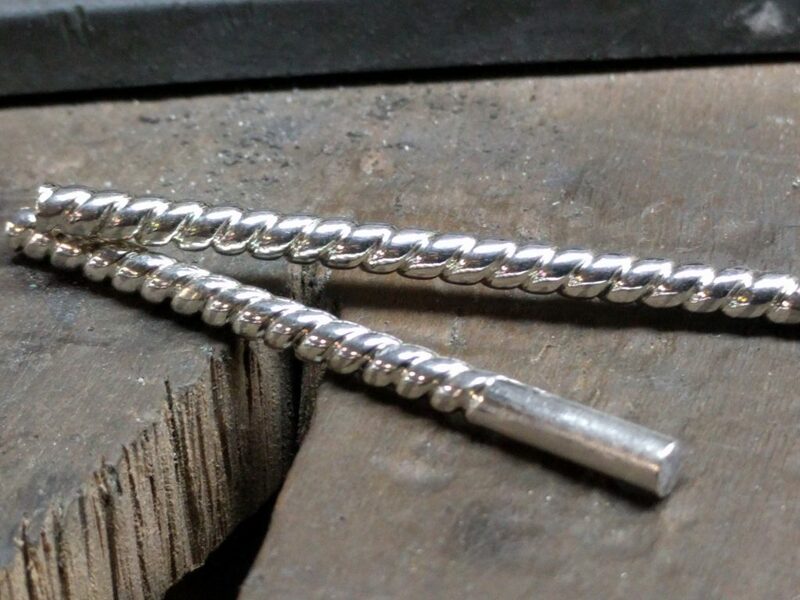 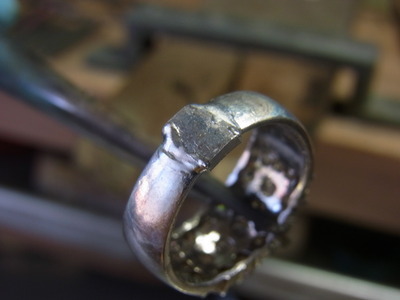 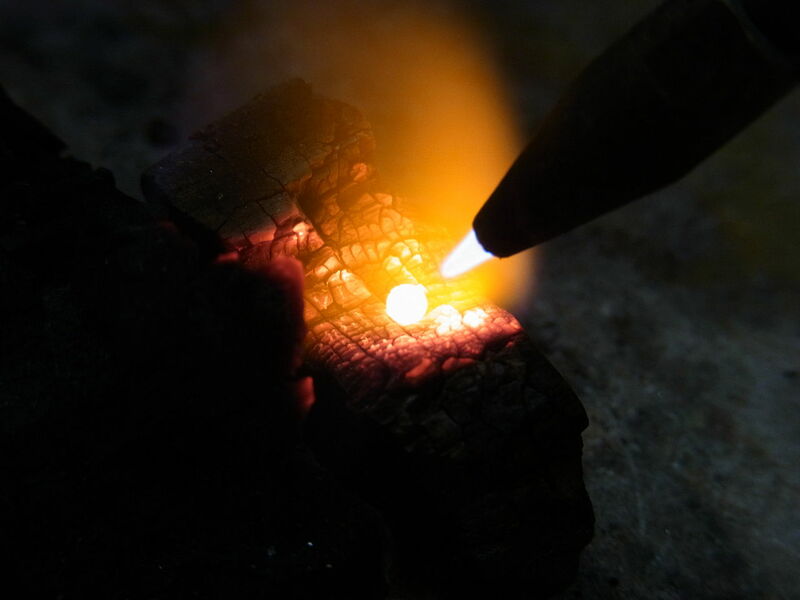 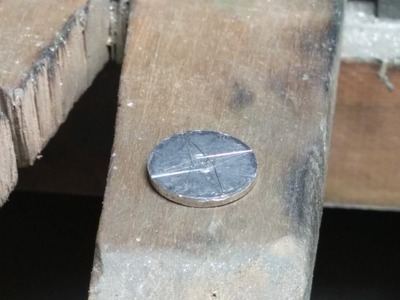 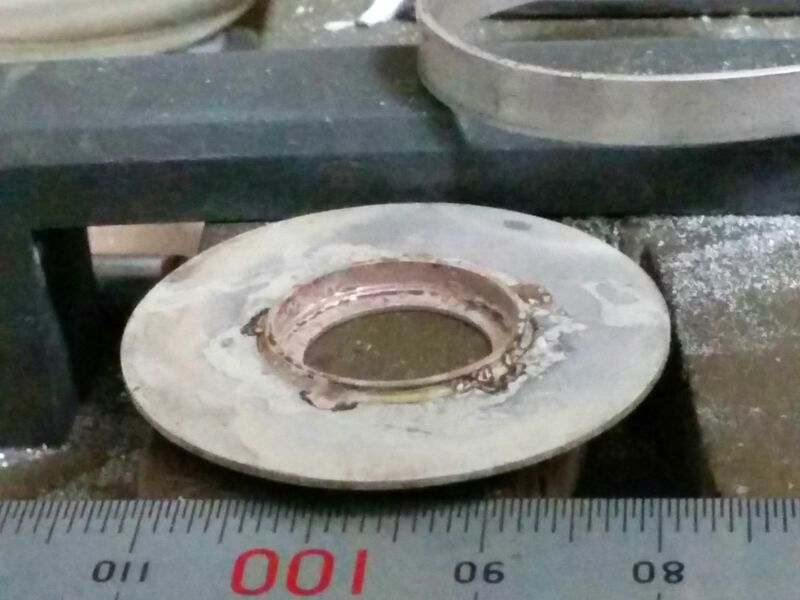 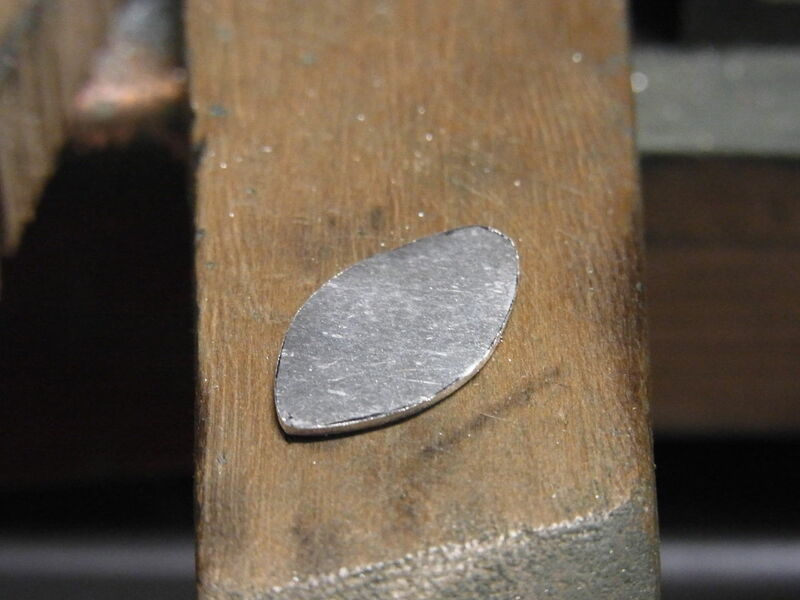 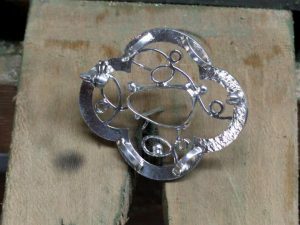 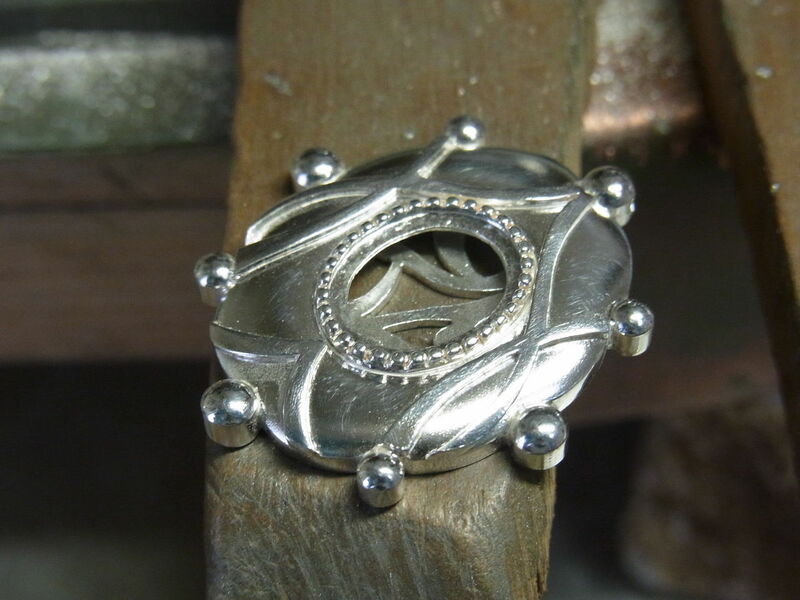 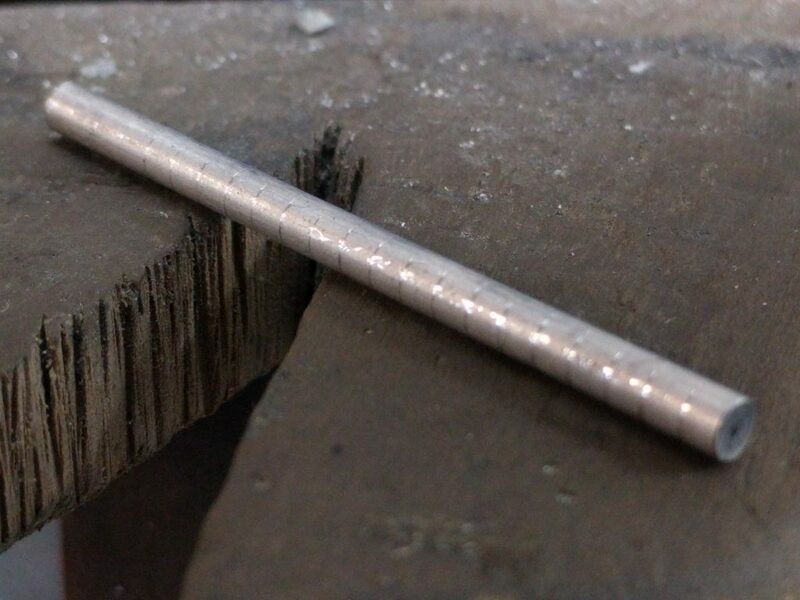 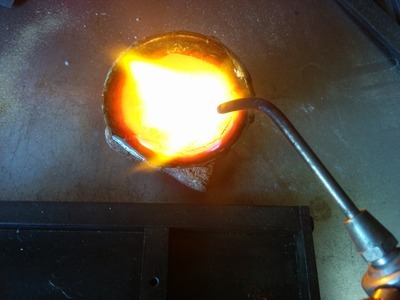 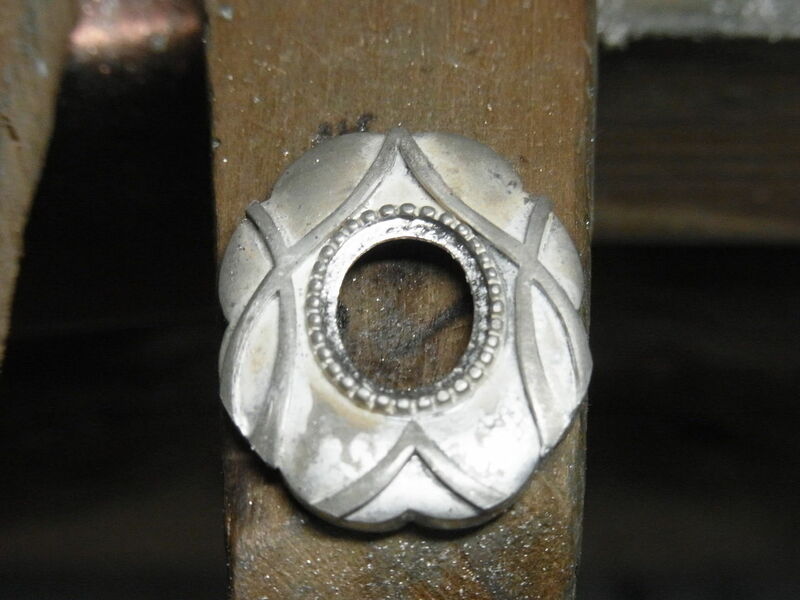 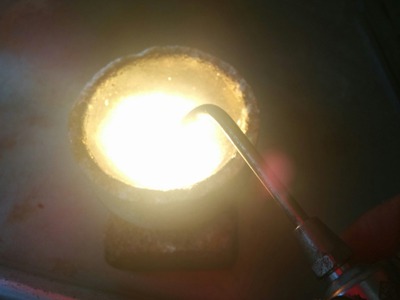 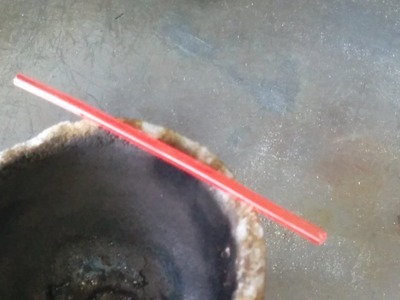 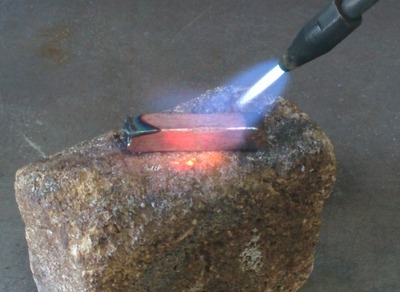 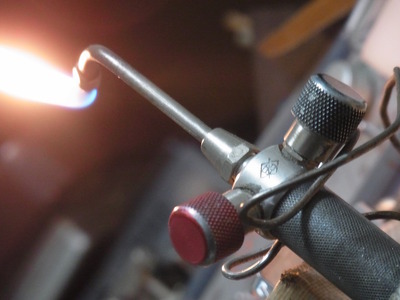 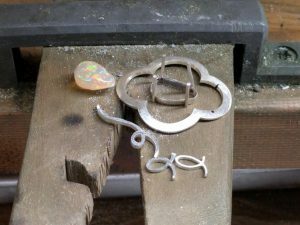 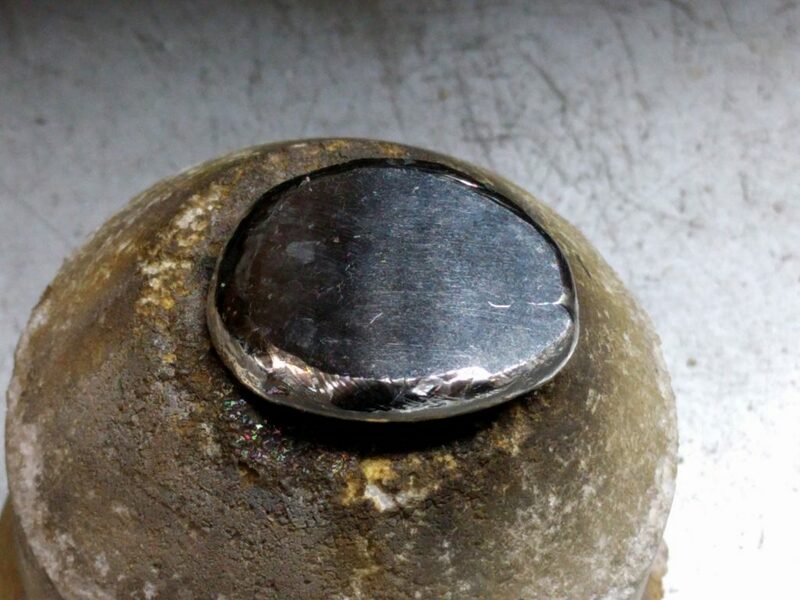 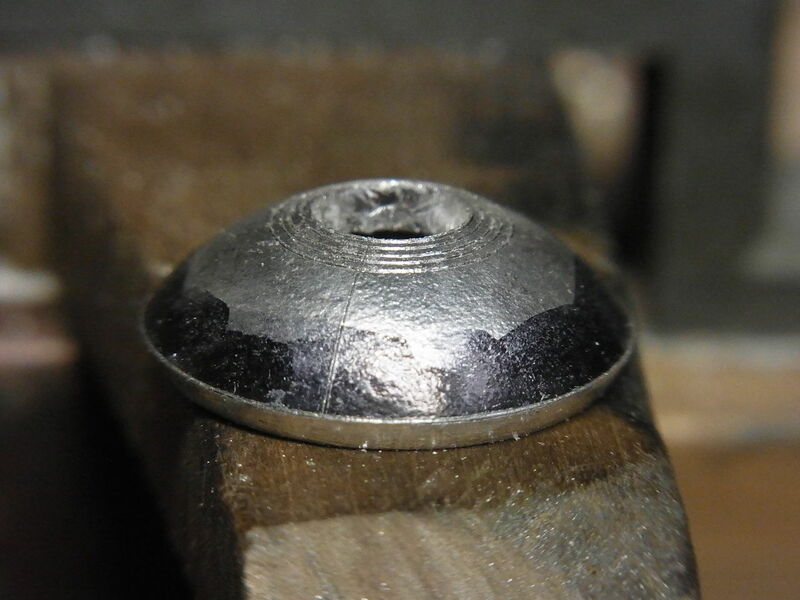 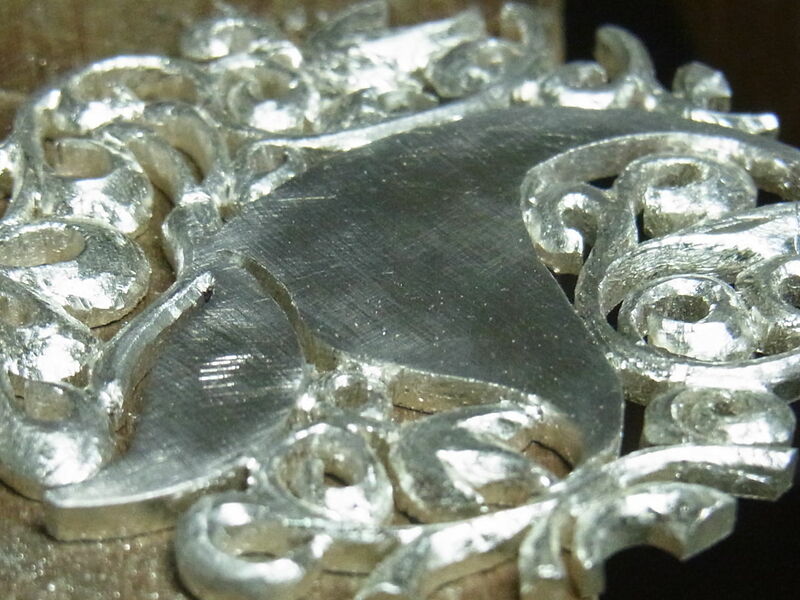 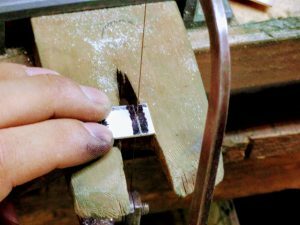 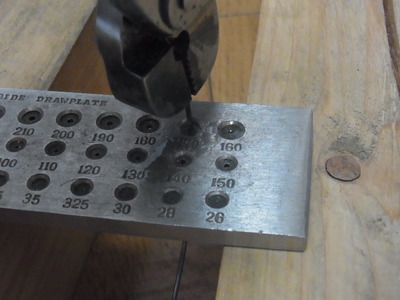 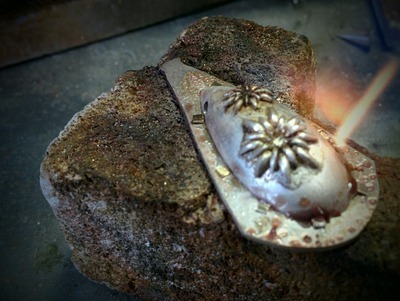 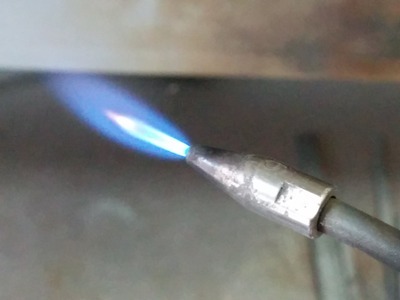 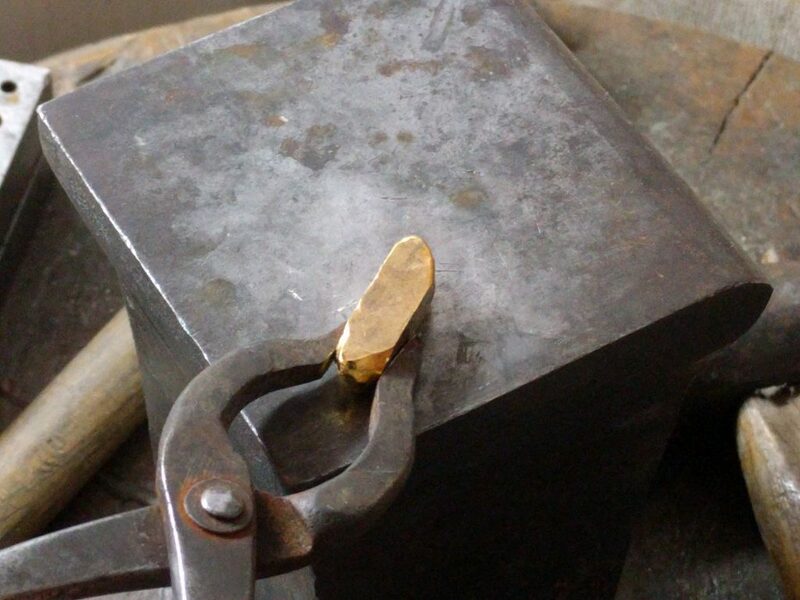 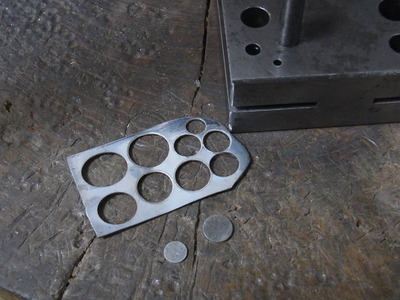 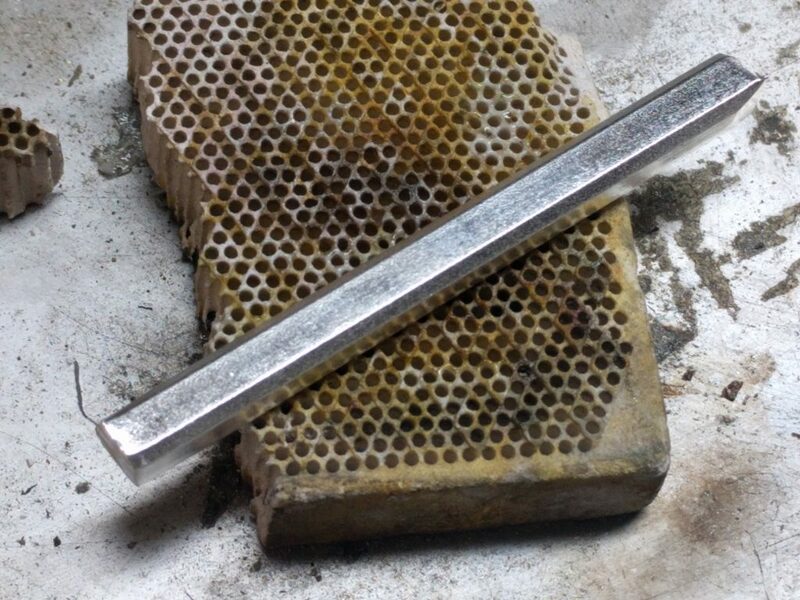 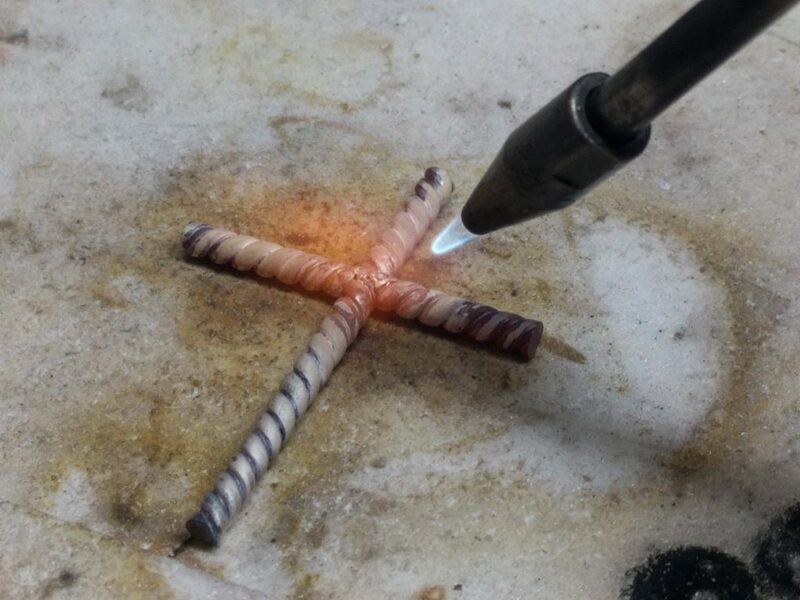 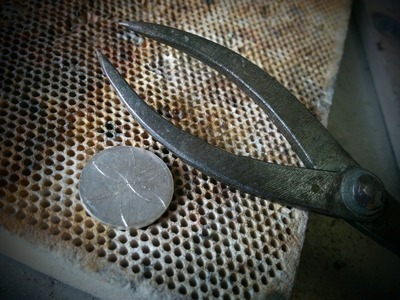 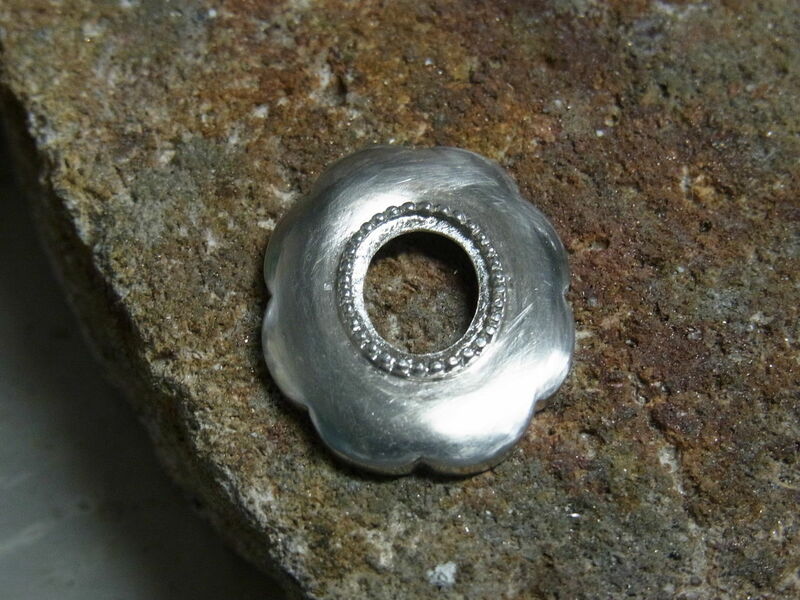 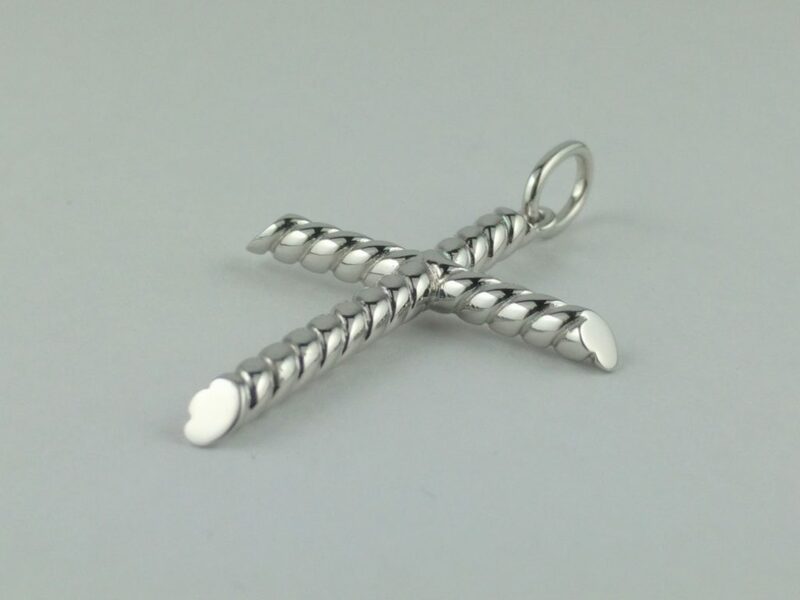 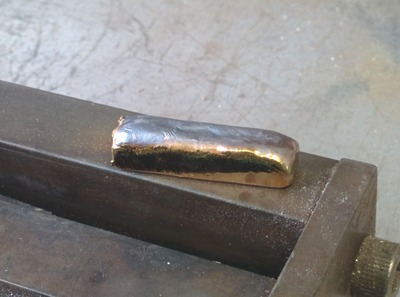 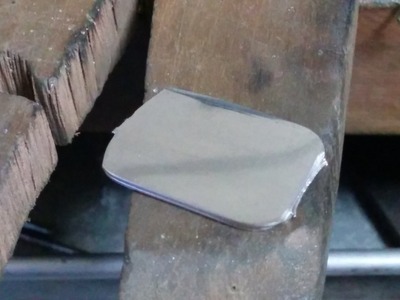 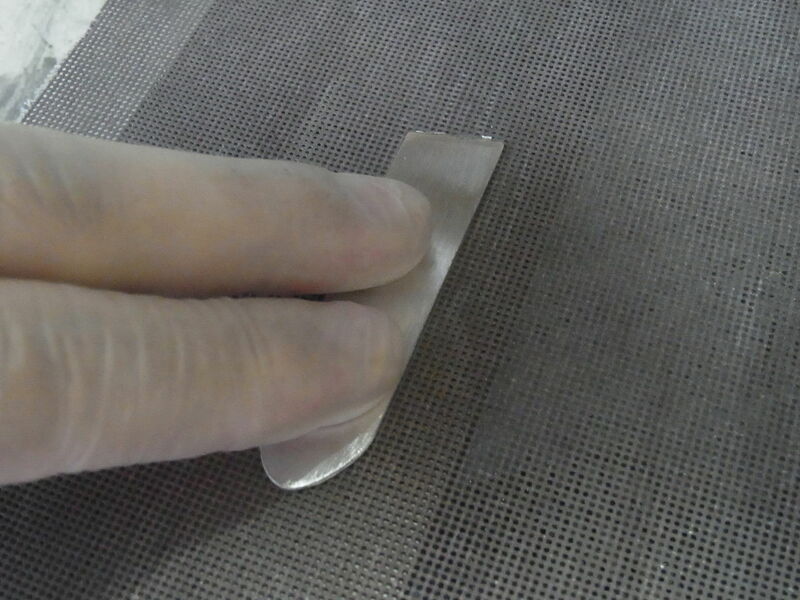 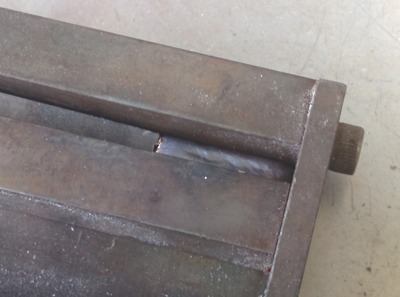 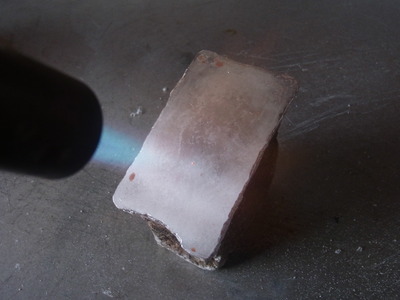 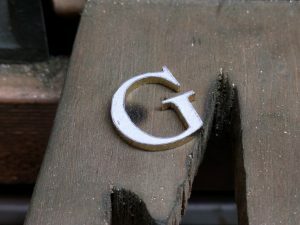 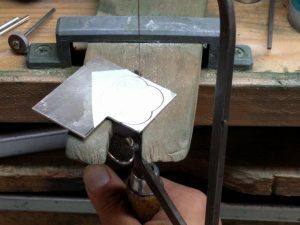 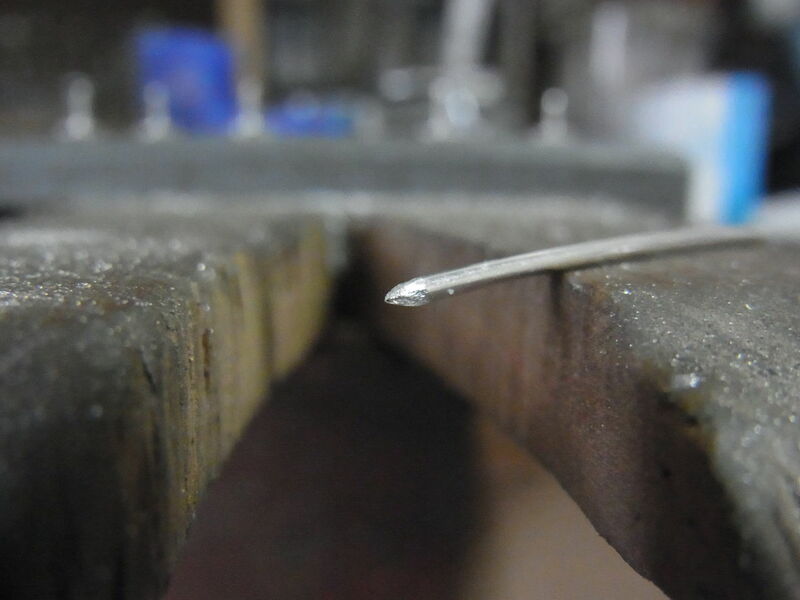 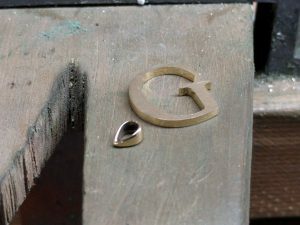 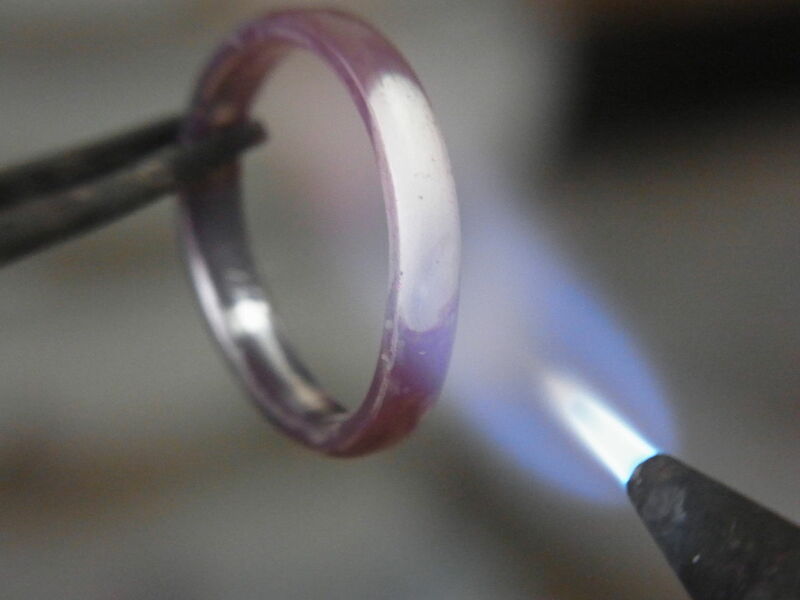 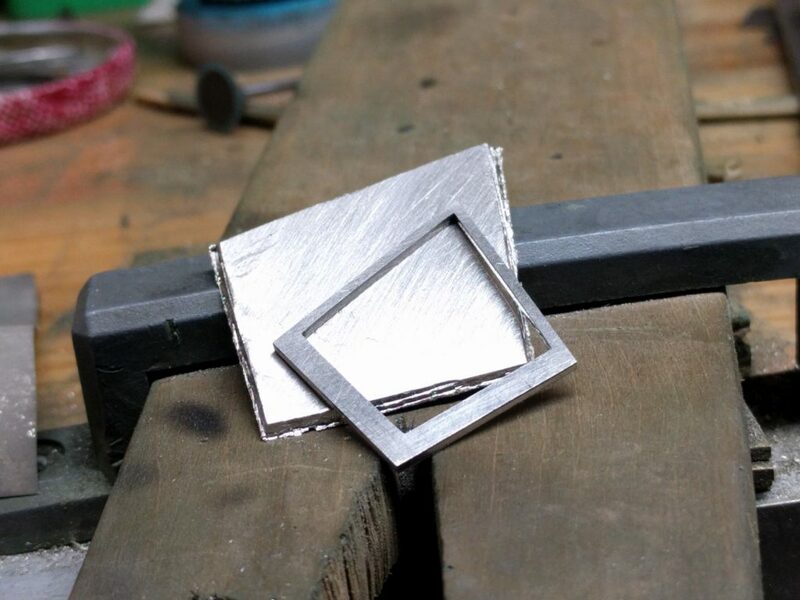 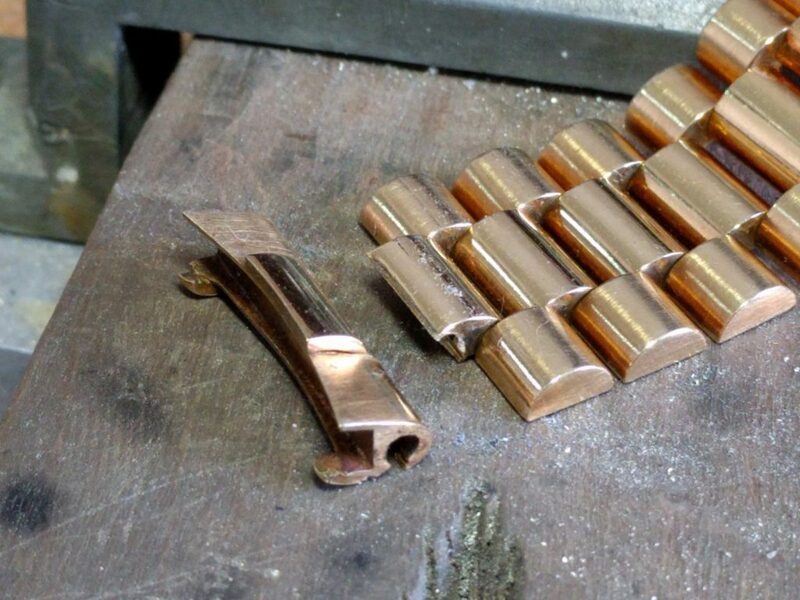 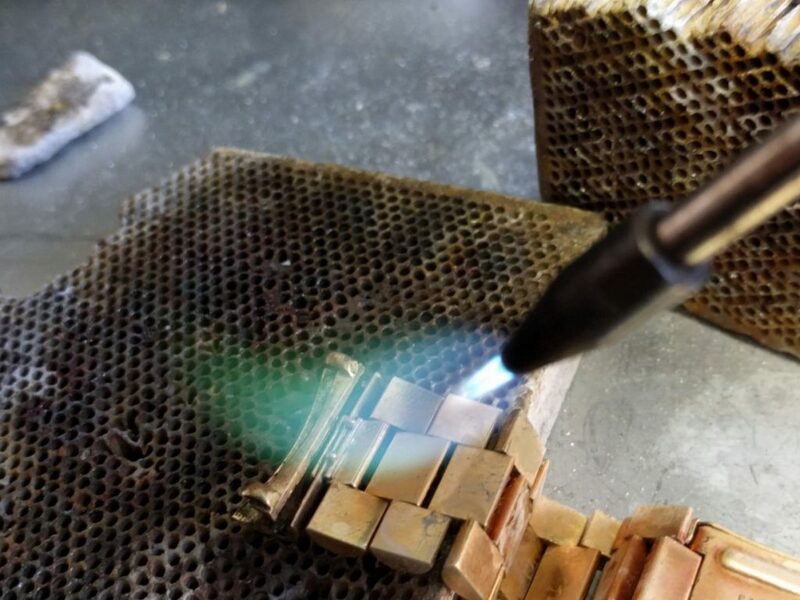 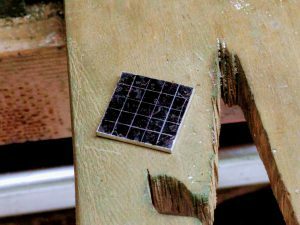 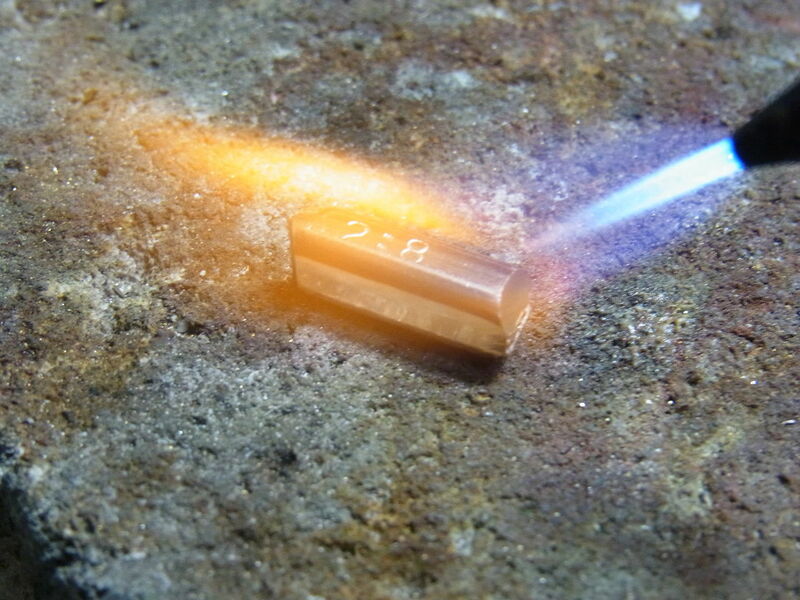 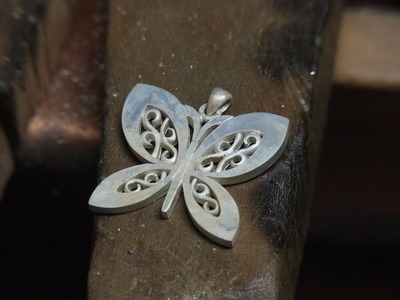 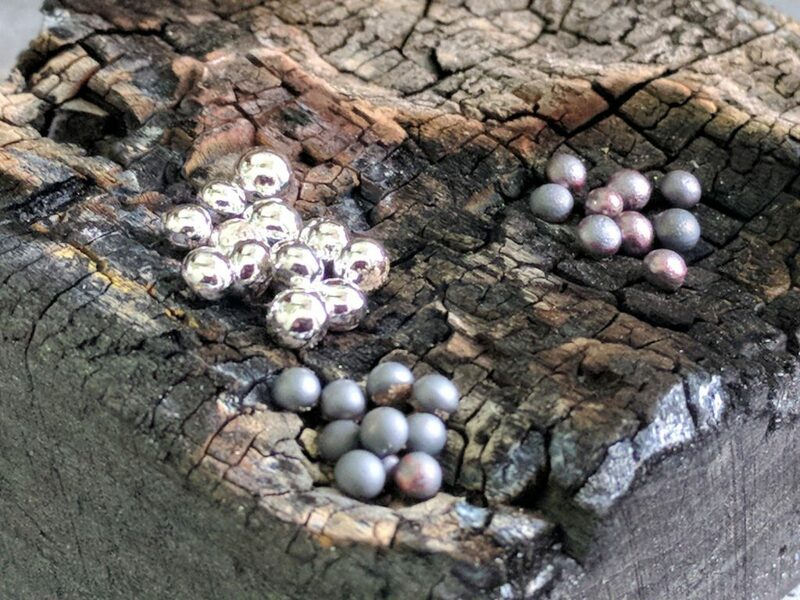 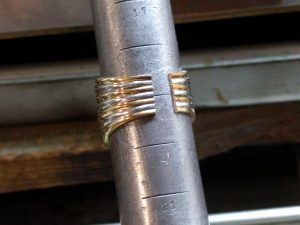 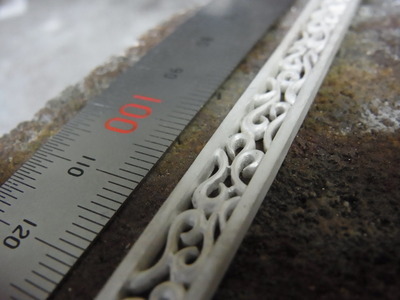 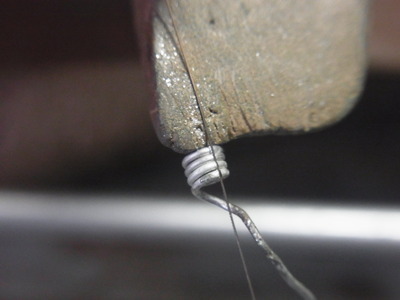 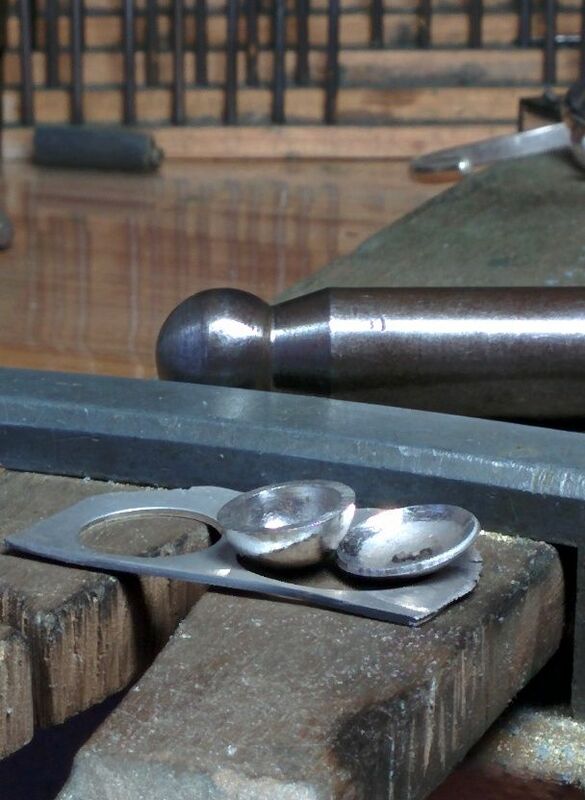 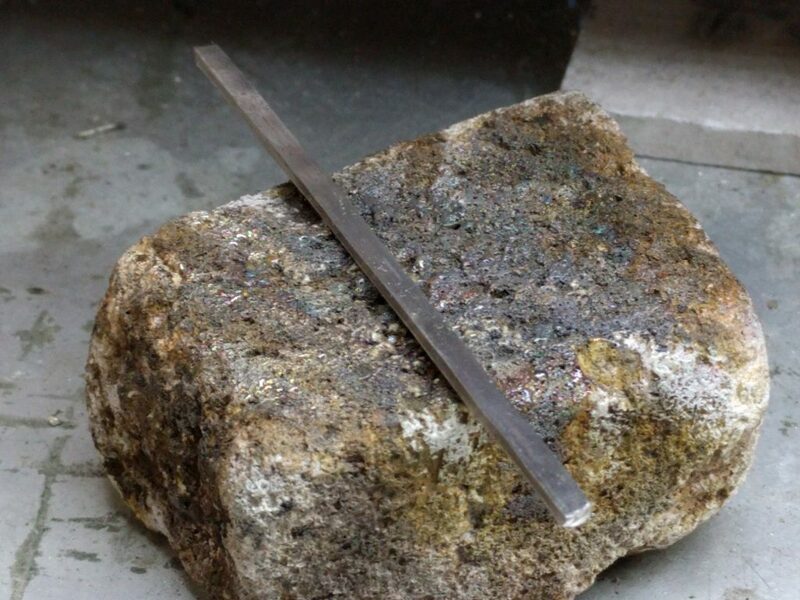 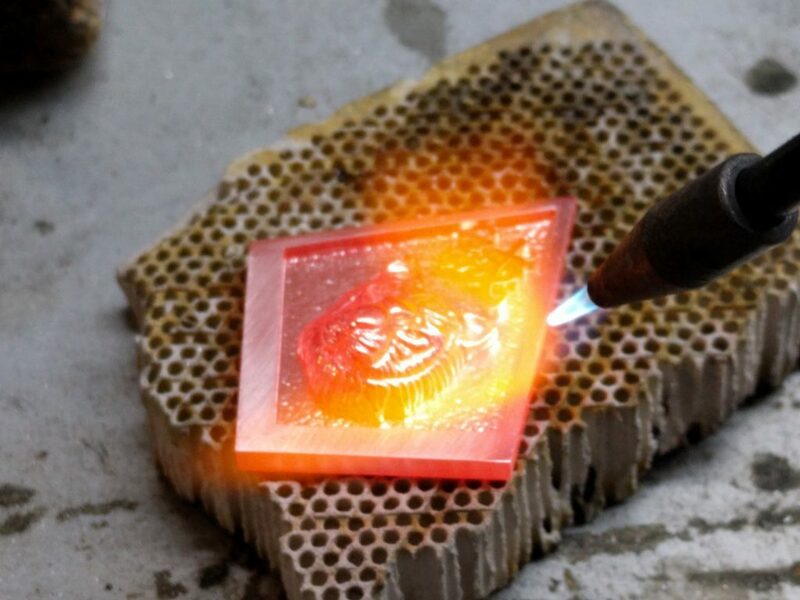 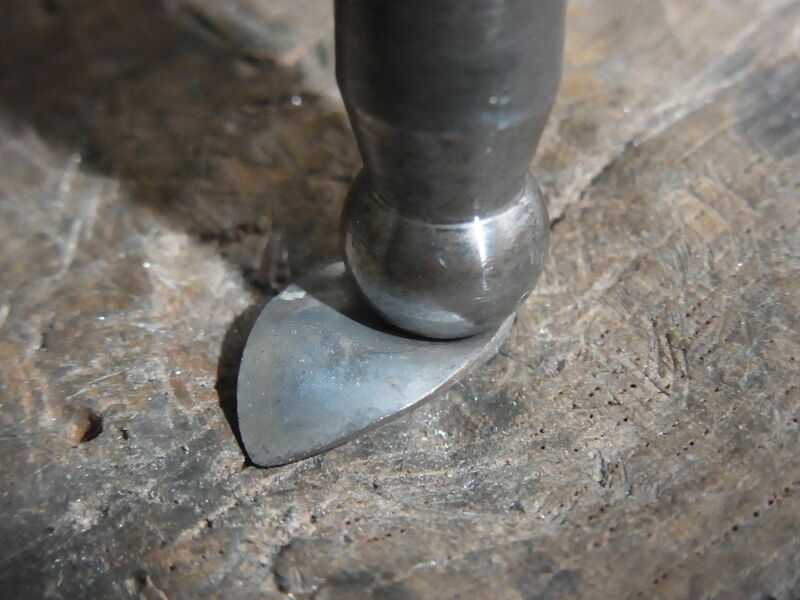 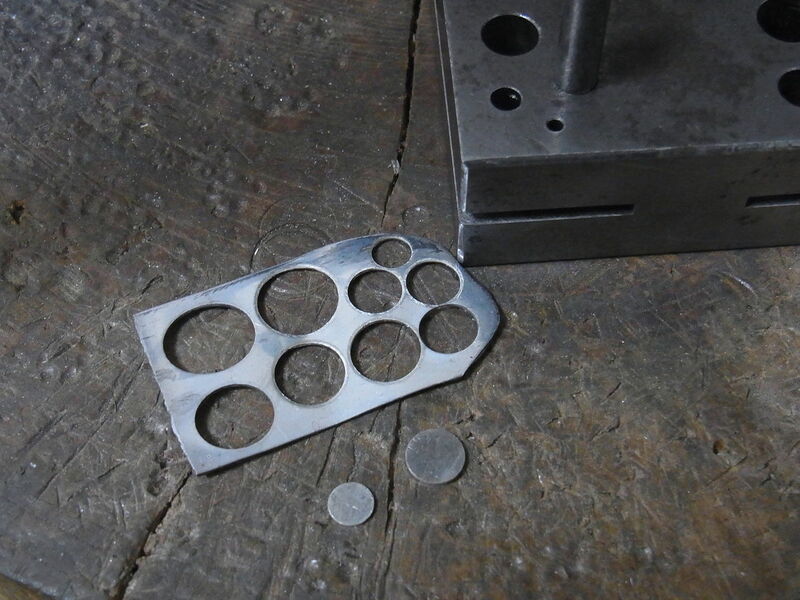 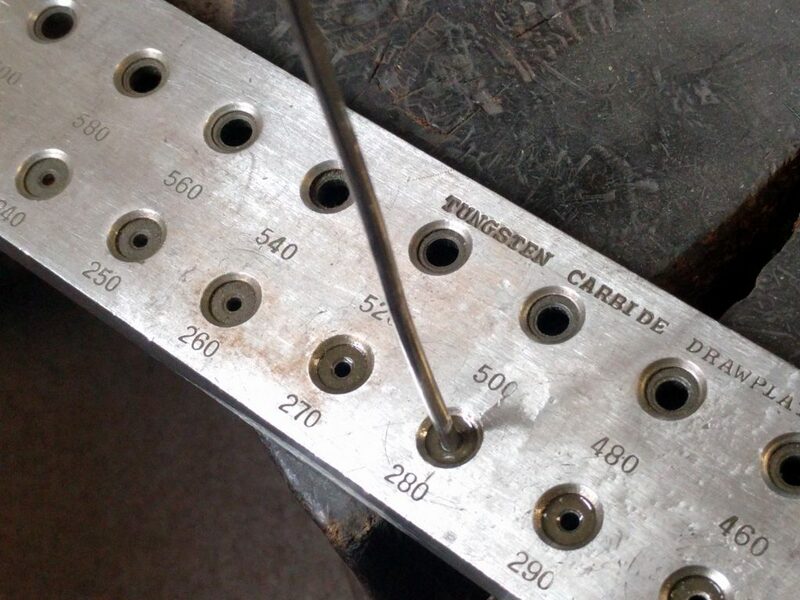 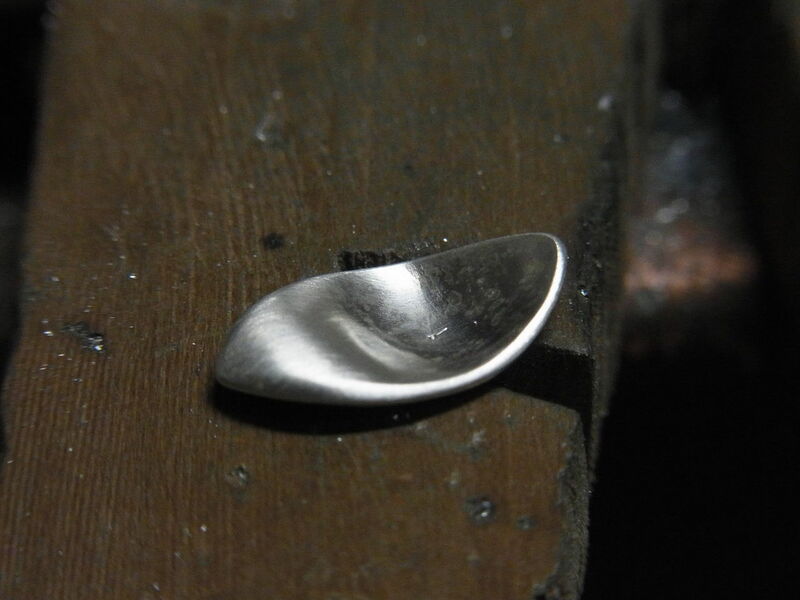 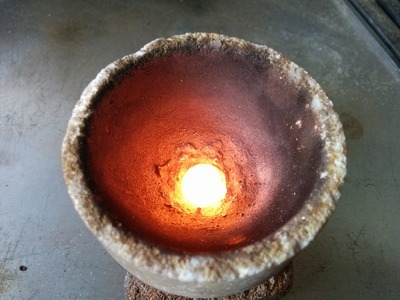 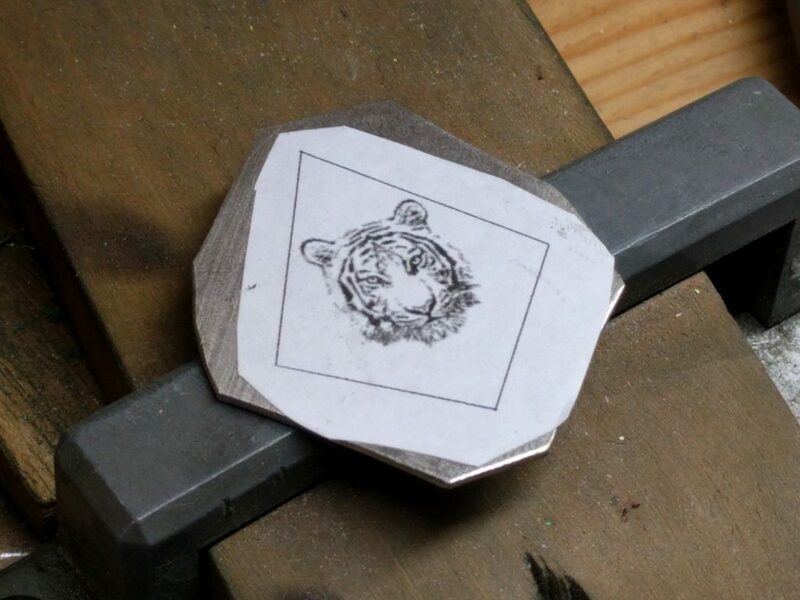 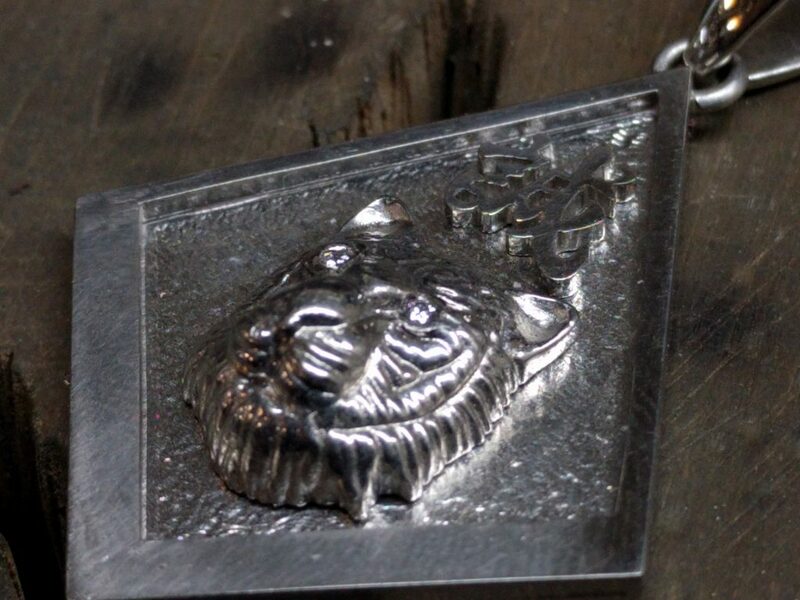 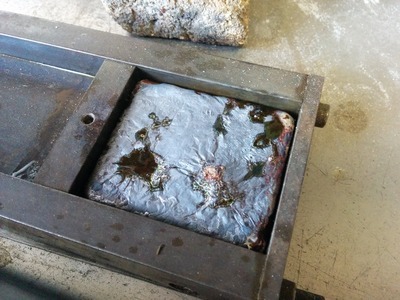 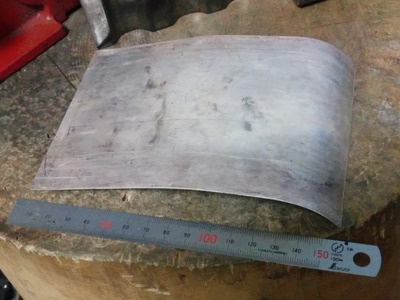 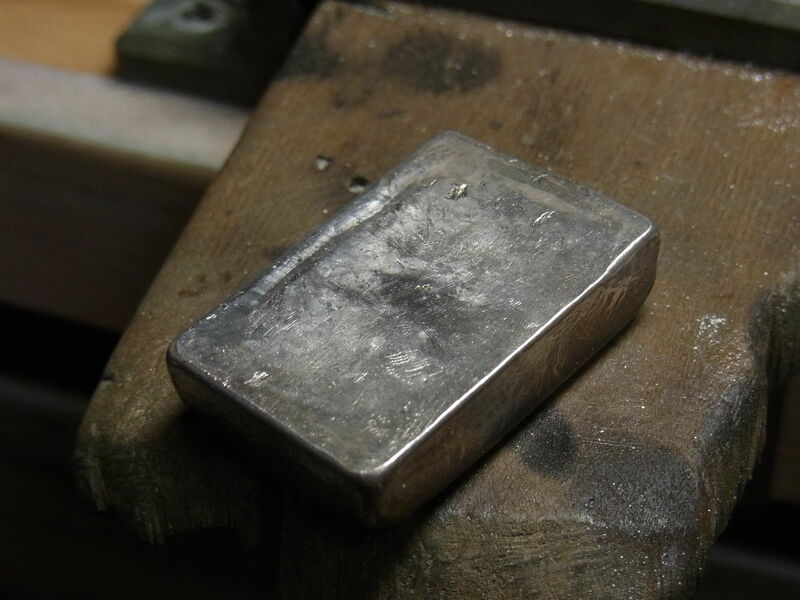 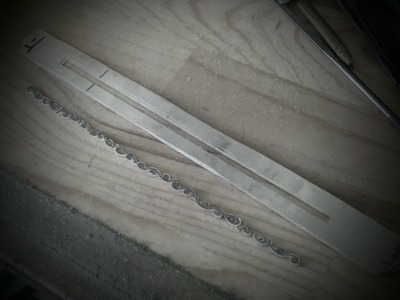 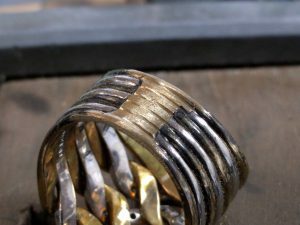 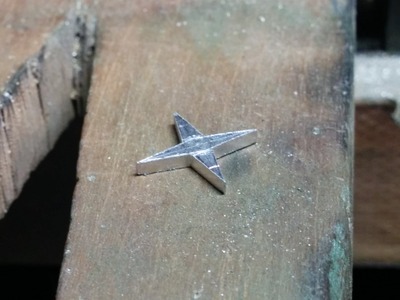 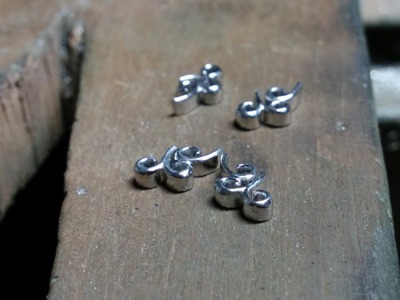 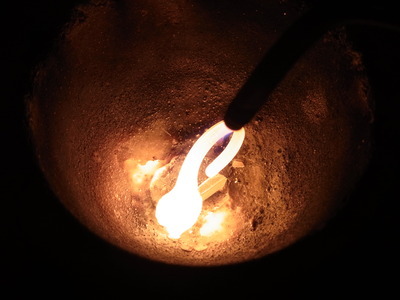 Braze a sheet to the bottom with white gold solder. 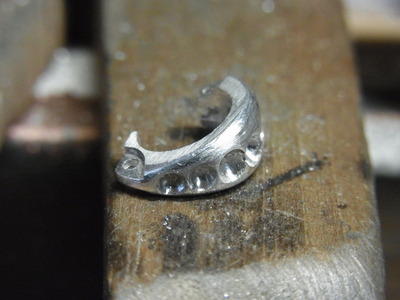 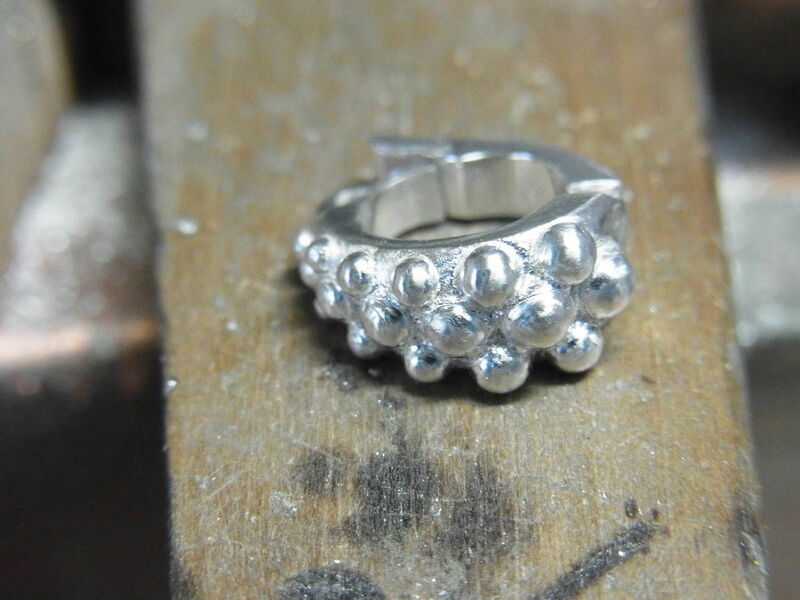 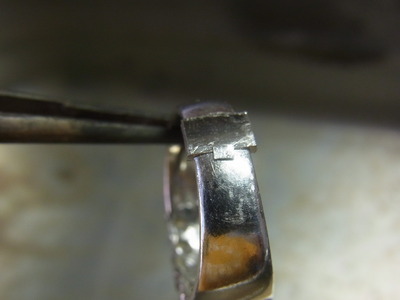 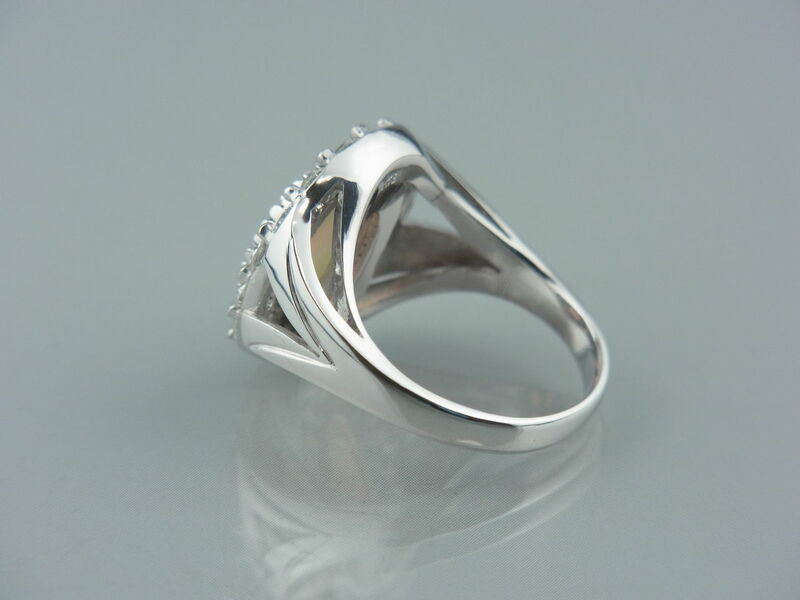 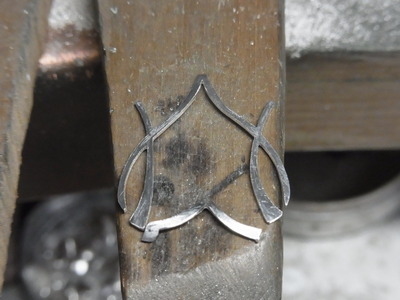 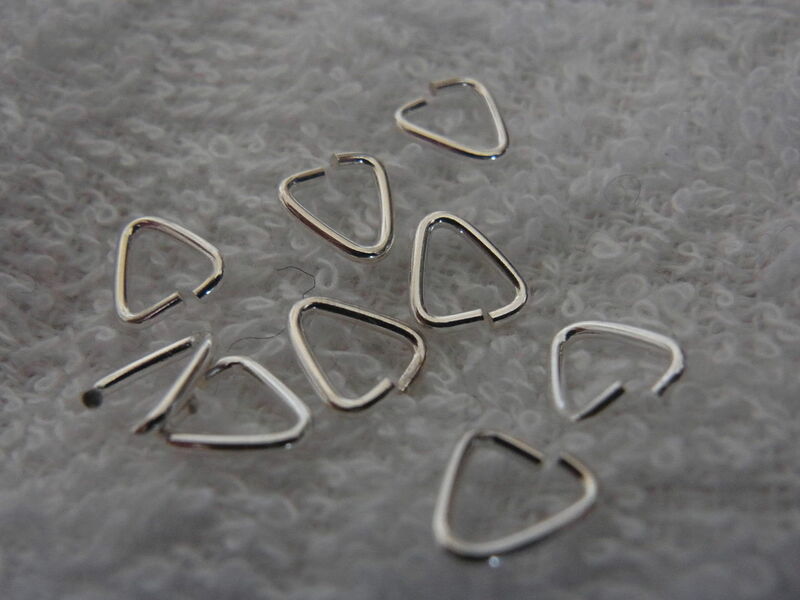 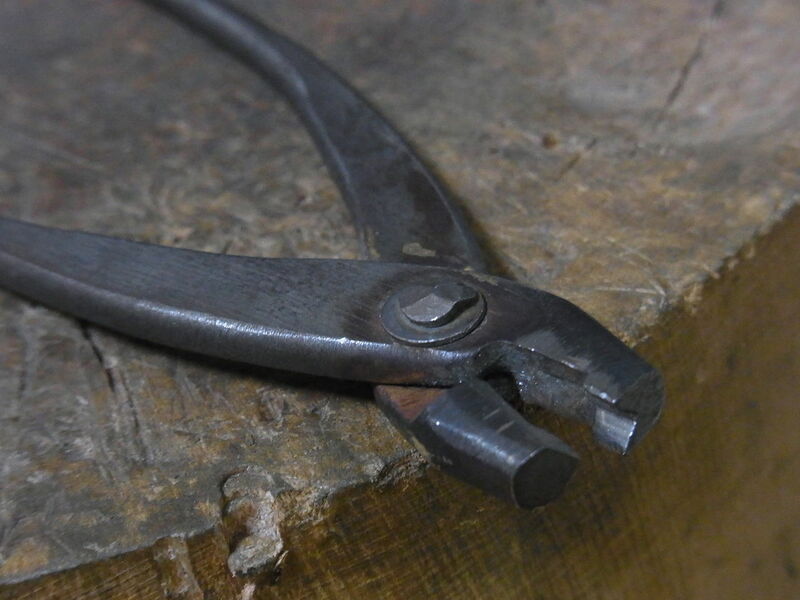 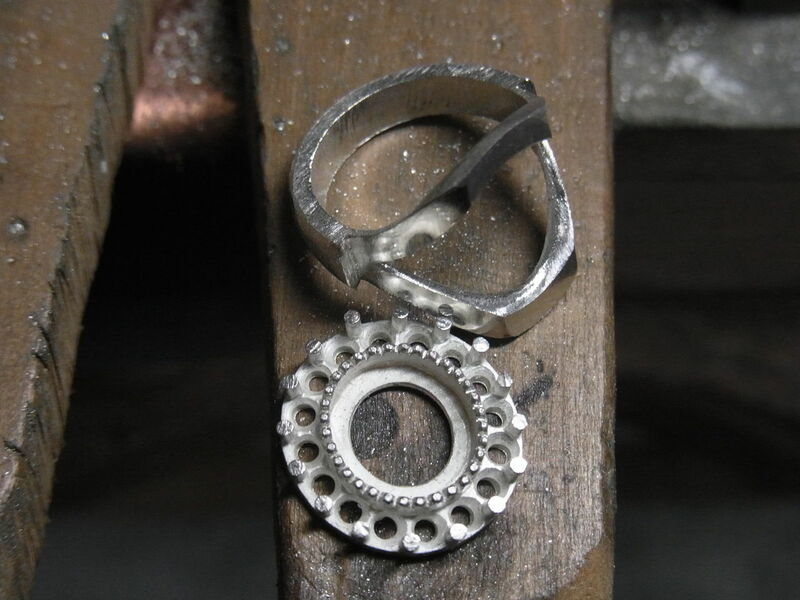 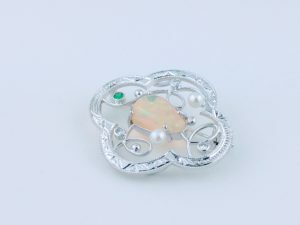 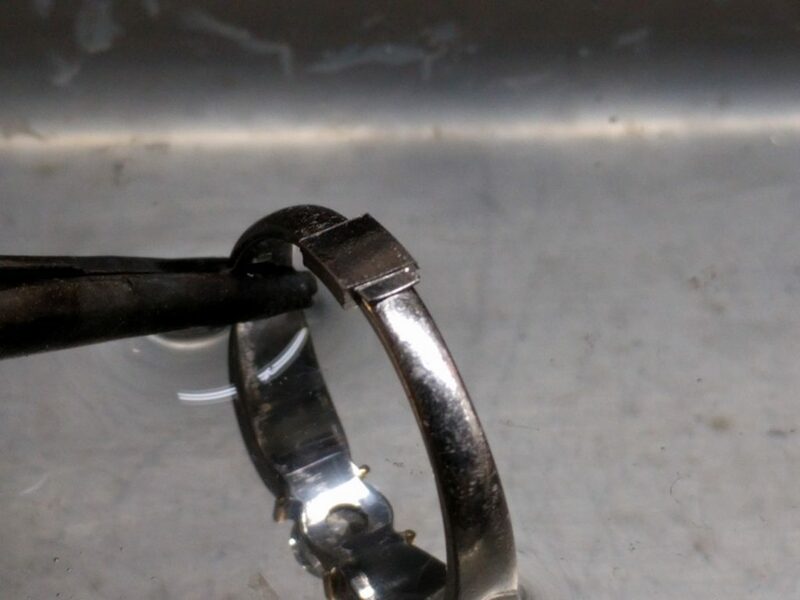 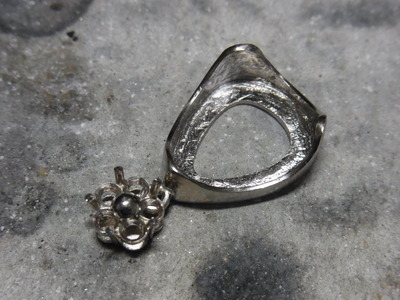 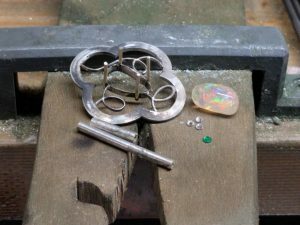 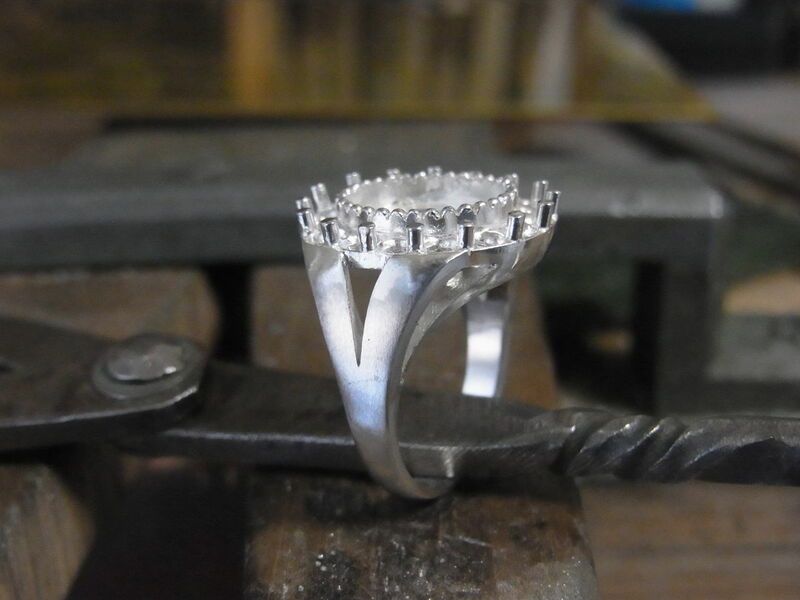 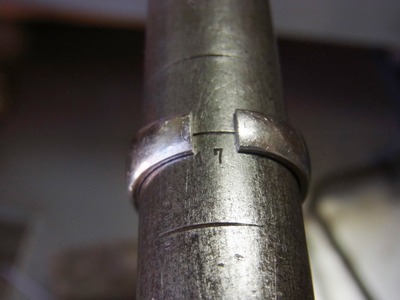 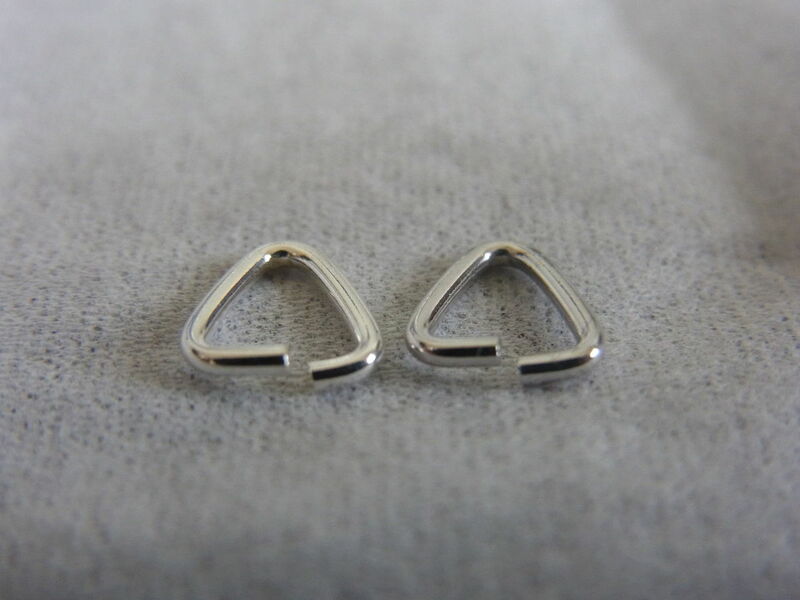 Braze to pearshaped setting with the use of jump ring. 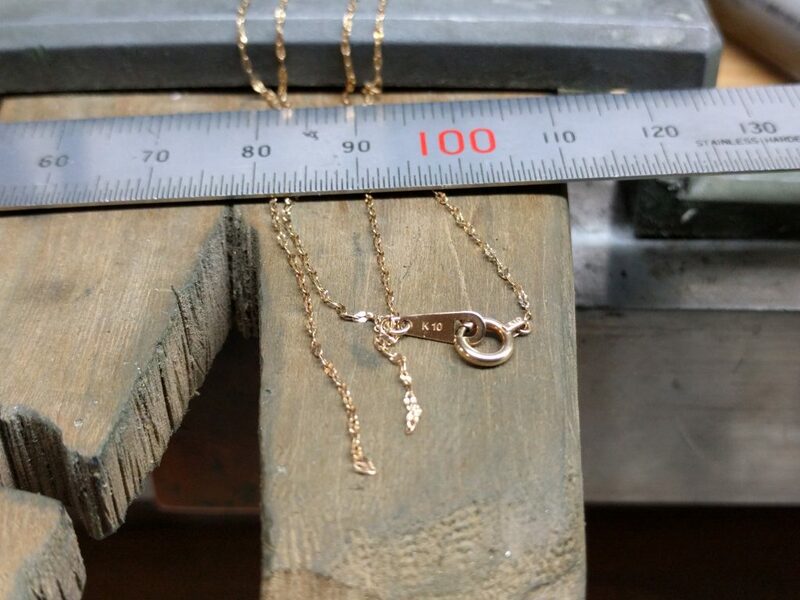 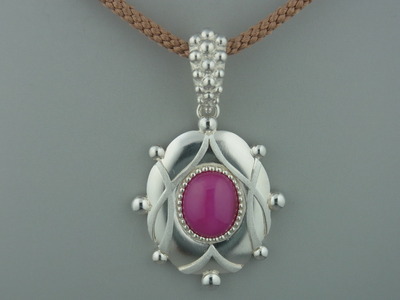 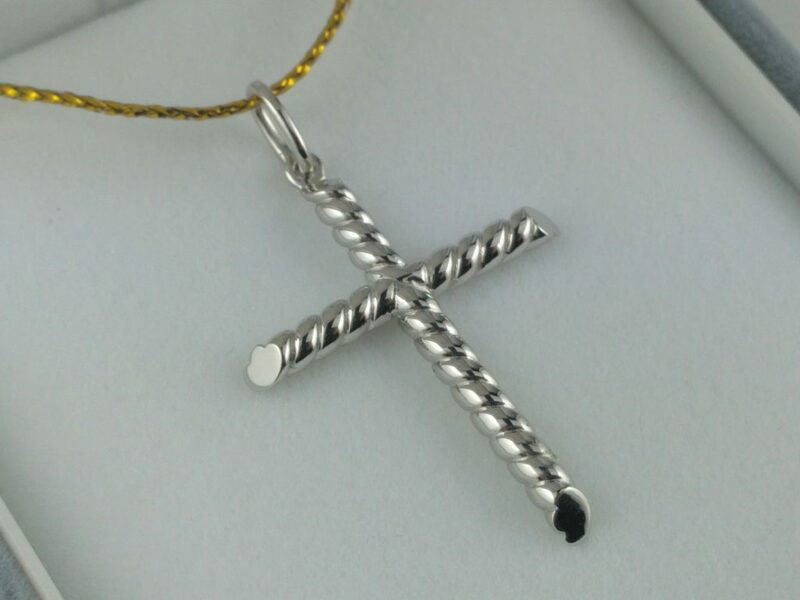 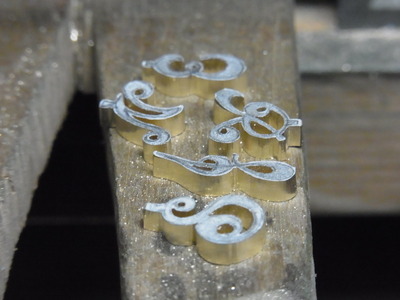 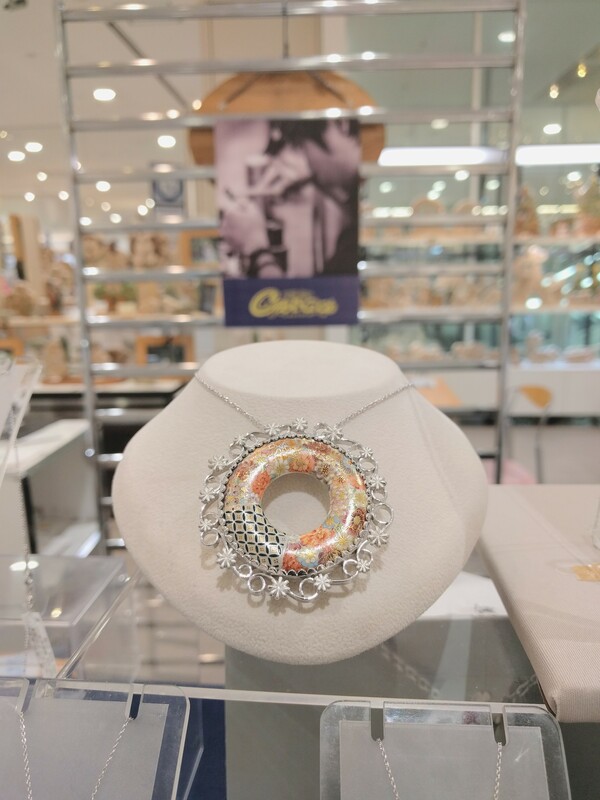 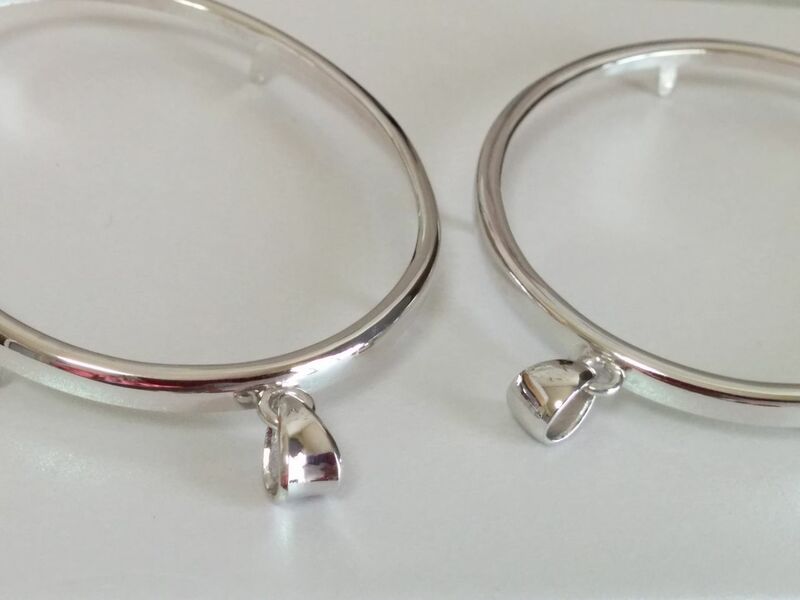 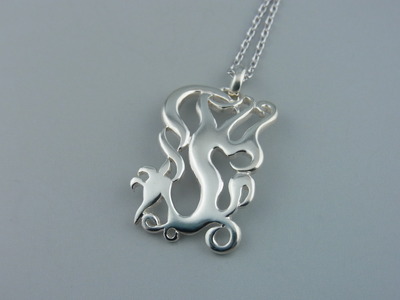 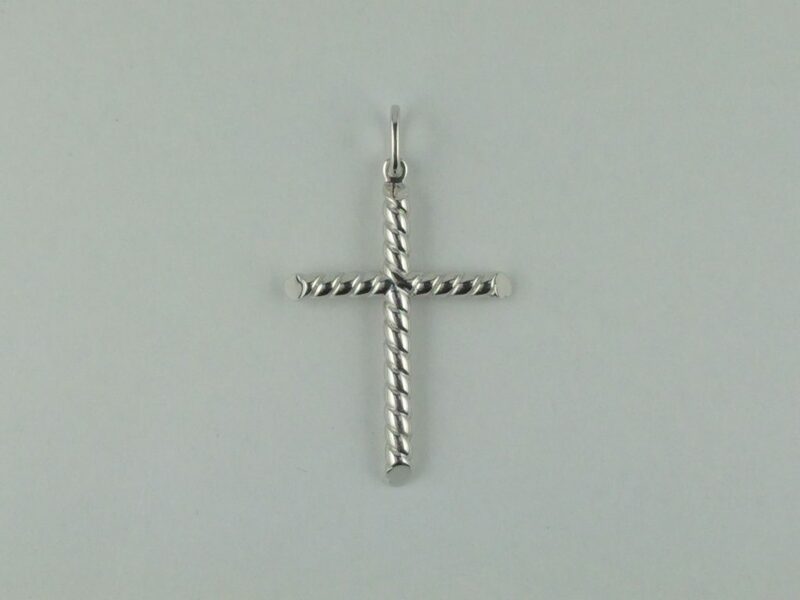 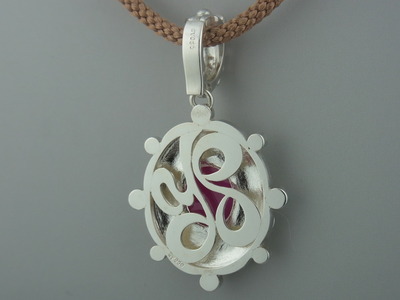 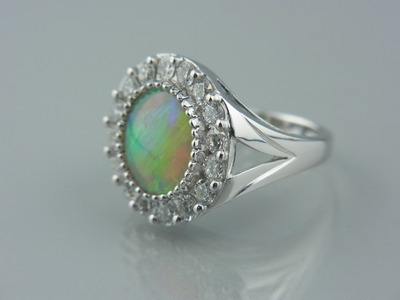 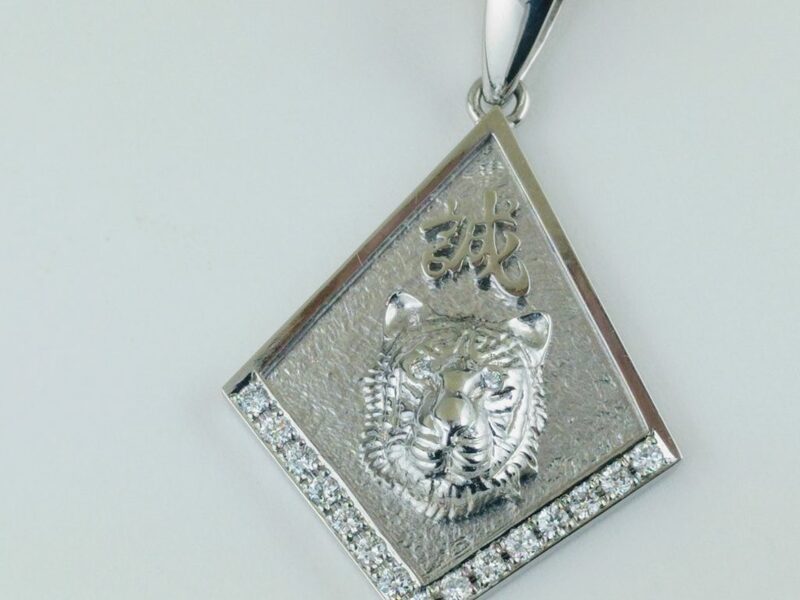 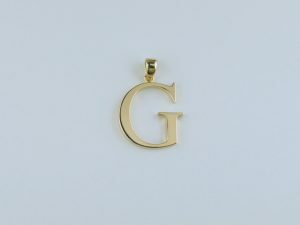 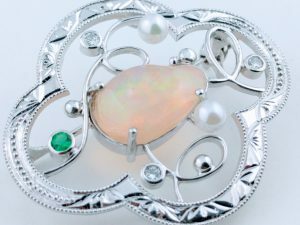 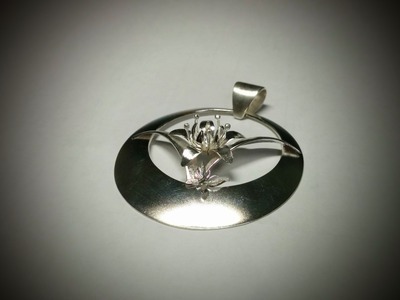 If you would like to have a custom jewelry, please contact Cantete. 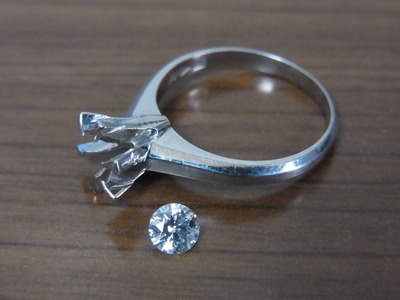 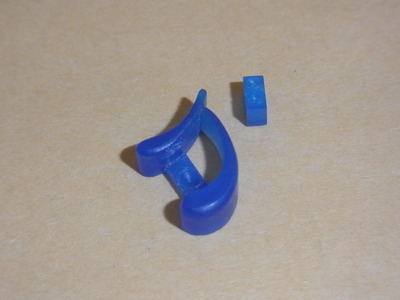 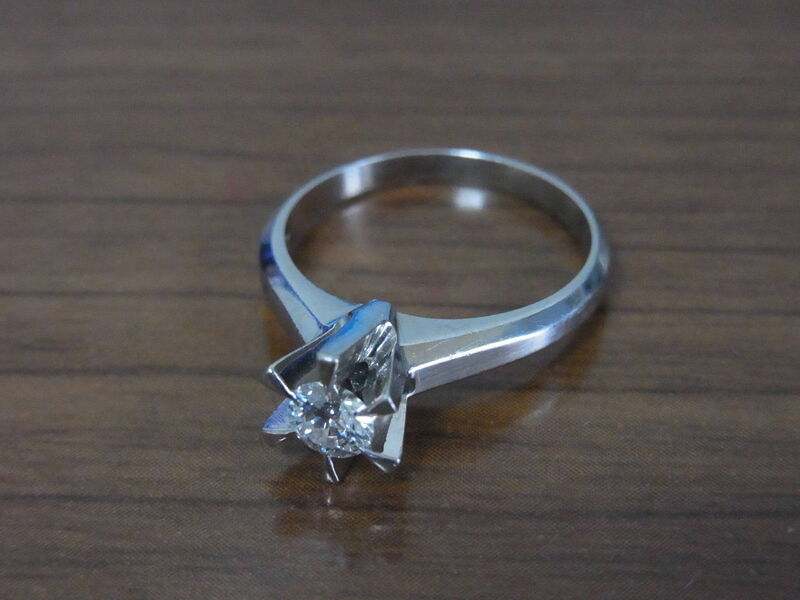 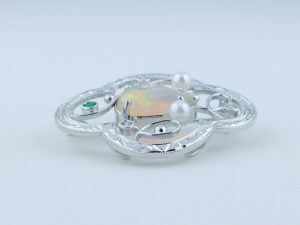 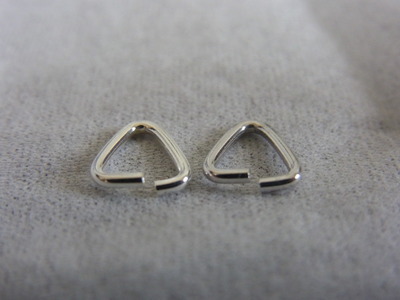 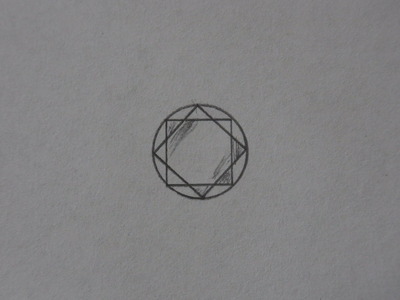 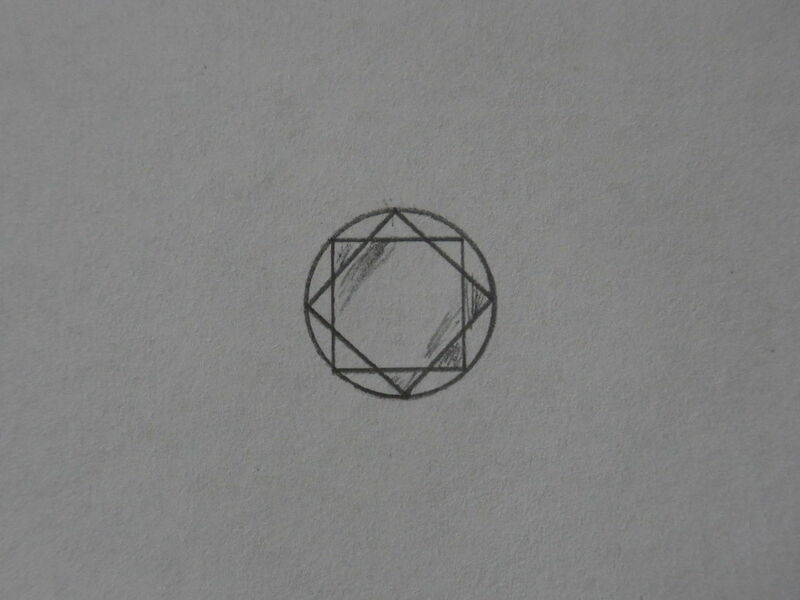 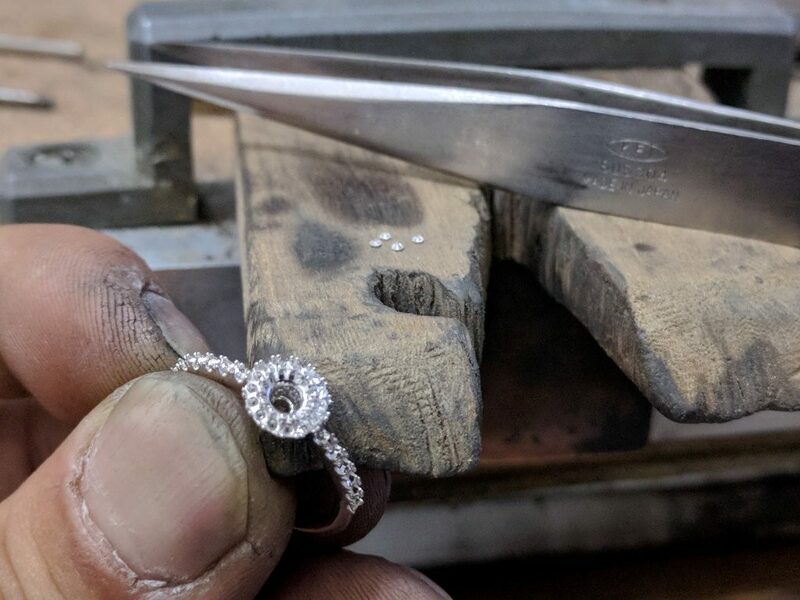 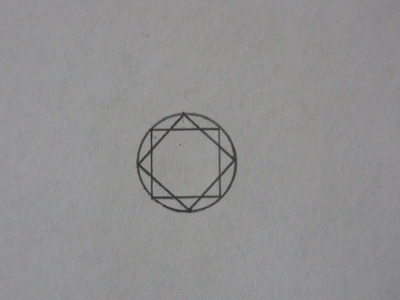 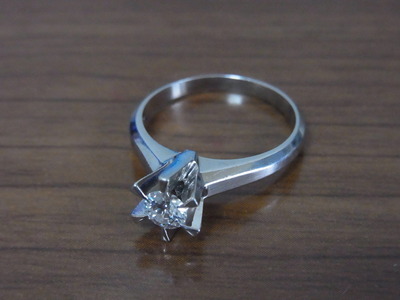 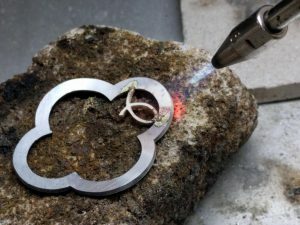 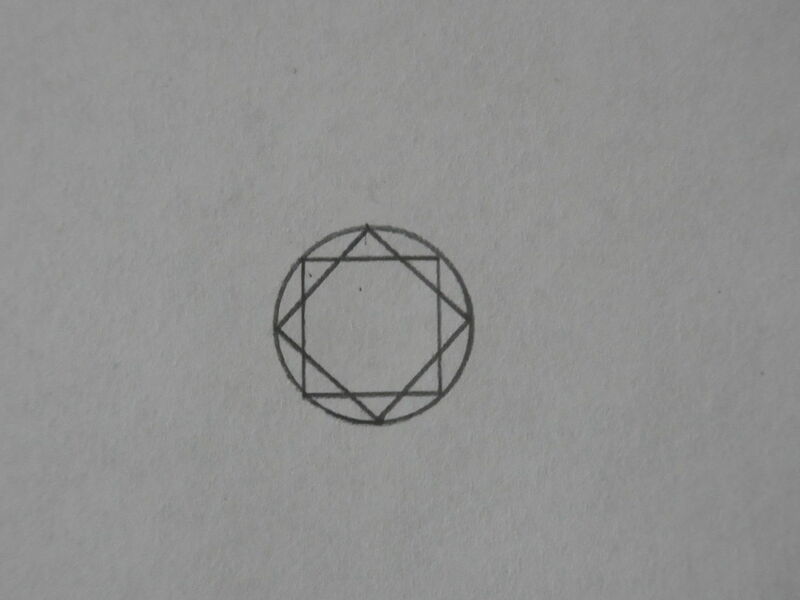 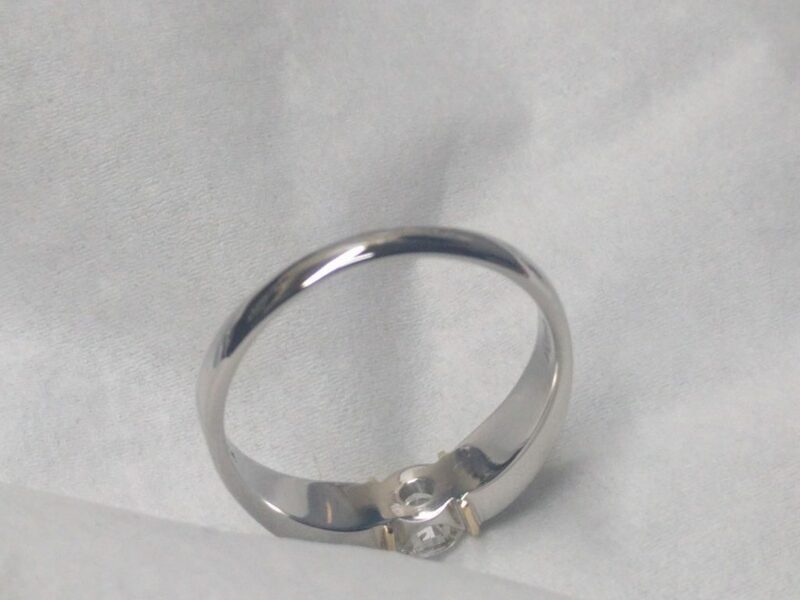 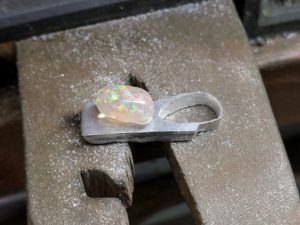 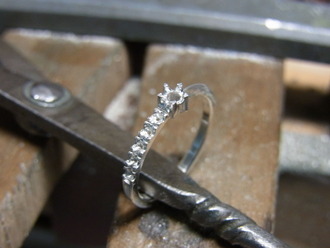 プラチナダイヤモンドリングのサイズ直し Resizing Pt diamond ring. 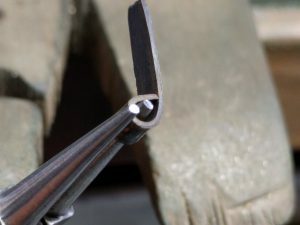 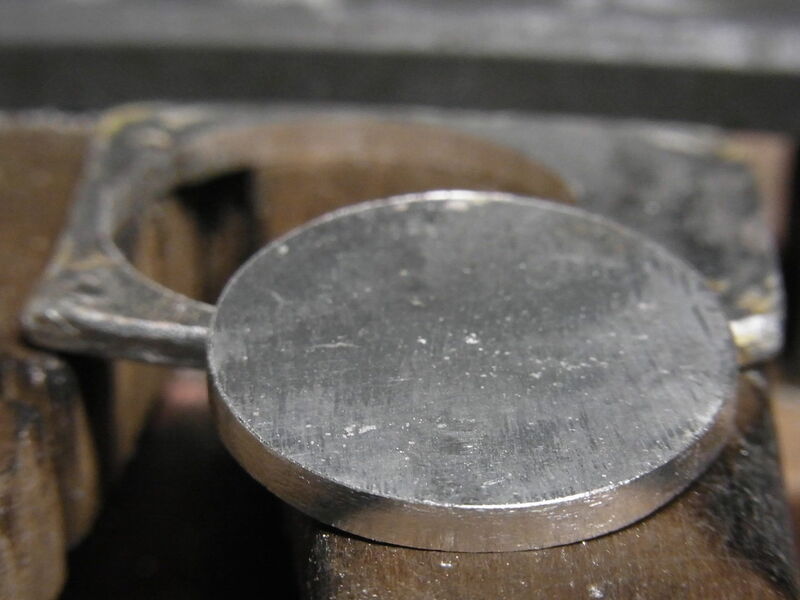 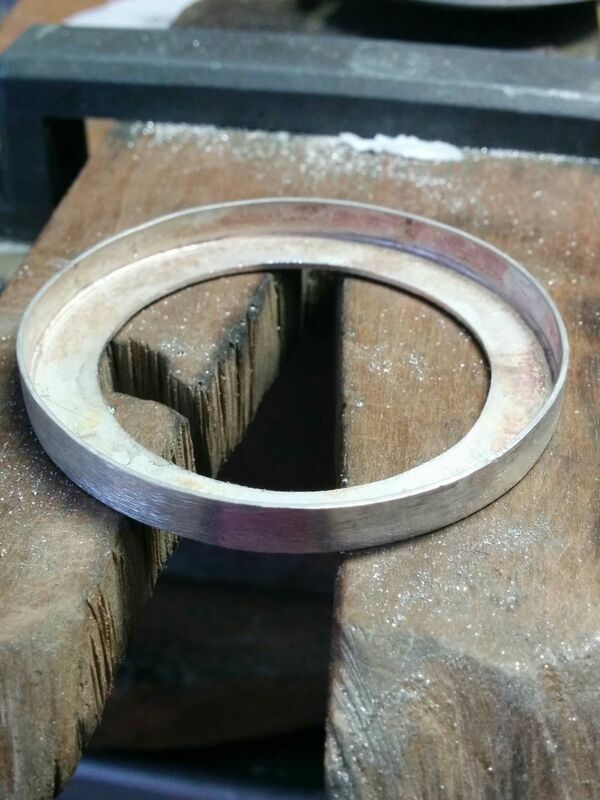 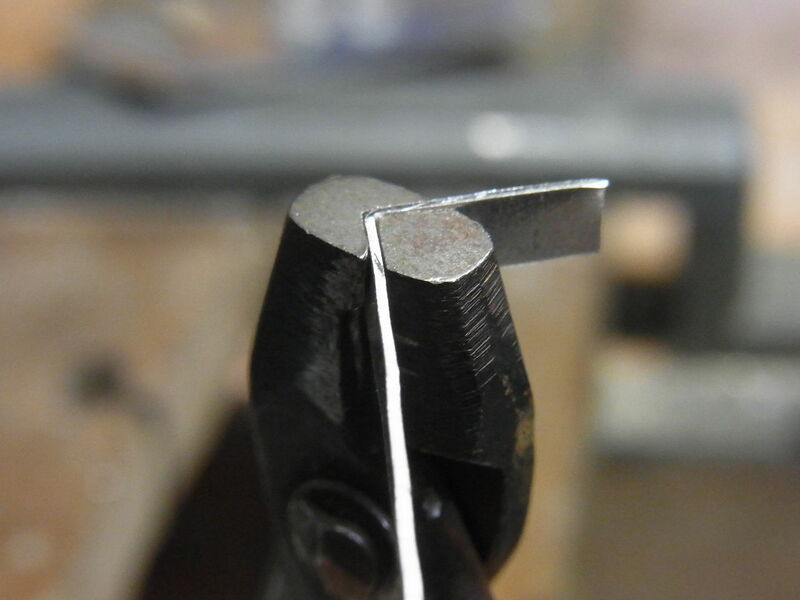 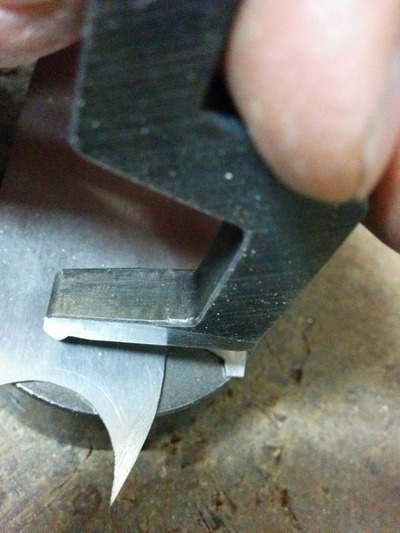 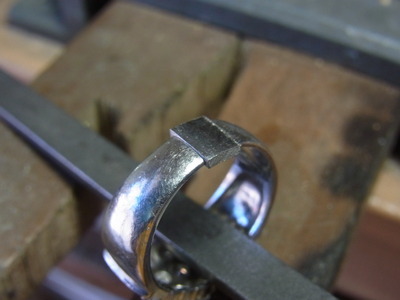 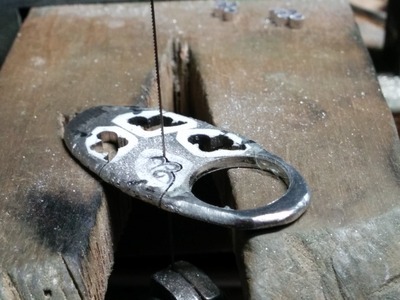 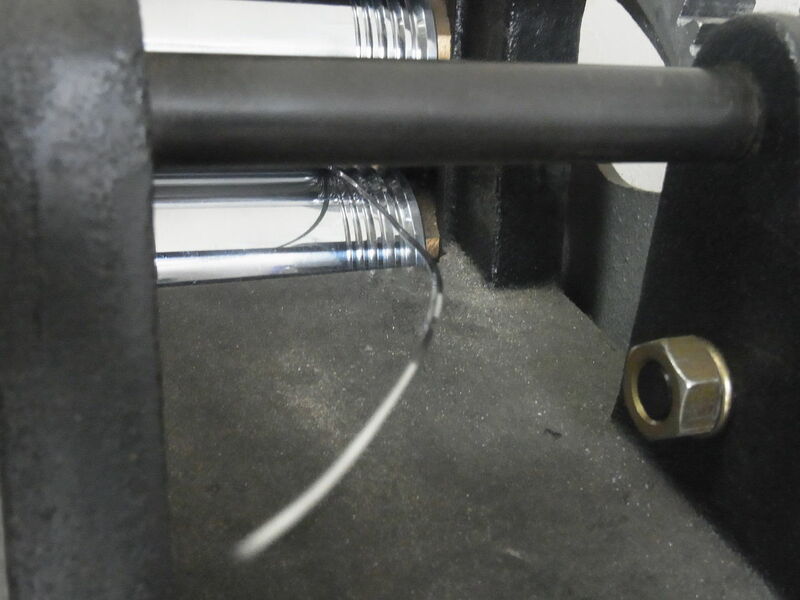 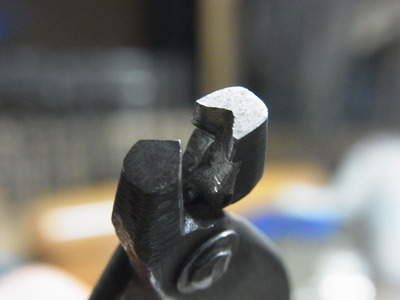 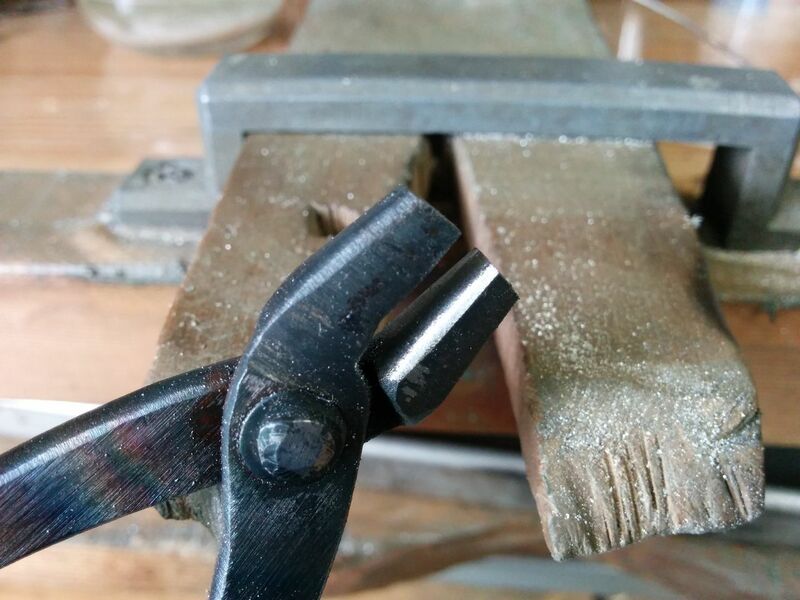 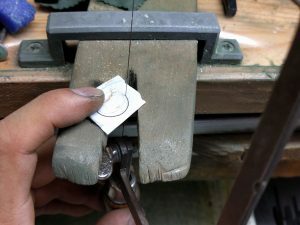 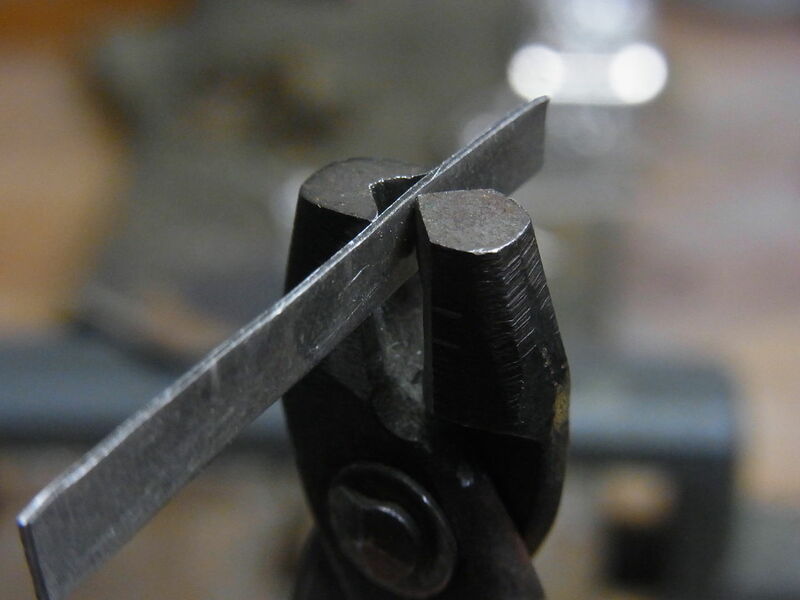 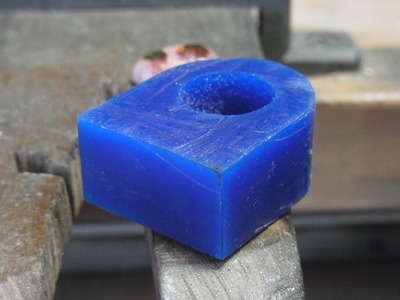 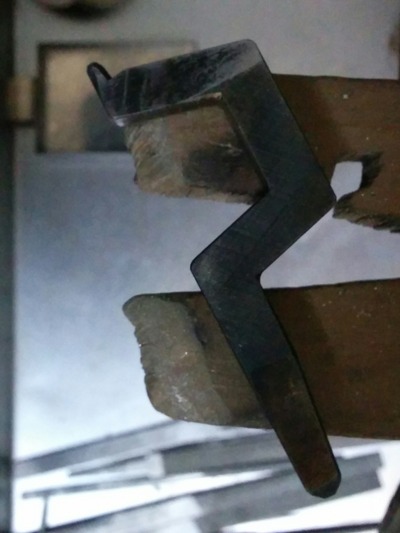 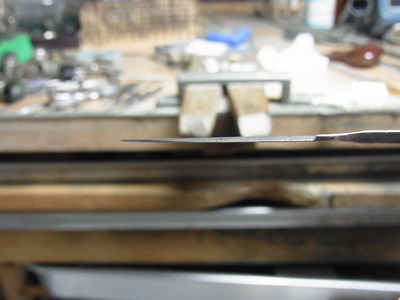 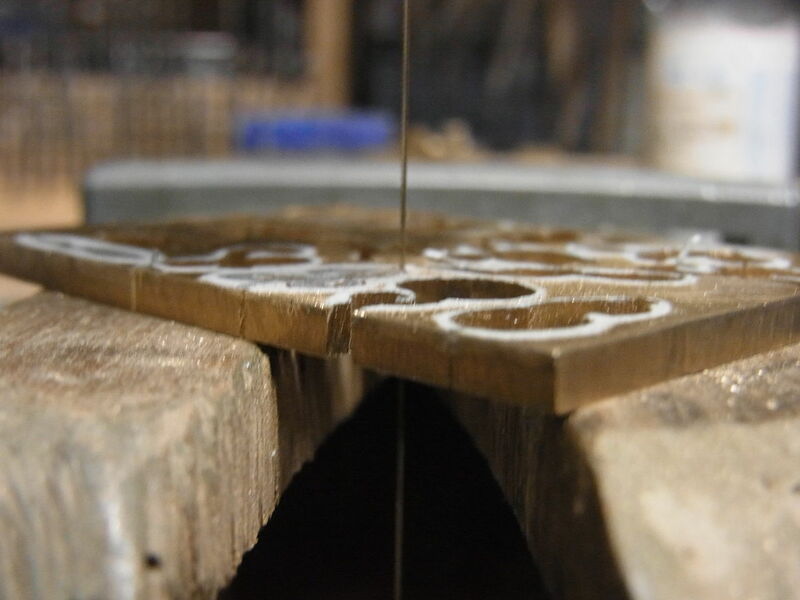 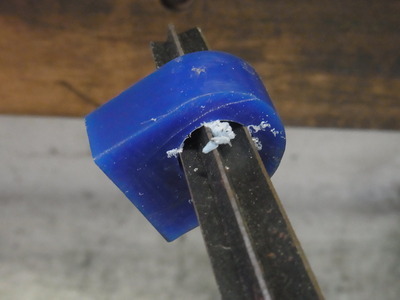 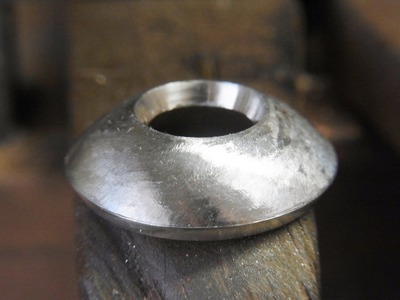 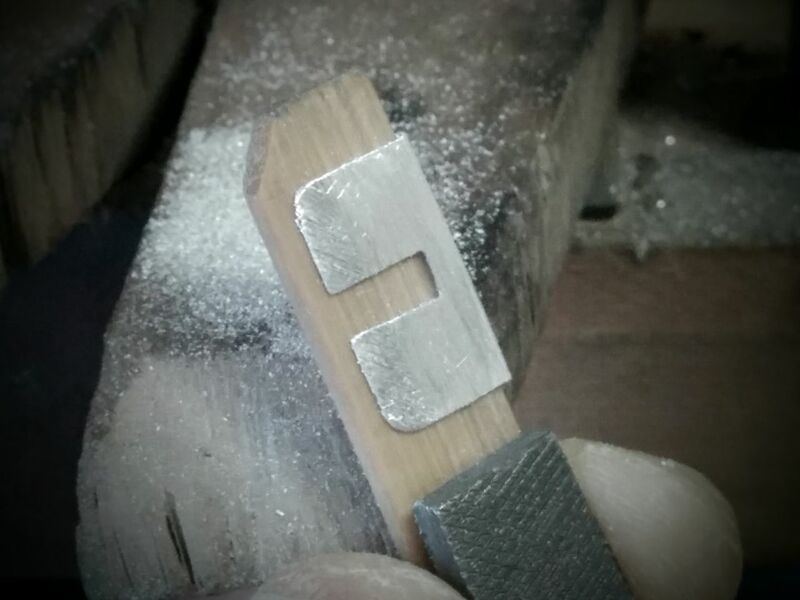 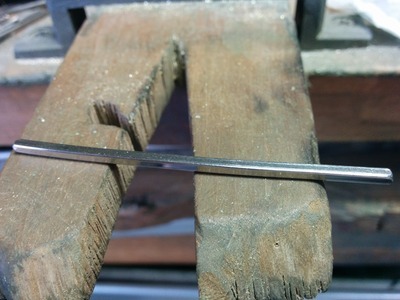 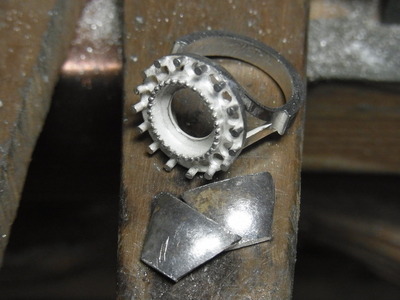 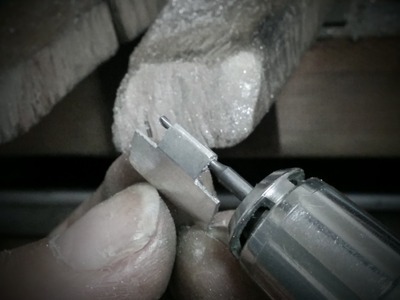 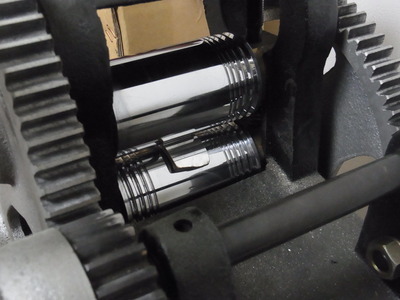 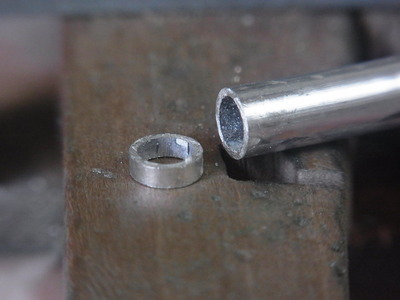 First,cutting the lower shank with sawblade and creating a break in the circle of a ring. 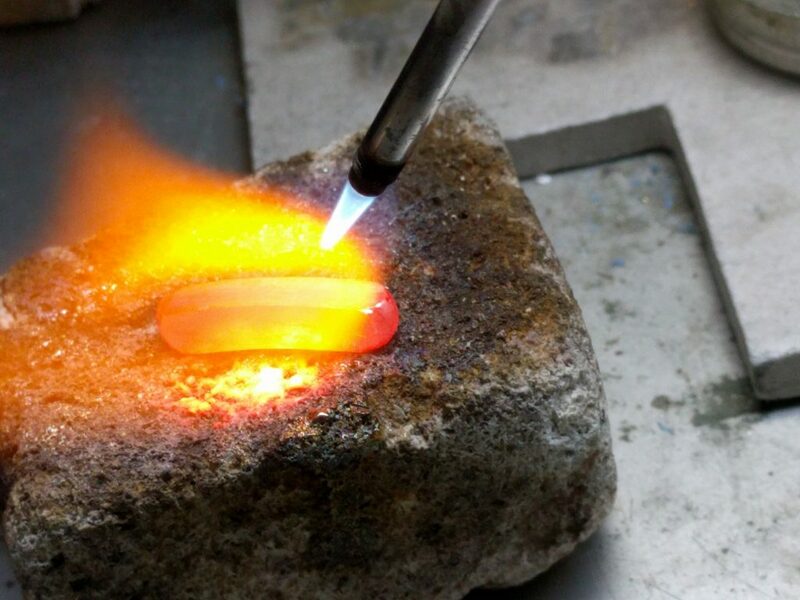 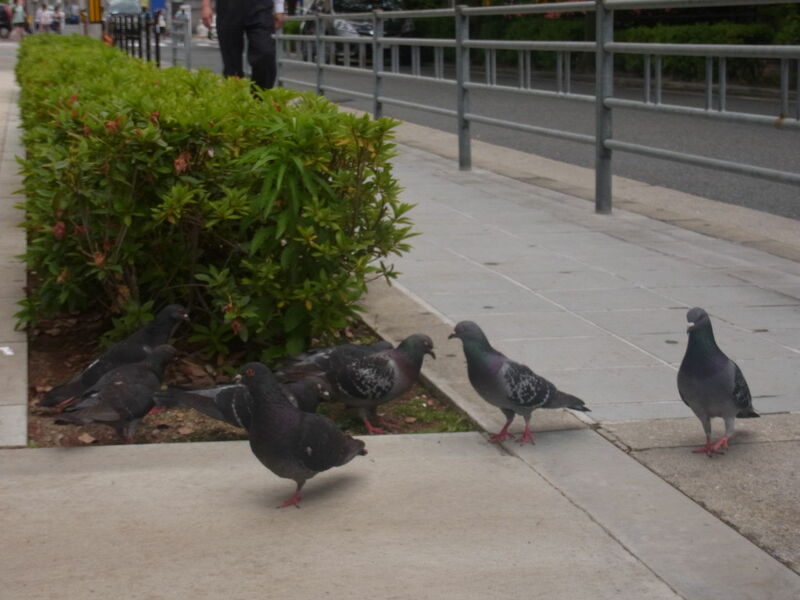 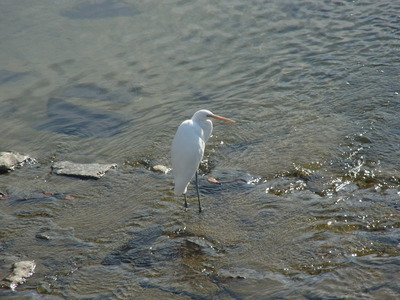 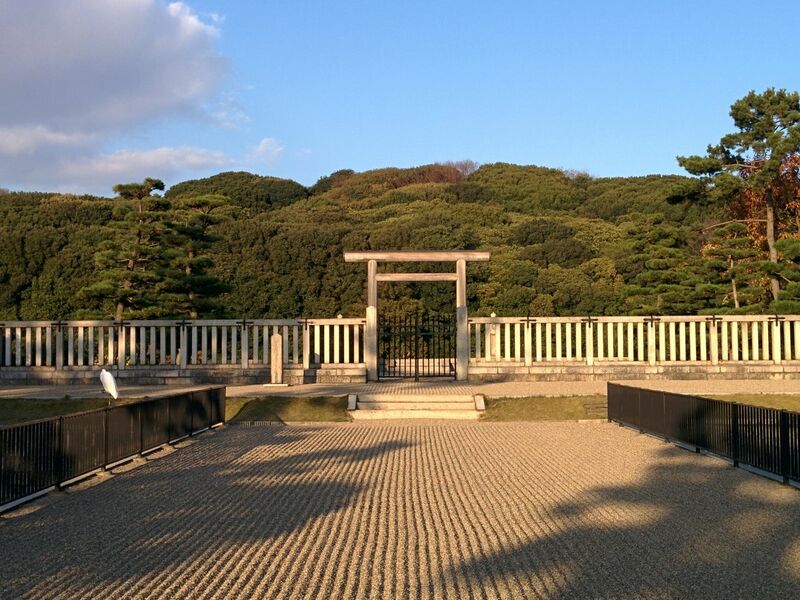 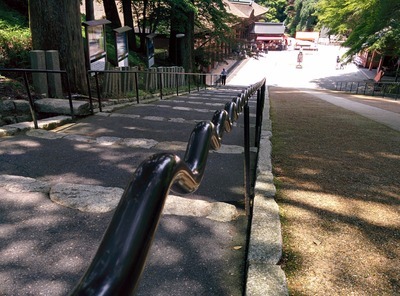 At this time, it’s important to be not to break stones! 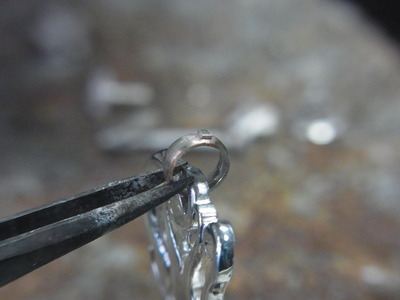 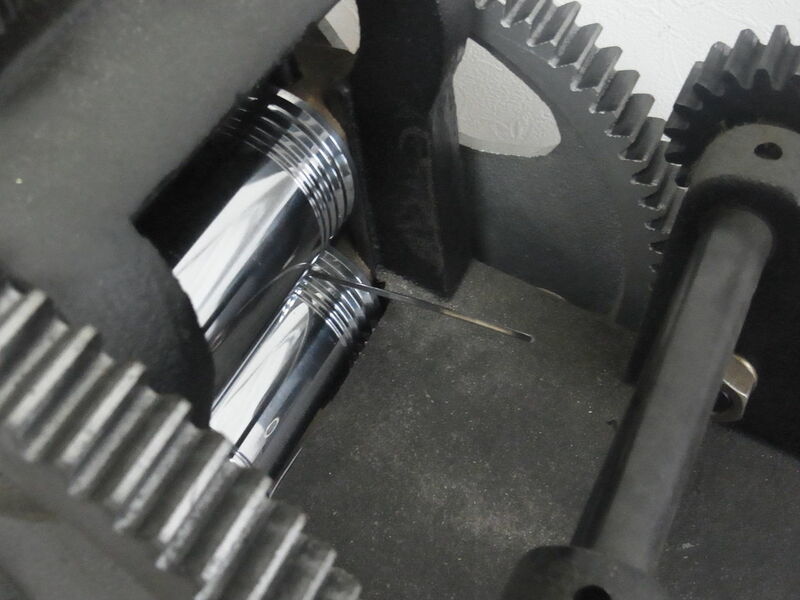 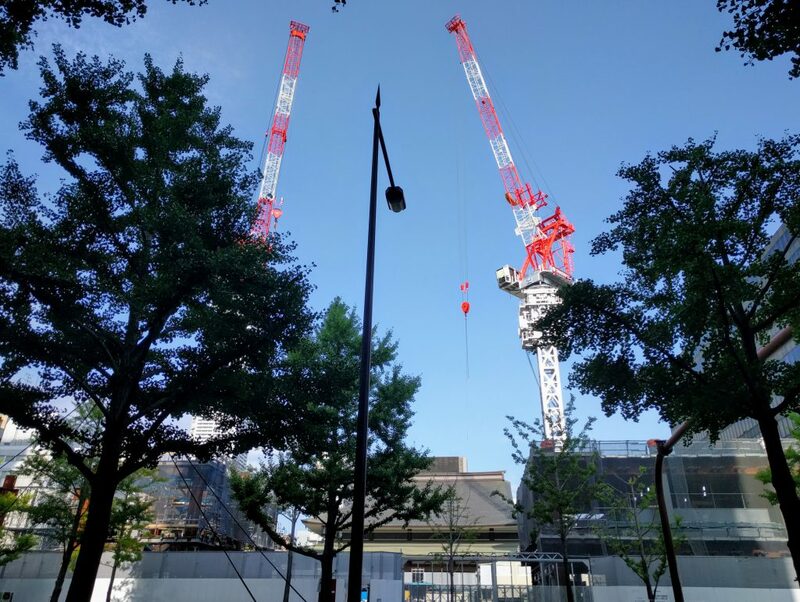 Adding the platinum matal piece. 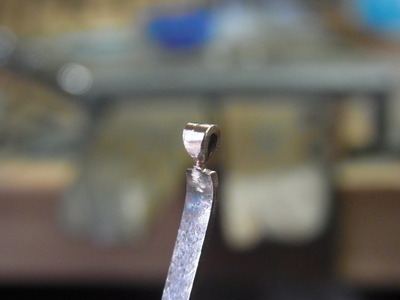 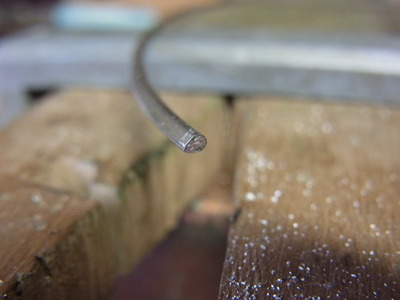 Putting a piece of platinum solder and soldering. Soldering is finished on both sides. Finally pollising. 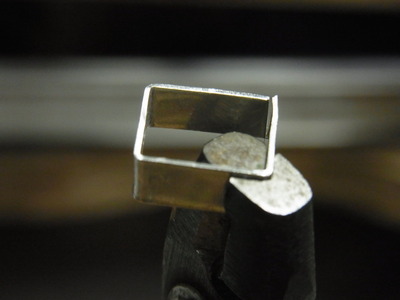 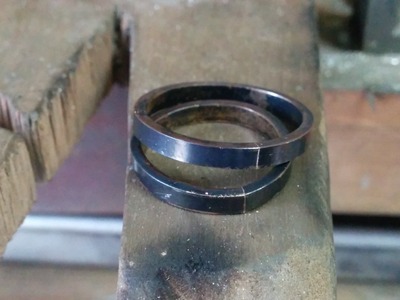 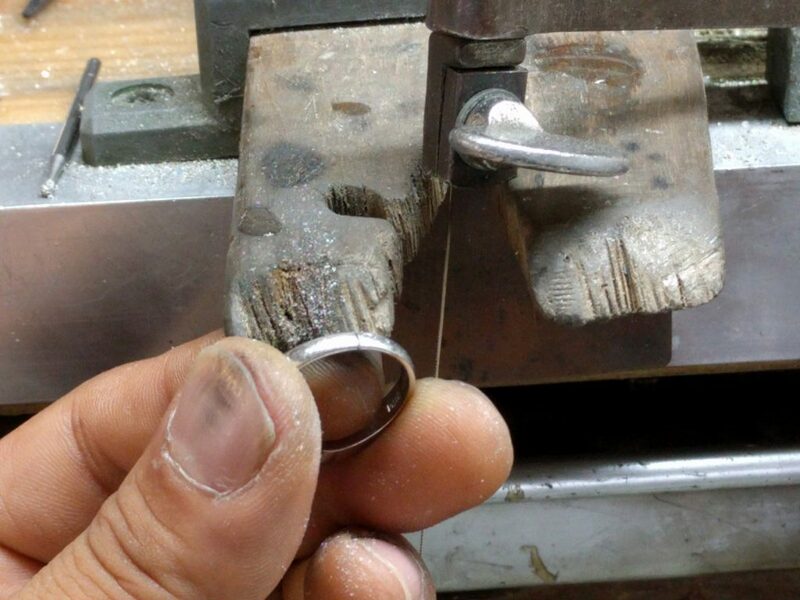 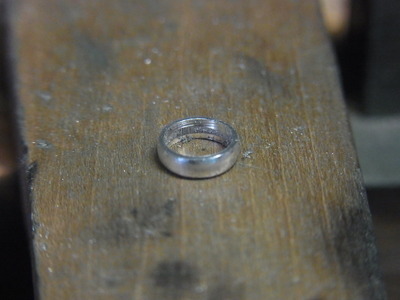 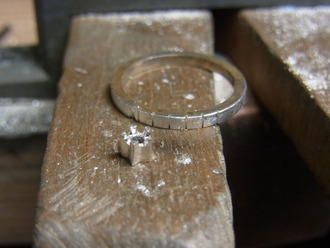 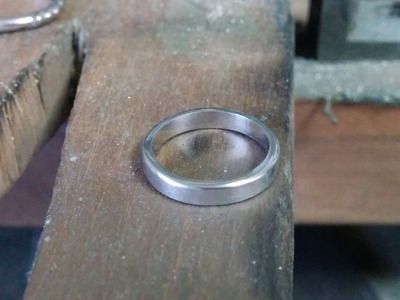 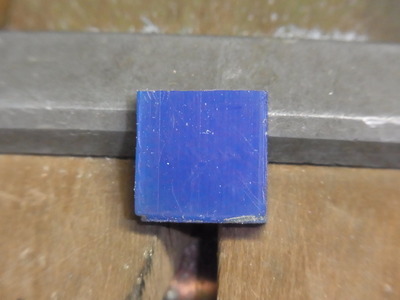 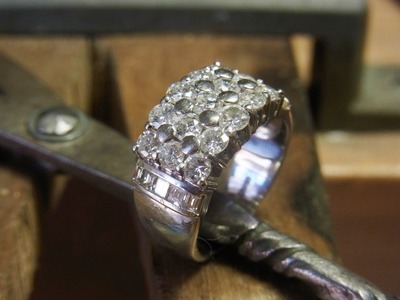 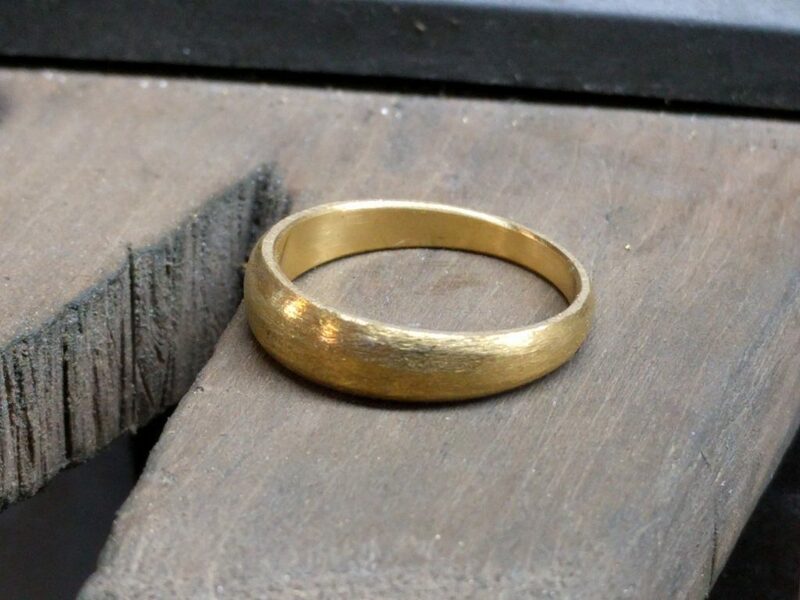 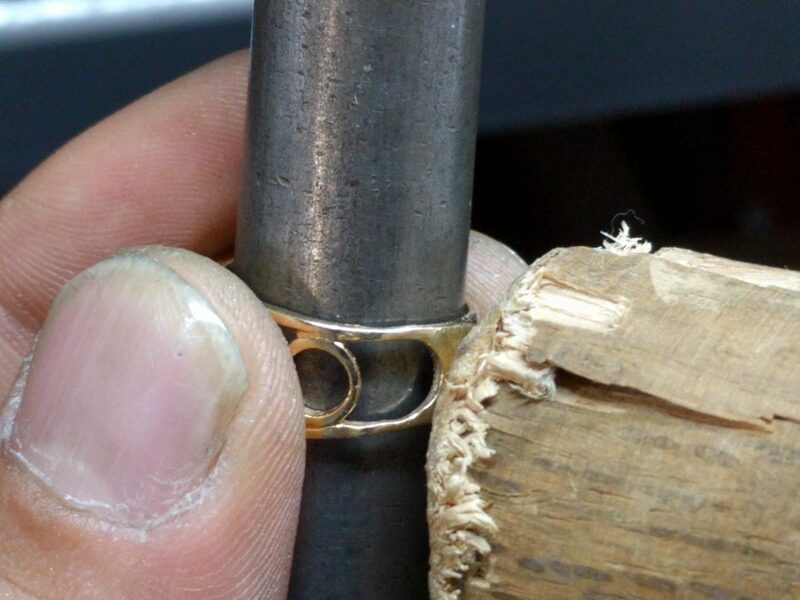 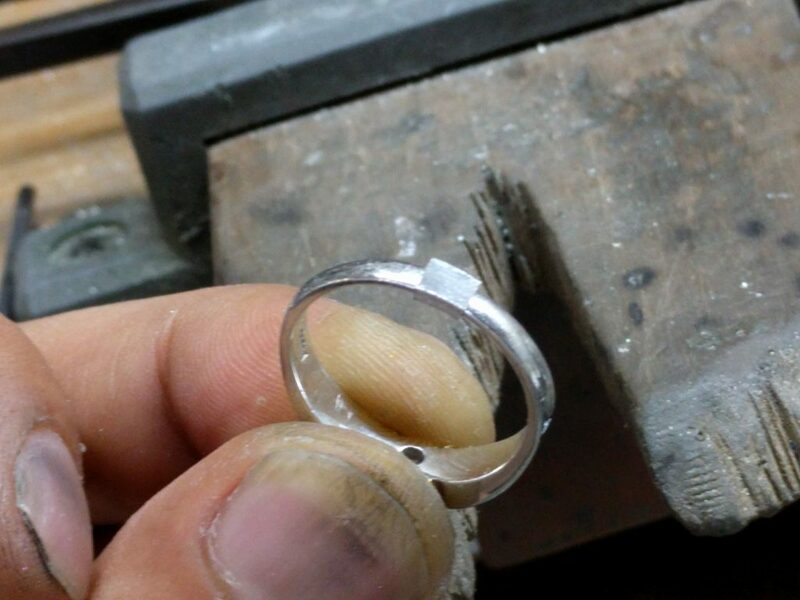 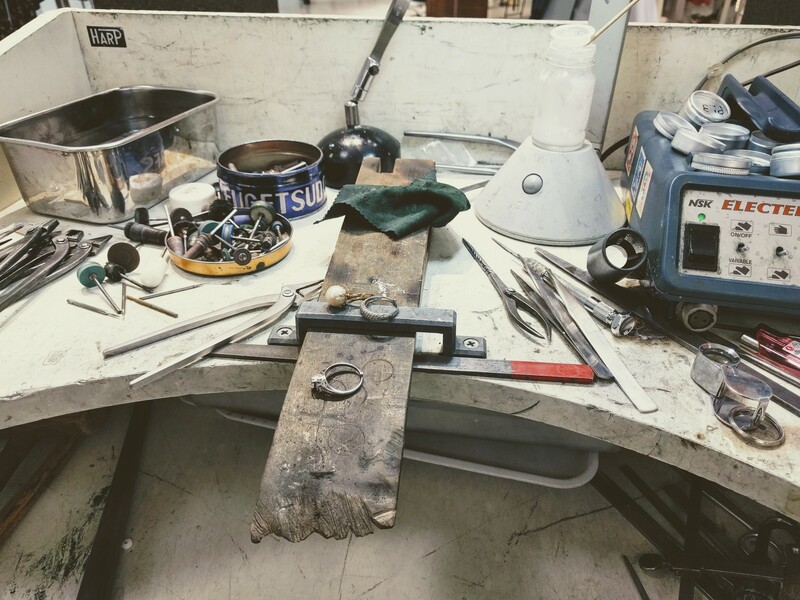 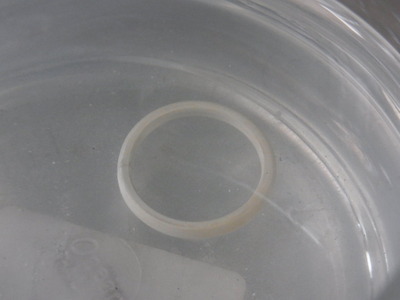 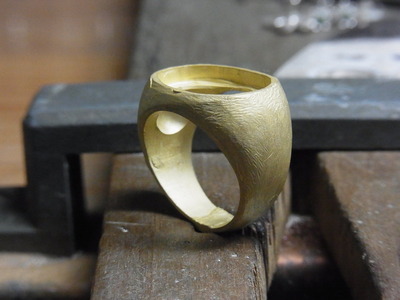 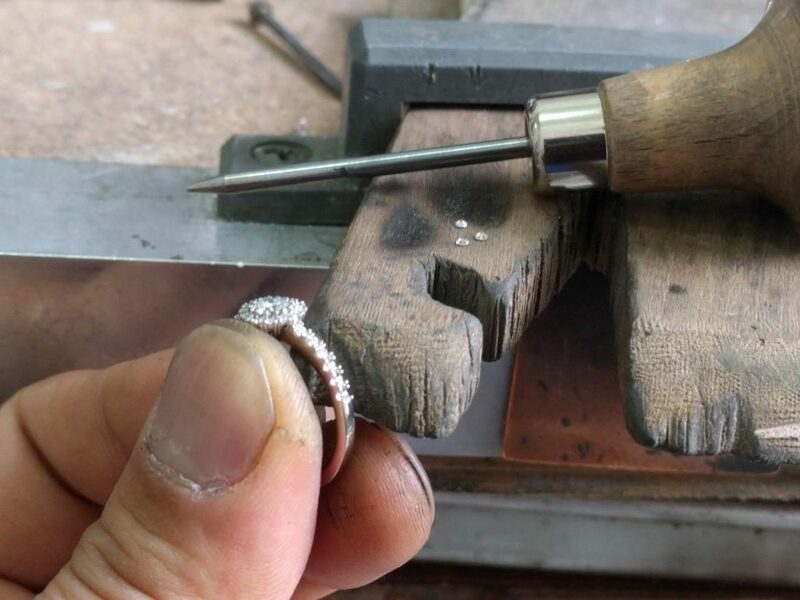 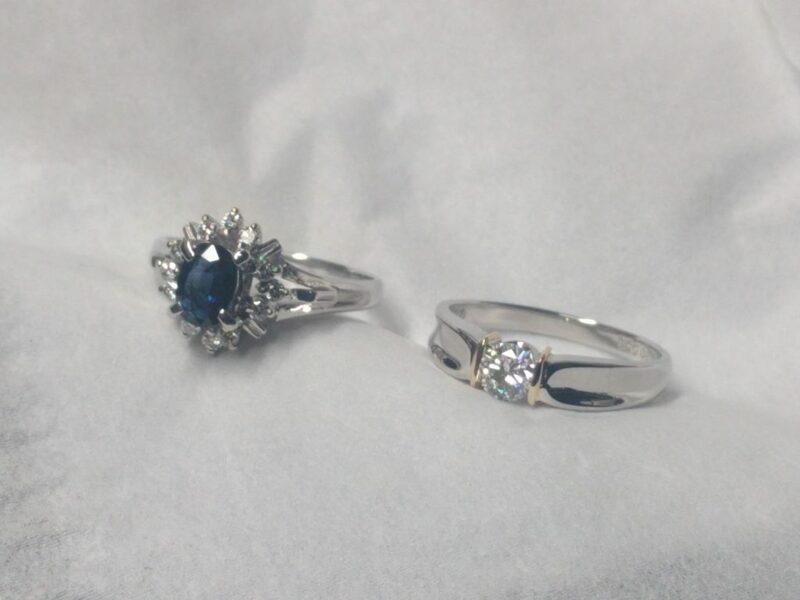 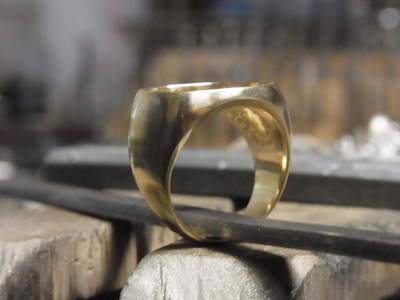 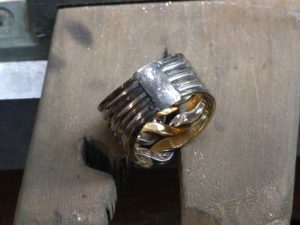 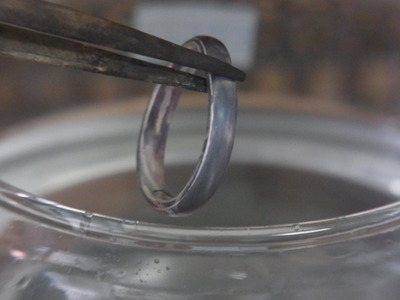 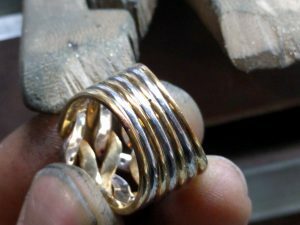 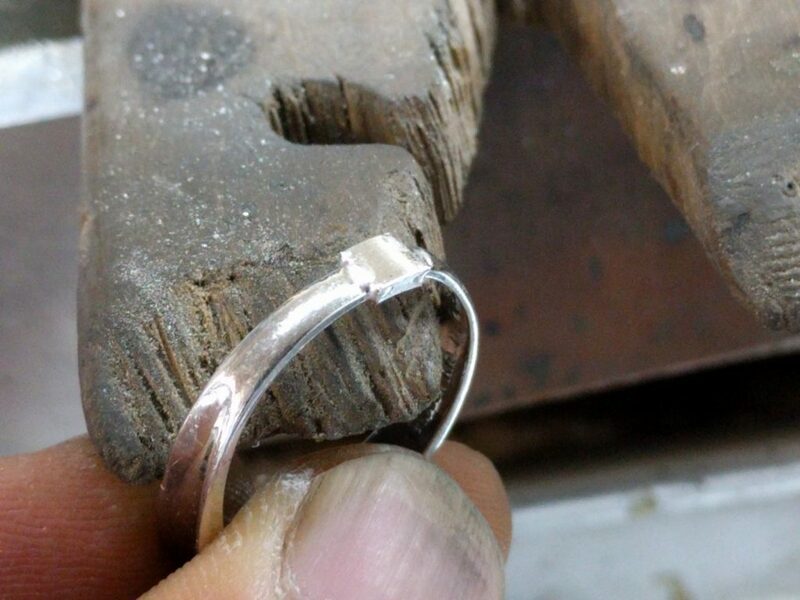 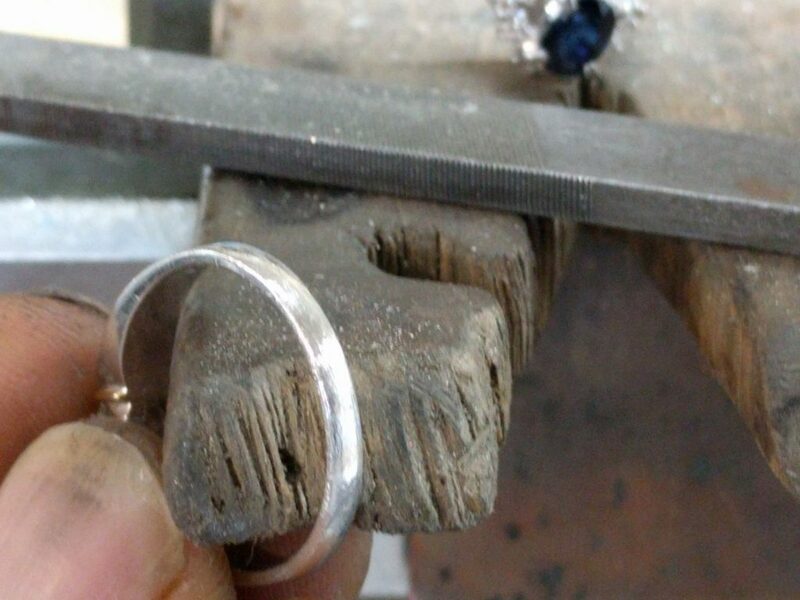 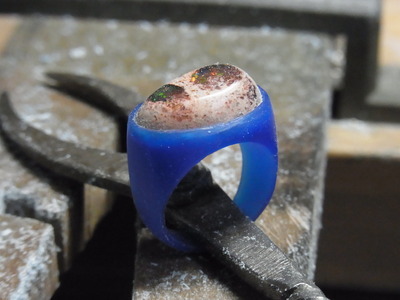 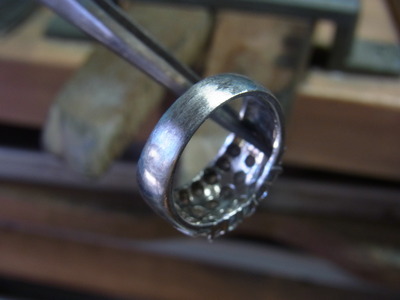 Resizing a ring is completed! 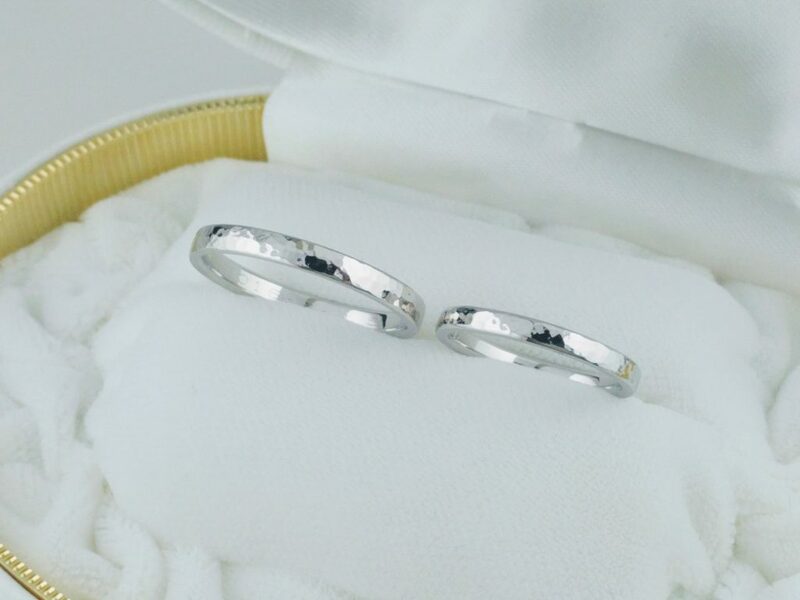 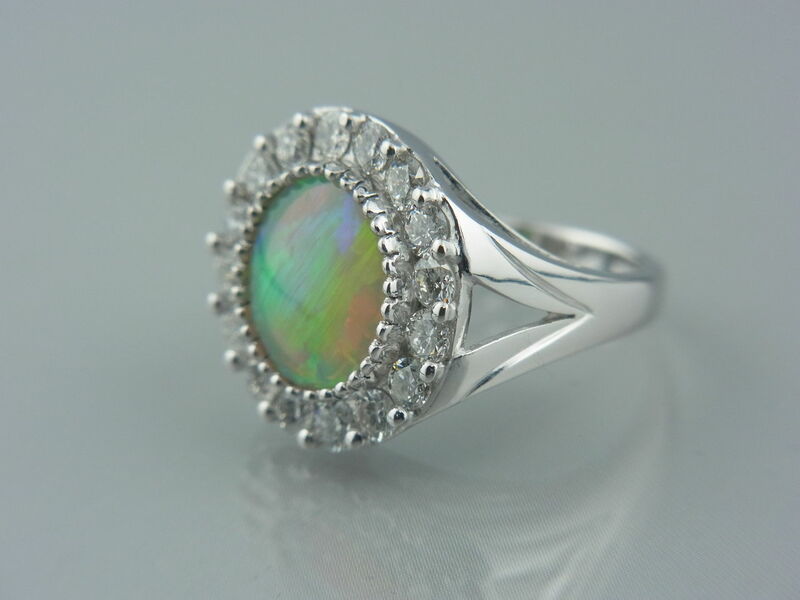 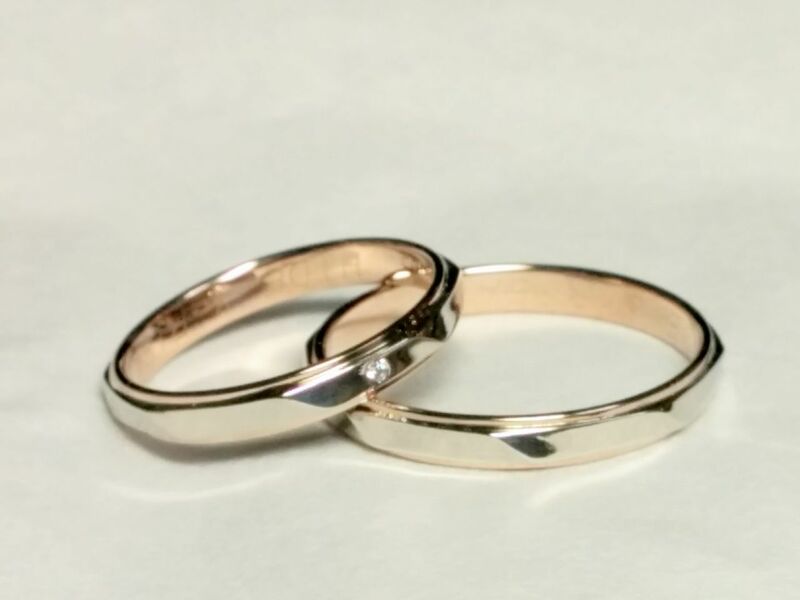 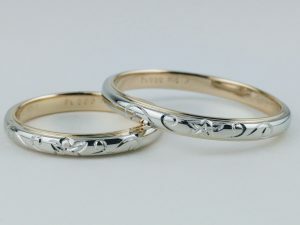 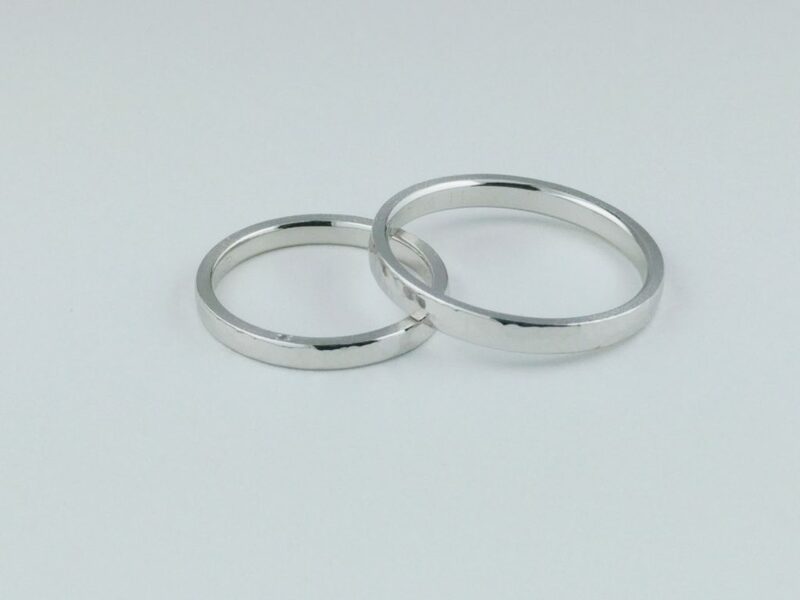 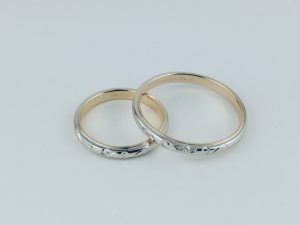 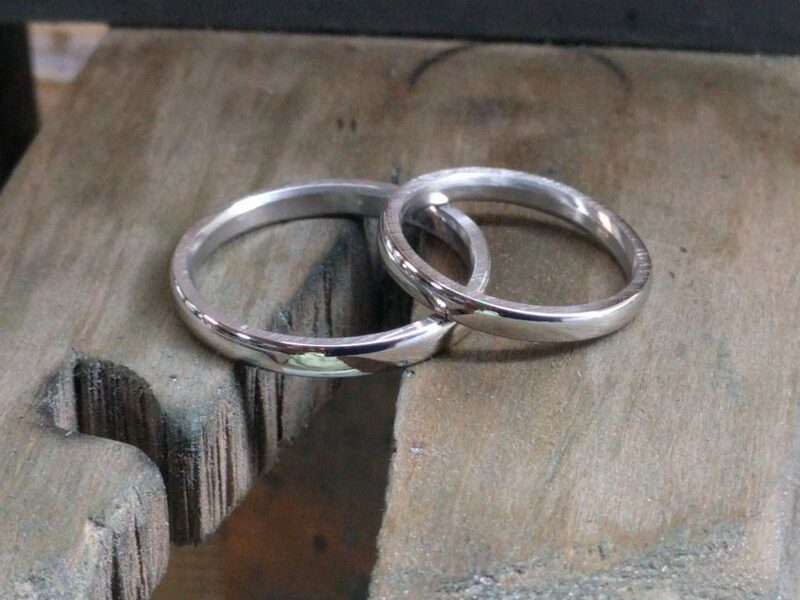 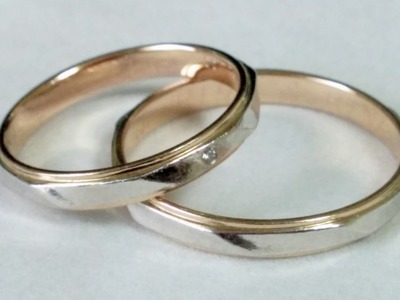 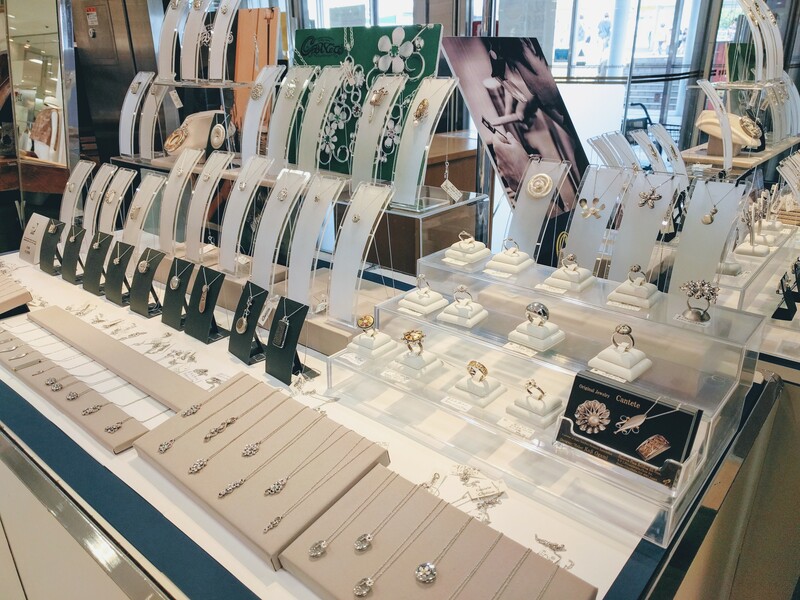 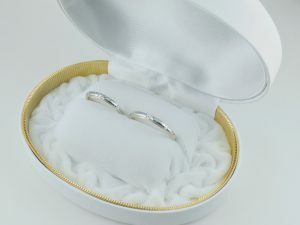 If you have rings you couldn’t put on, please get in touch with Cantete. 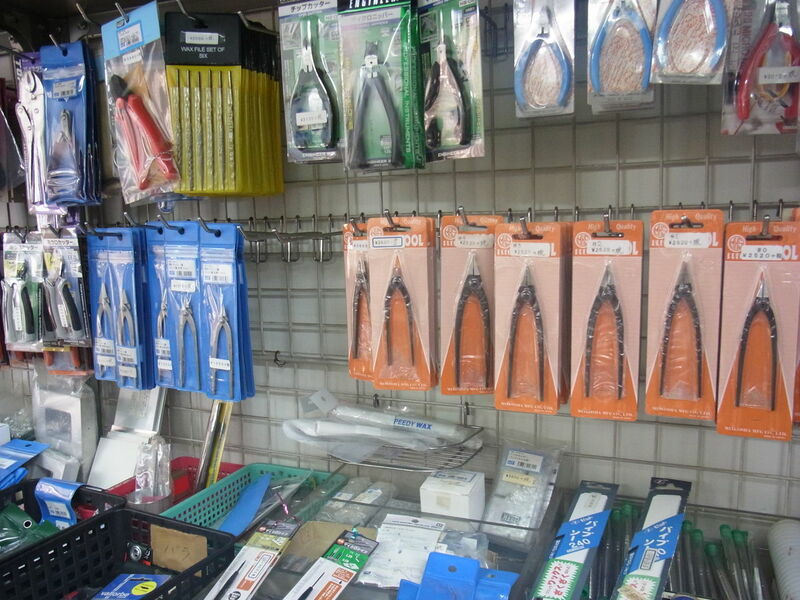 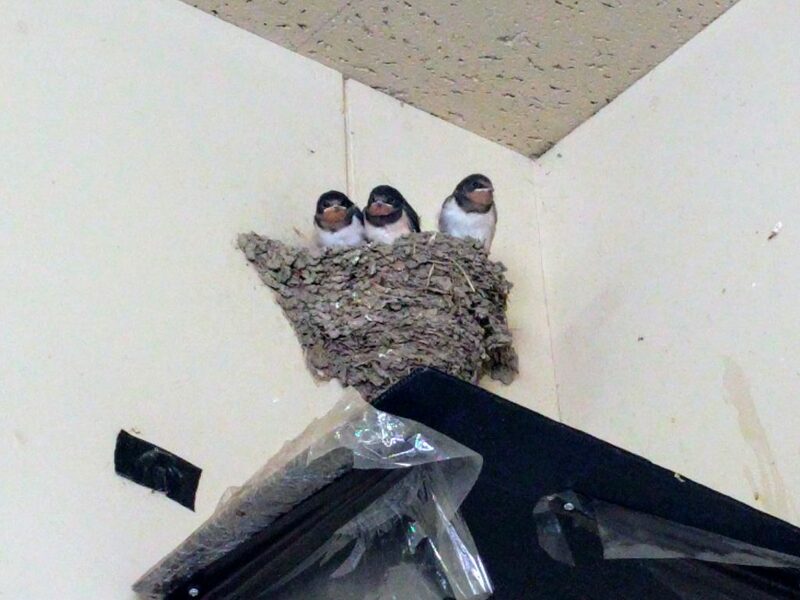 I found a convenience at DIY store. 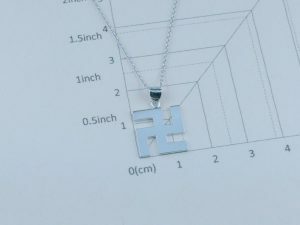 I couldn’t decide whether to purchase it. 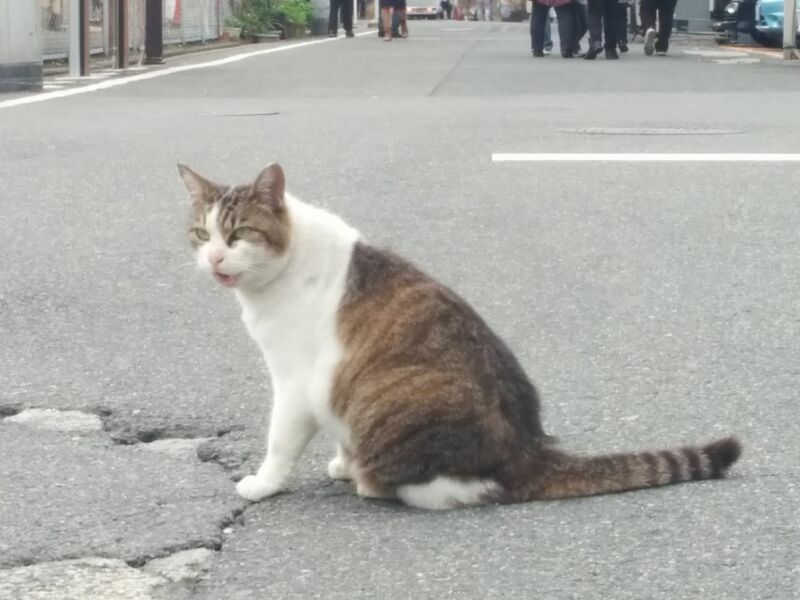 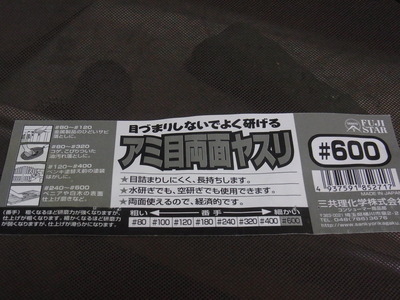 But fortunately,it was right to purchase it. 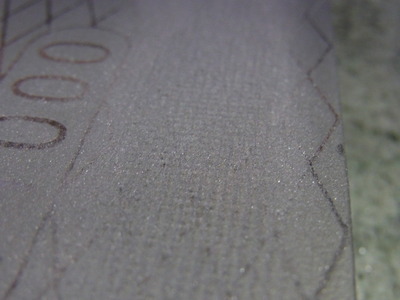 This abrasive paper is reticulated. 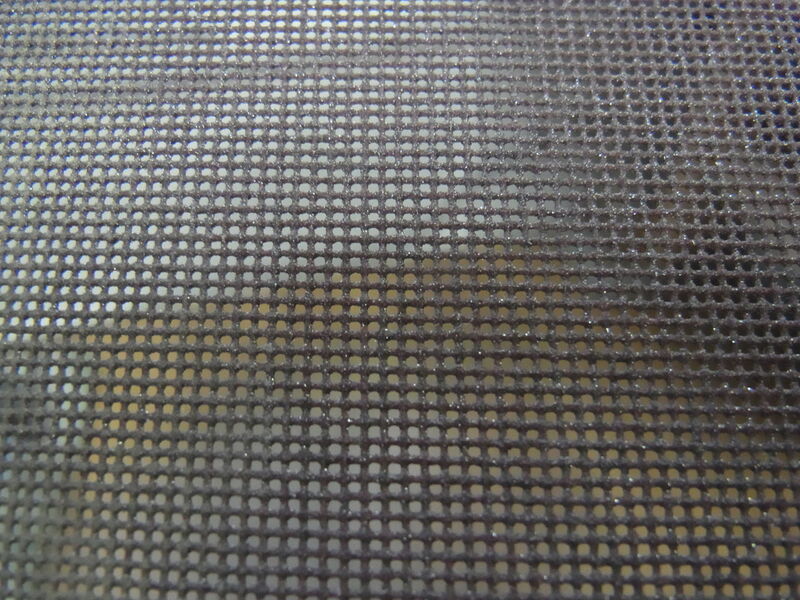 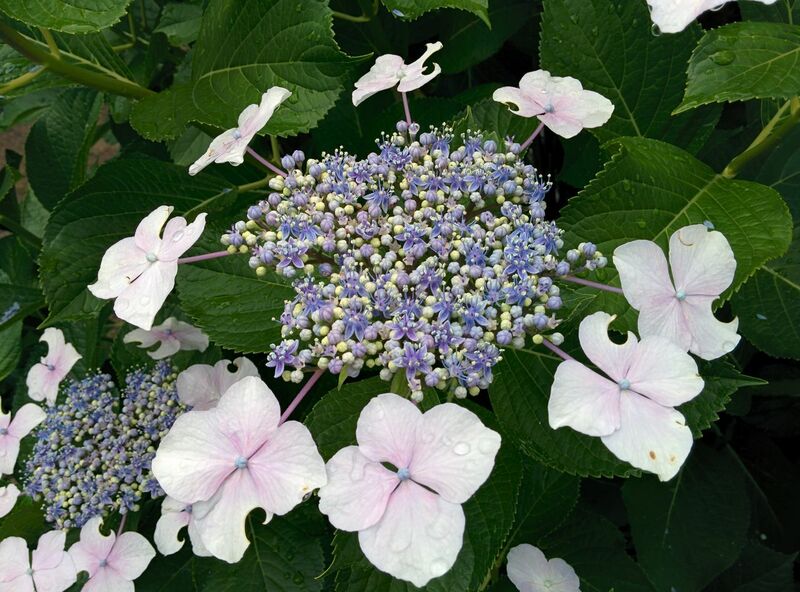 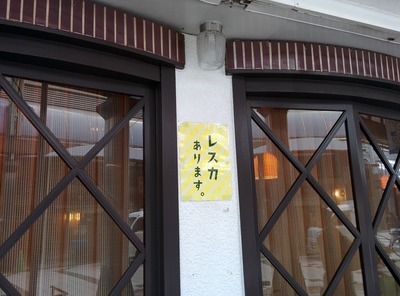 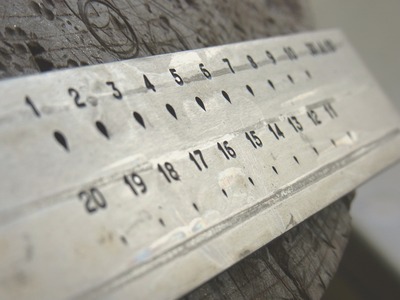 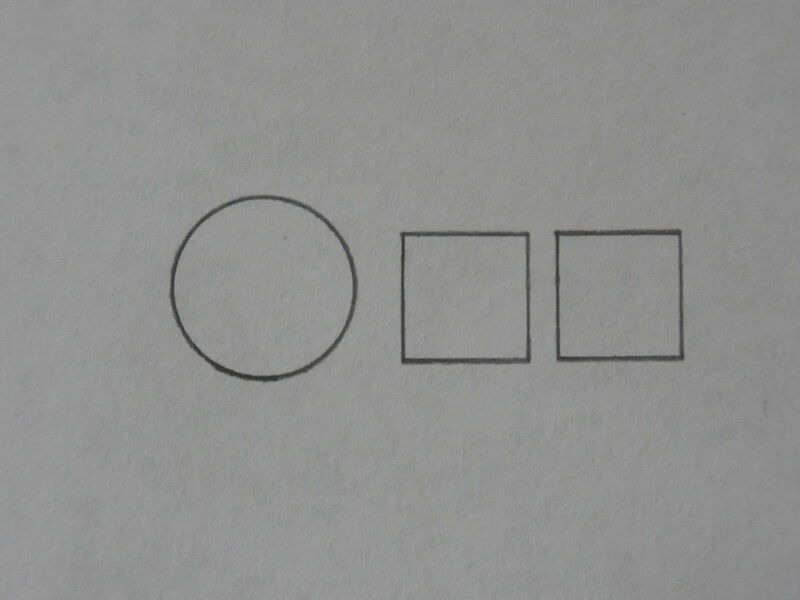 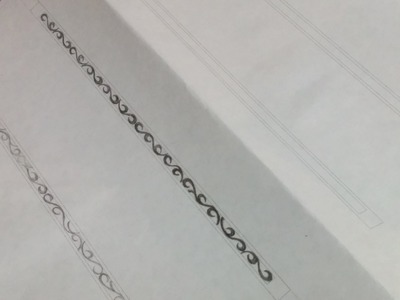 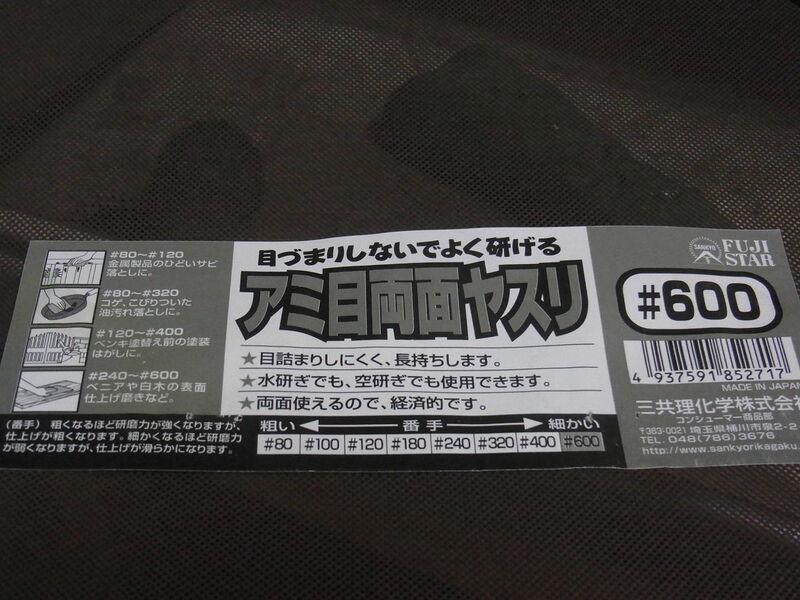 How to use is the same as ordinary abrasive paper. 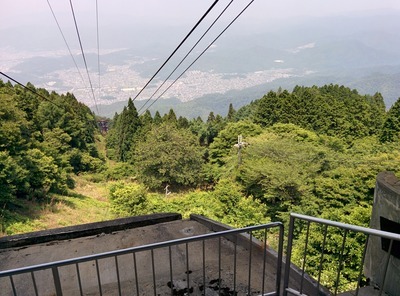 No clogging and powderd matal falls a lot. 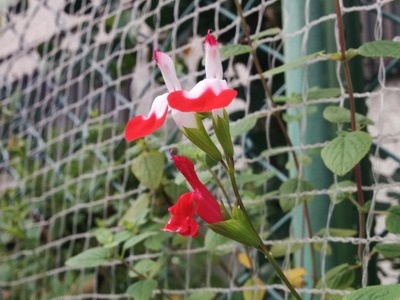 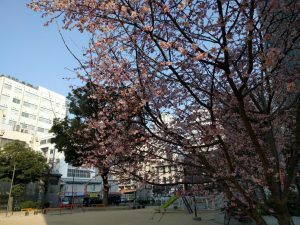 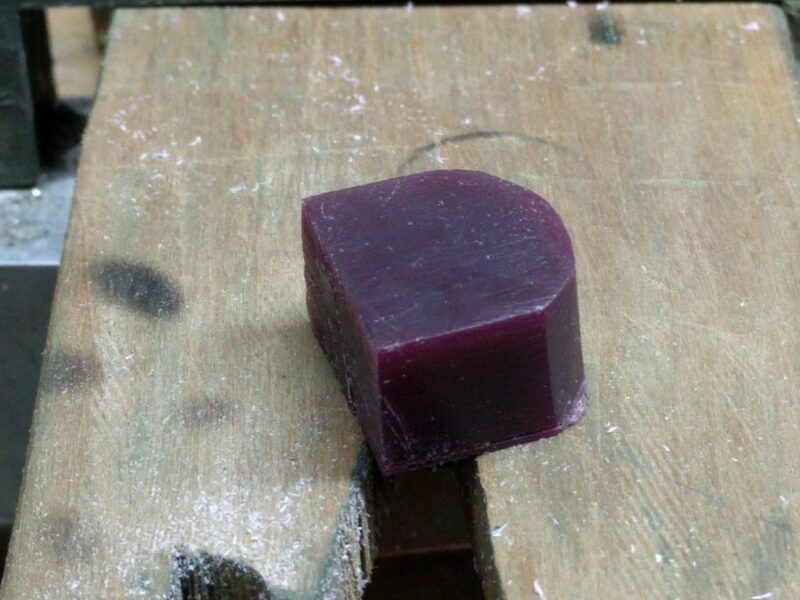 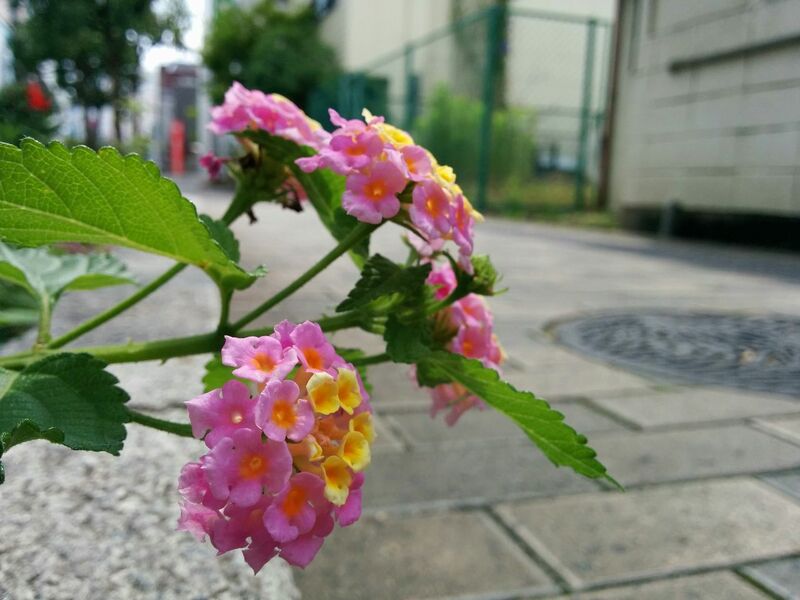 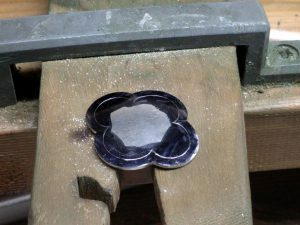 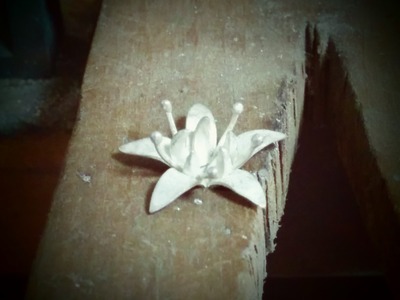 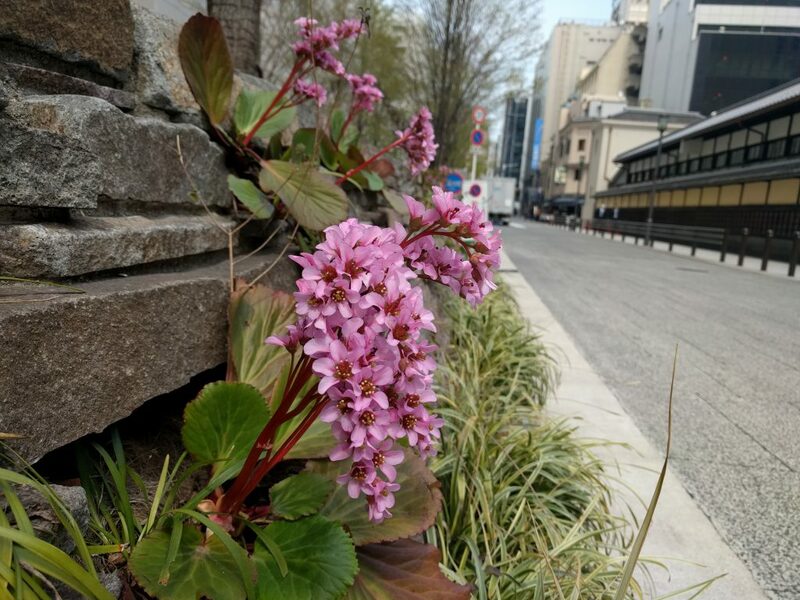 花のパーツを作る Making a flower parts. 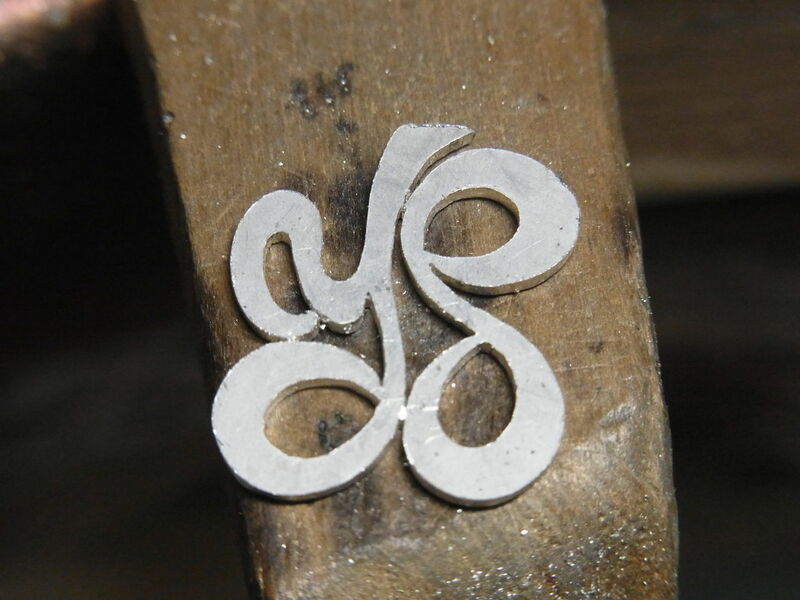 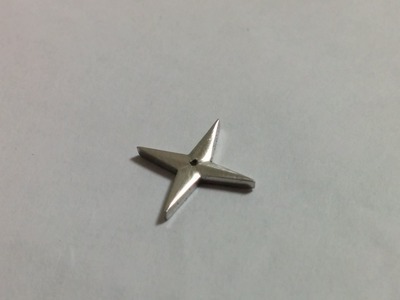 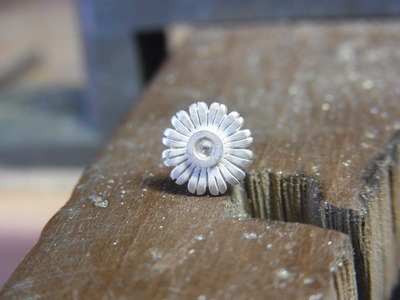 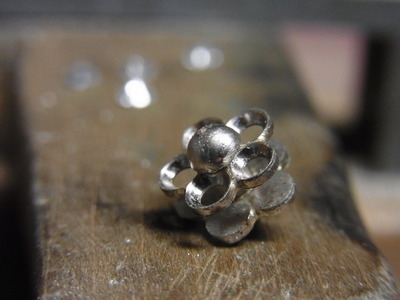 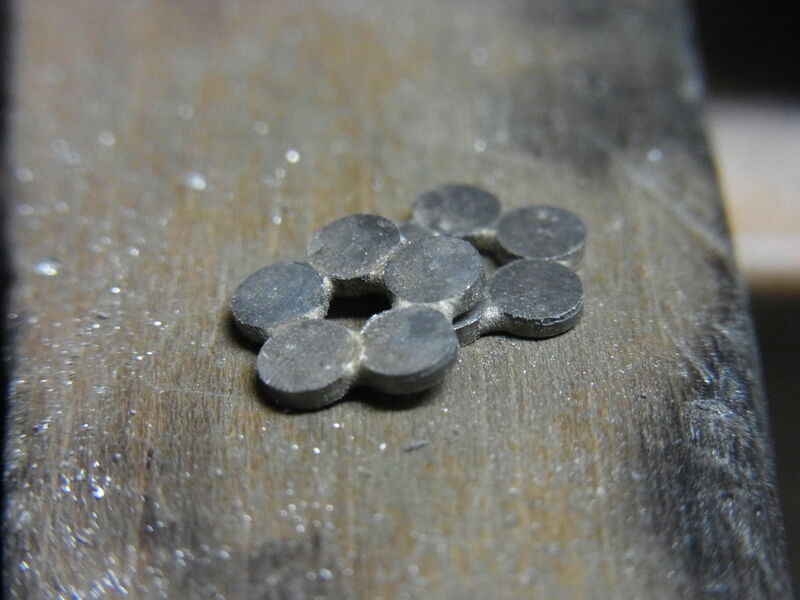 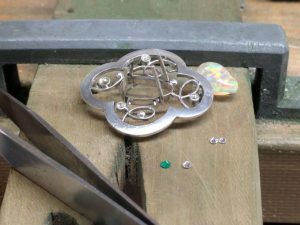 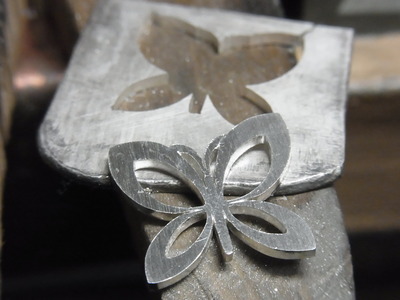 I was making a silver flower parts. 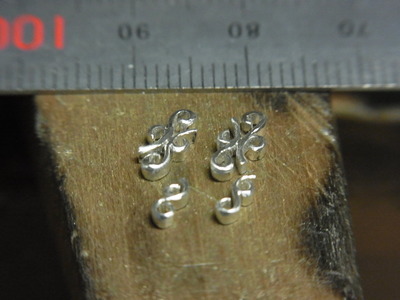 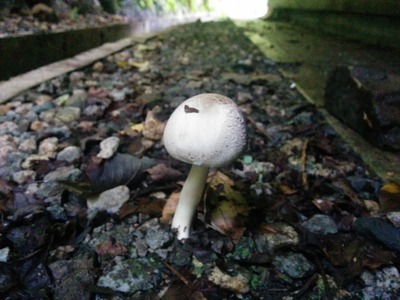 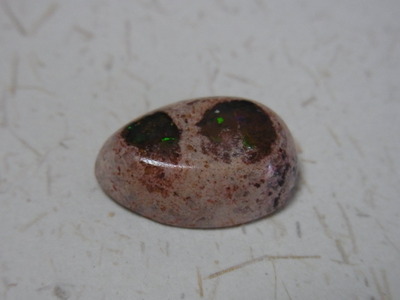 The size is about 6mm. 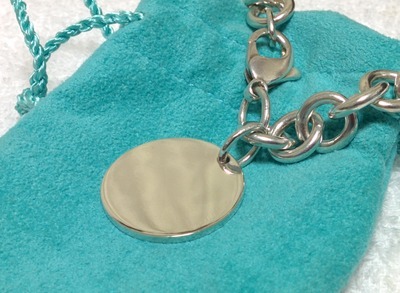 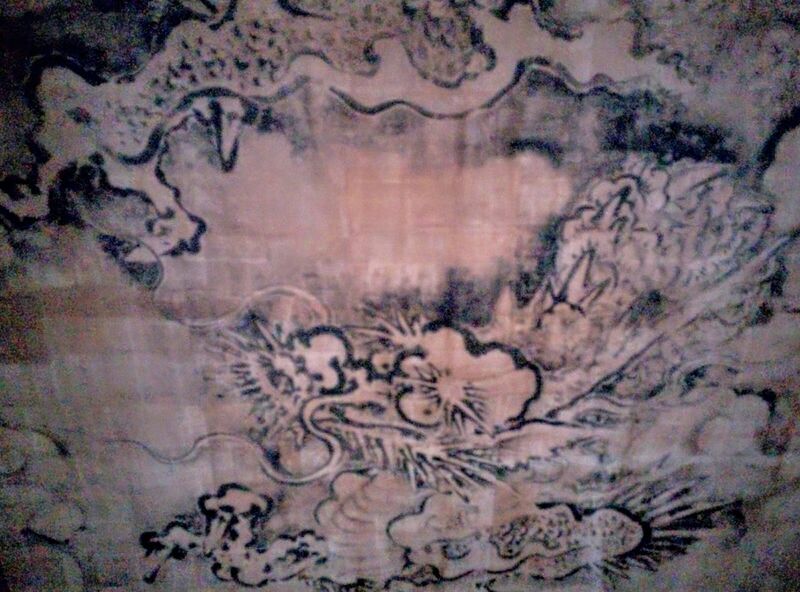 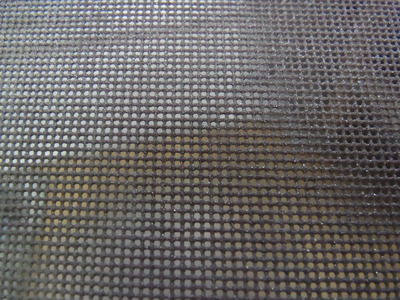 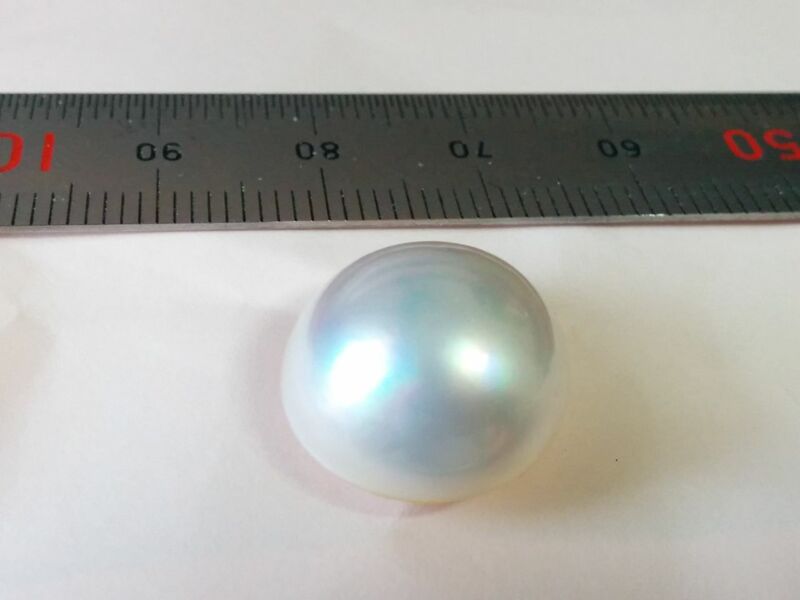 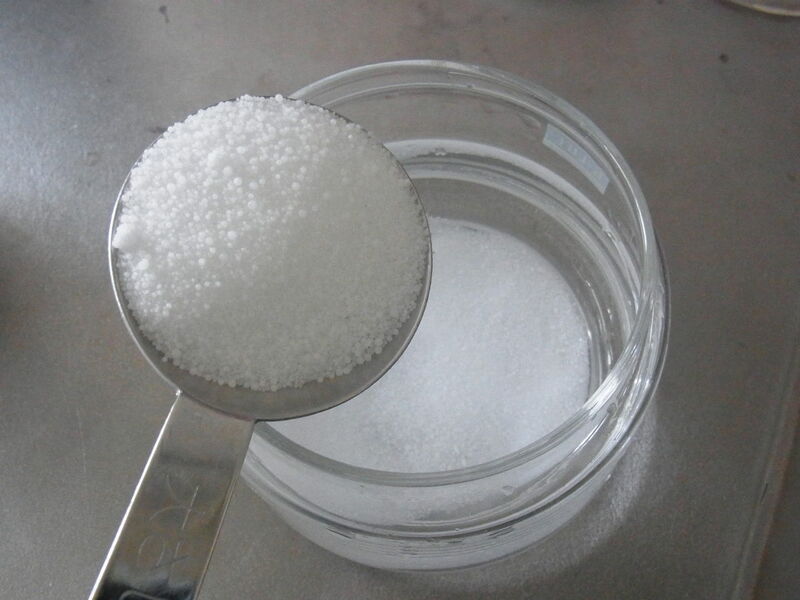 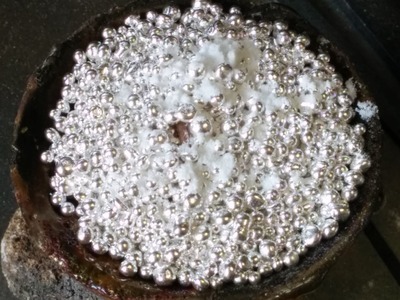 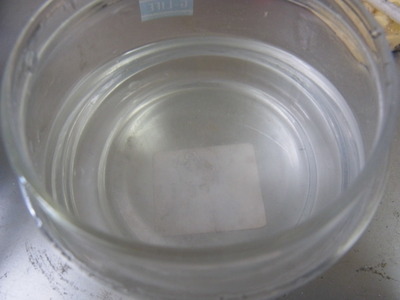 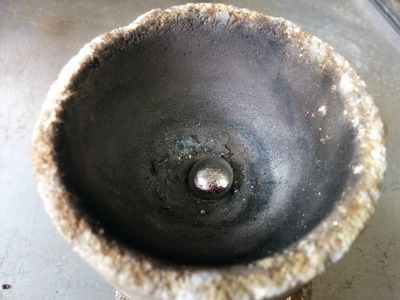 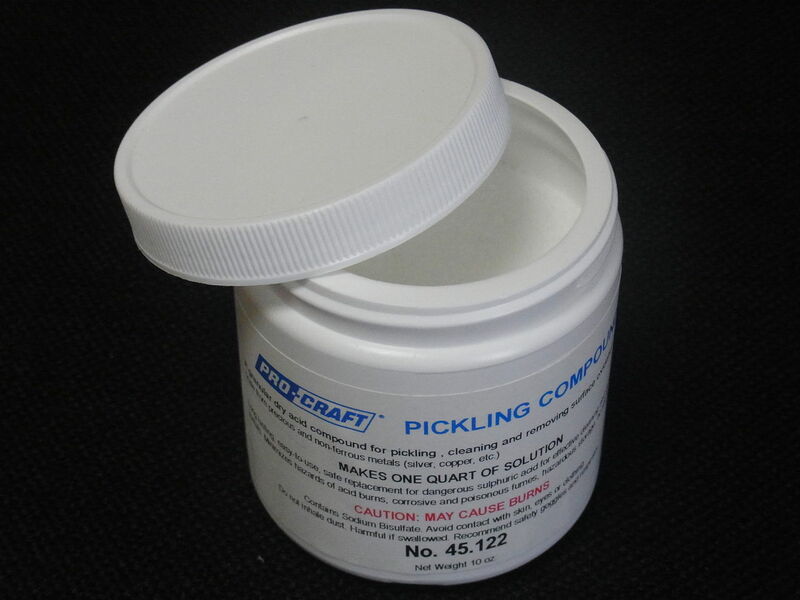 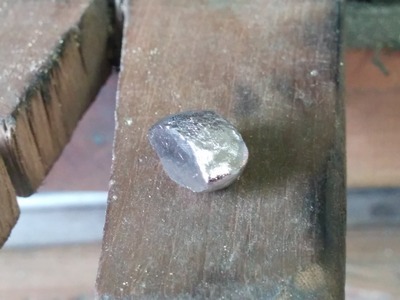 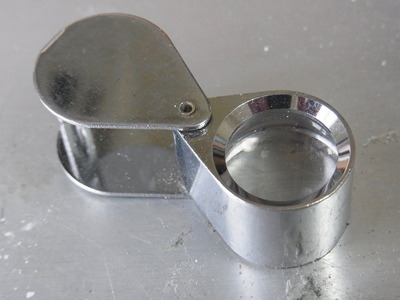 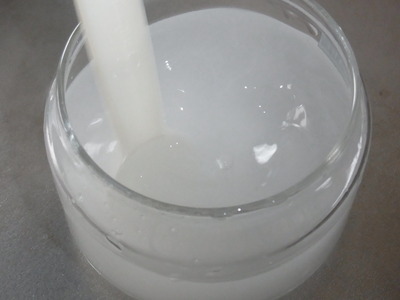 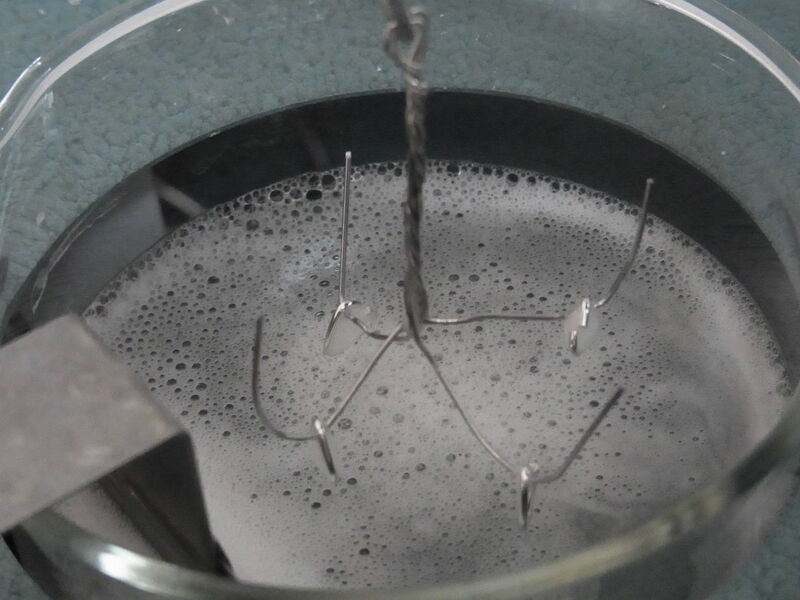 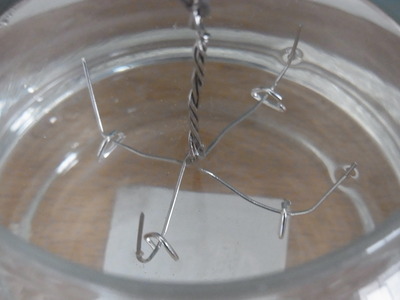 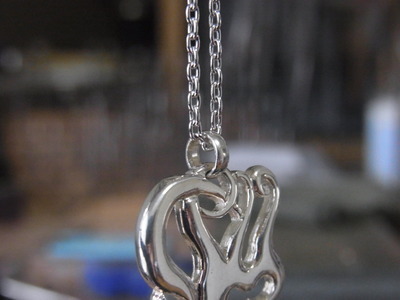 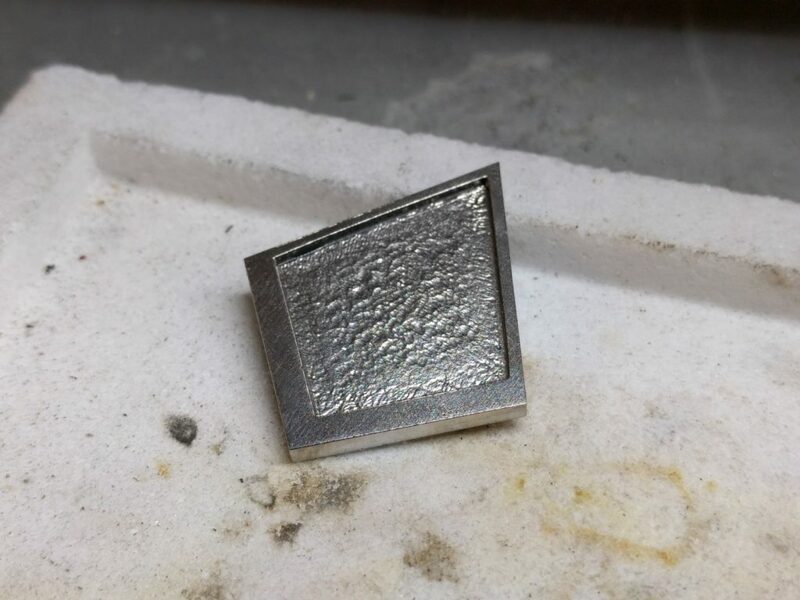 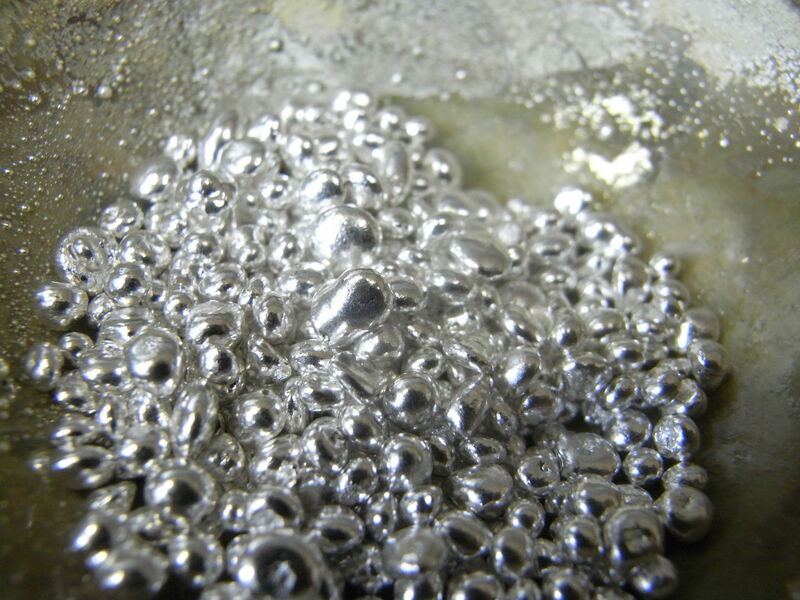 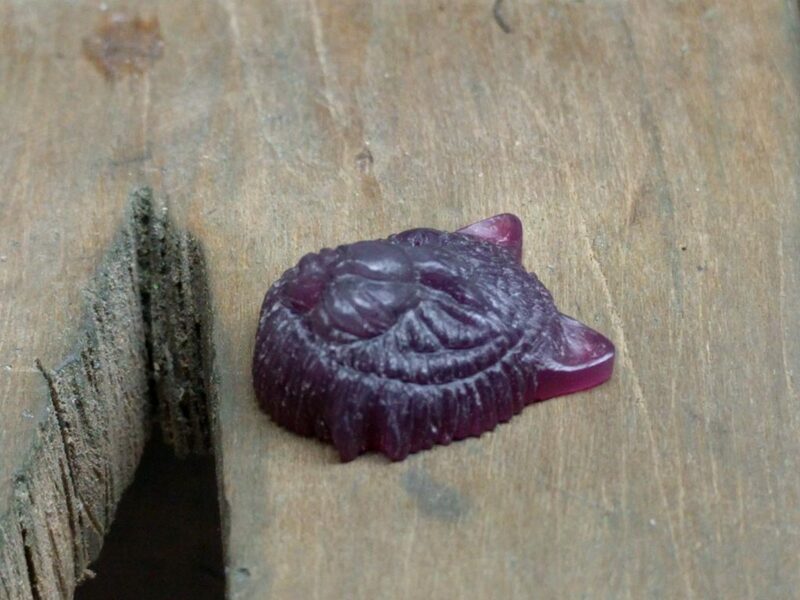 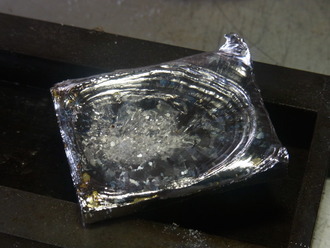 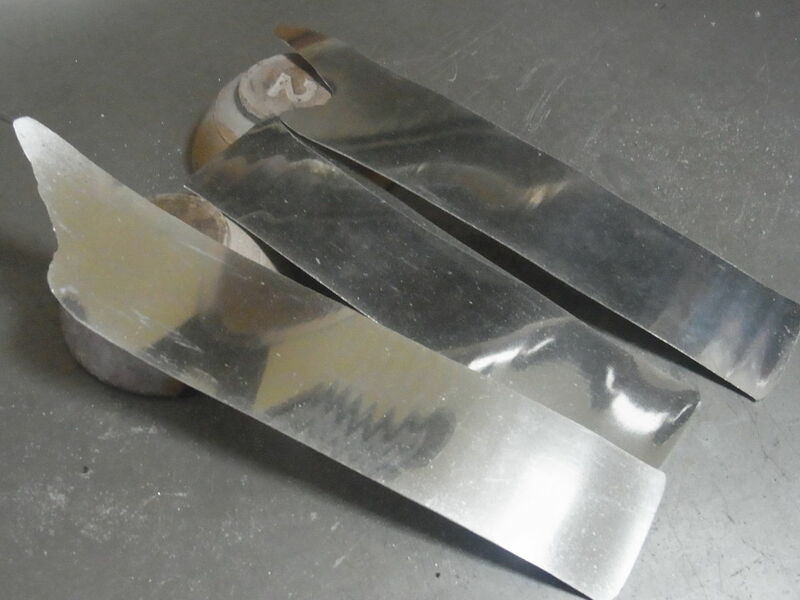 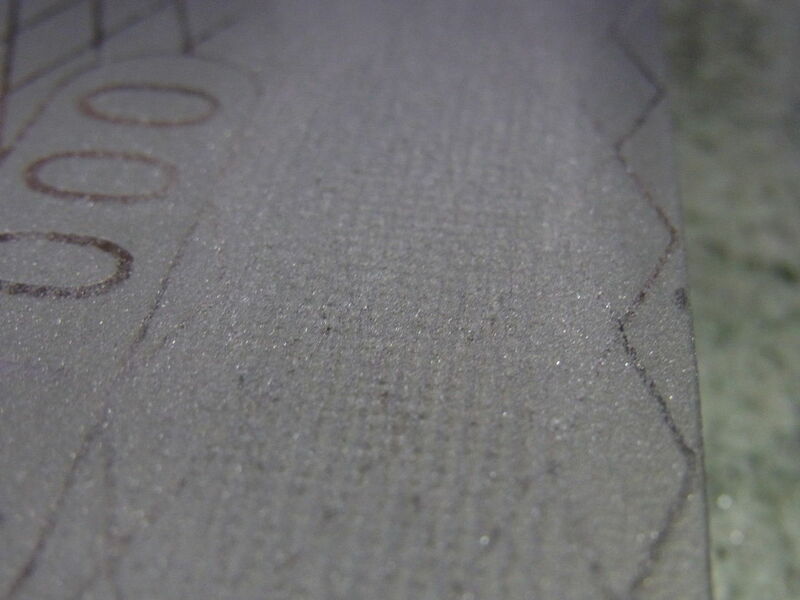 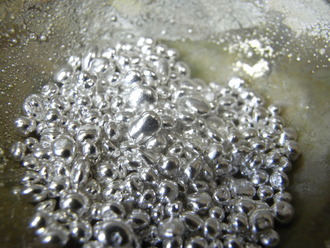 Because of immediately after acid cleaning,silver surface is white.